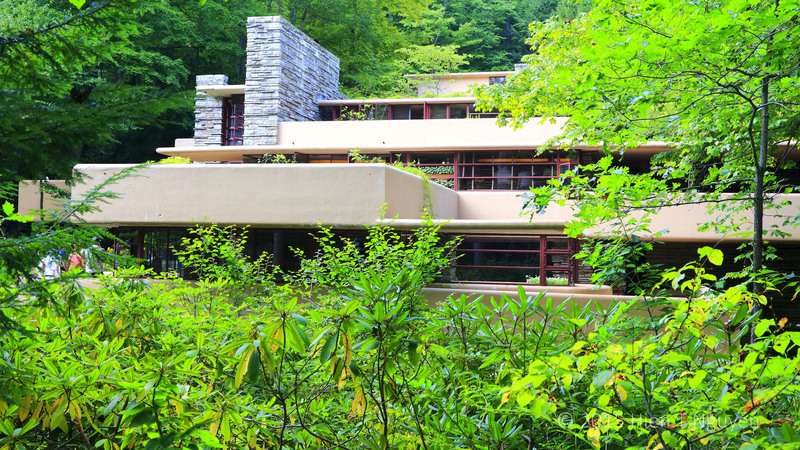 View of Frank Lloyd Wright’s Falling Water house in Mill Run, PA. 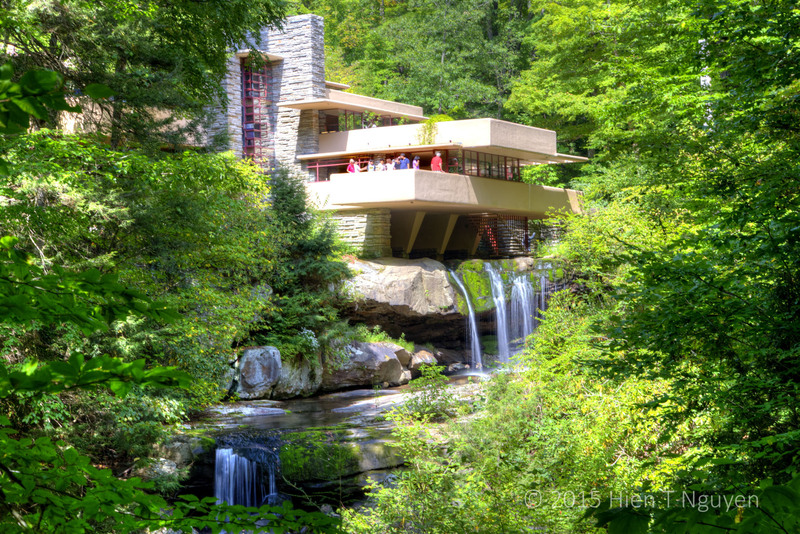 Falling Water house in Mill Run, PA. This is a more classic view. 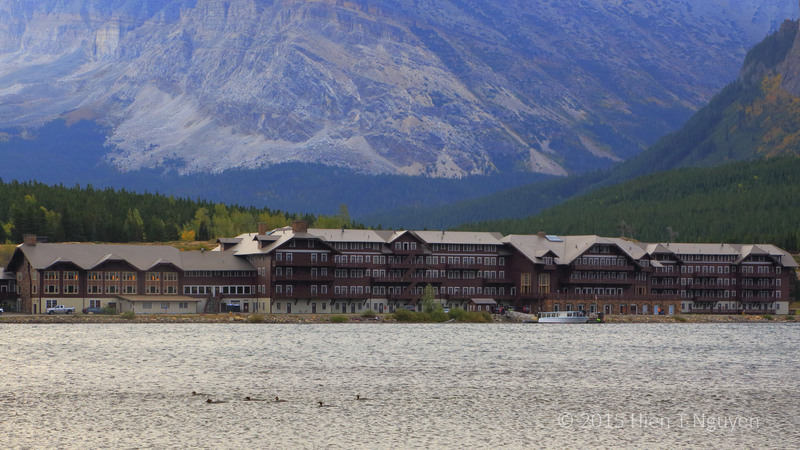 Many Glacier hotel in Glacier National Park, Babb, MT. 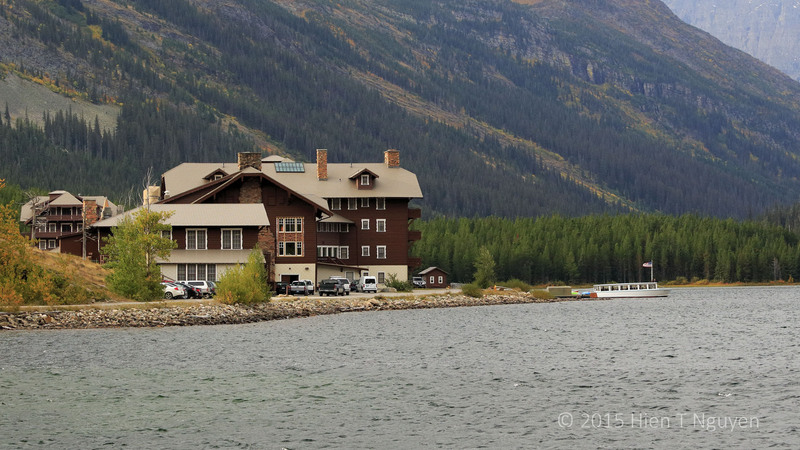 Side view of Many Glacier hotel in Glacier National Park, Babb, MT. 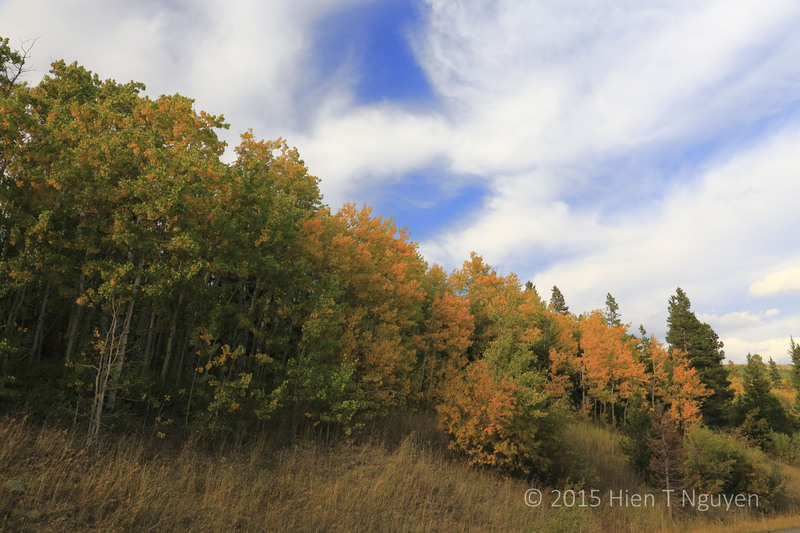 During my recent road trip, Aspen trees were a familiar sight at Glacier National Park, Mt Rainier National Park, Great Basin National Park, and on the side of Highway 145 from Montrose to Cortez, CO. 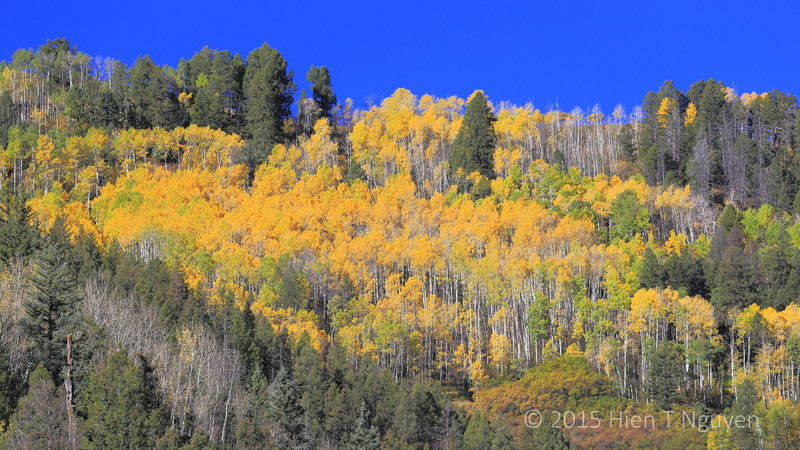 It was impossible to miss them as whole swaths of yellow Aspens ran up almost to the top of some mountains. 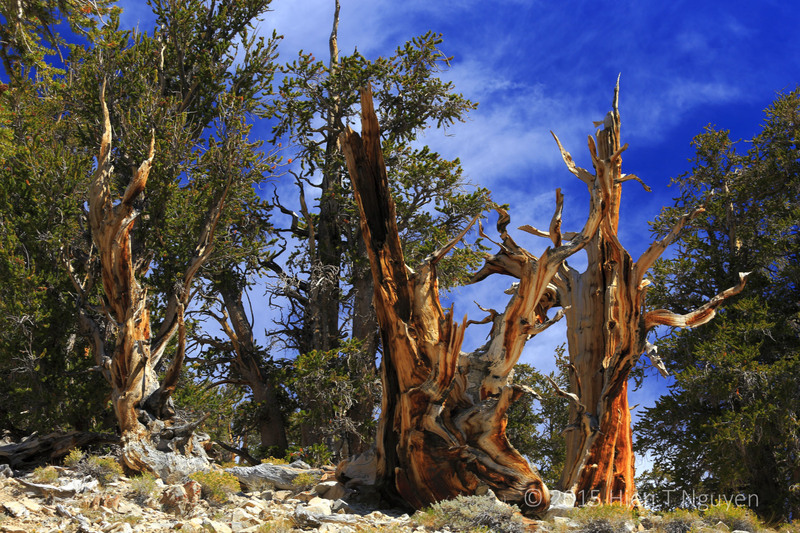 These trees can grow at elevations ranging from 5,000 ft (1,524 m) to 12,000 ft (3,657 m). Their leaves are heart-shaped and attached to branches by long, slender stalks (petioles), which make the leaves flutter at the slightest breeze, hence their name: Quaking Aspen. That also makes photographing these trees difficult when it is windy, for then the quaking leaves become just blurry smudges on a photo. 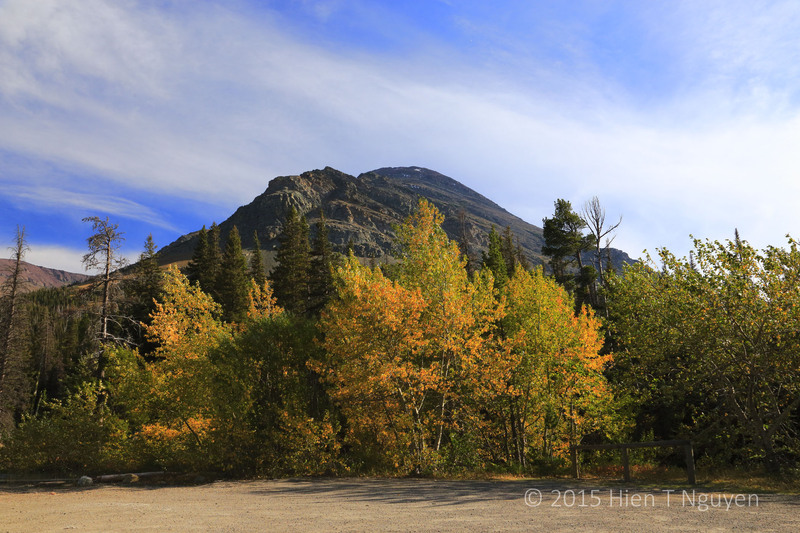 The first Aspens I saw were at Glacier National Park in Montana, along the way to Two Medicine lake. It was early September and some trees were just beginning to turn yellow. Aspens by the road leading to Two Medicine lake at Glacier National Park. Note the heart shape of the leaves. Aspens by the road leading to Two Medicine lake in Glacier National Park. 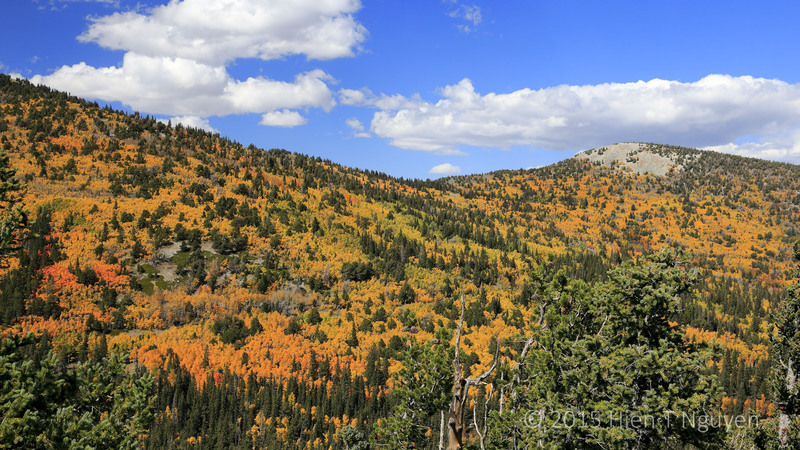 Two weeks later, at Great Basin National Park in Nevada, Aspens were literally covering the mountain slopes along Wheeler Peak Drive. 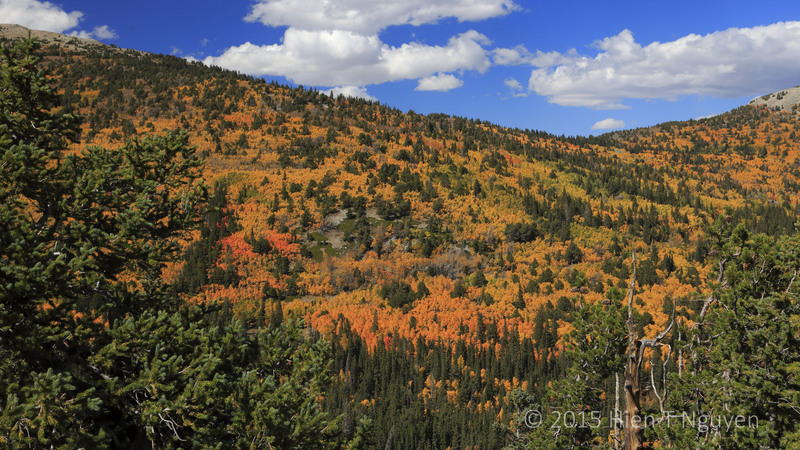 Aspens covering mountainside as seen from Wheeler Peak Bristlecone Pine Grove, at about 10,000 ft (3,048 m). 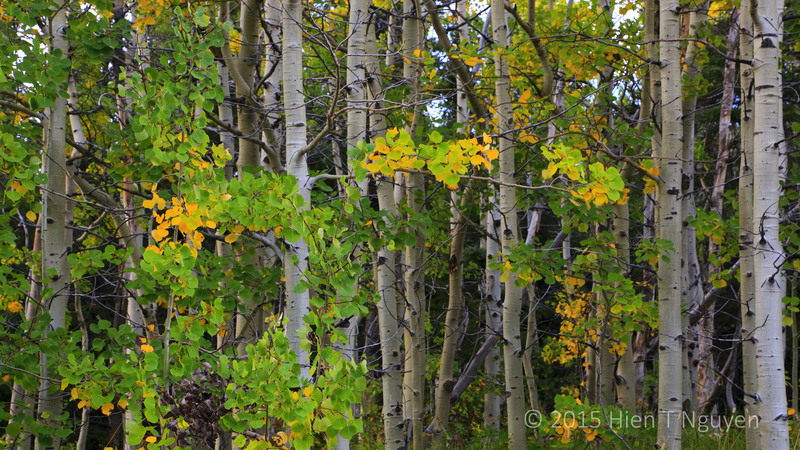 Aspens were lining up both sides of the hiking trail leading to Wheeler Peak Bristlecone Pine Grove. Stand of aspens by trail to Wheeler Peak Bristlecone Pine Grove. While the above photo shows trees distinct from one another, all of them may actually be clones from one tree. 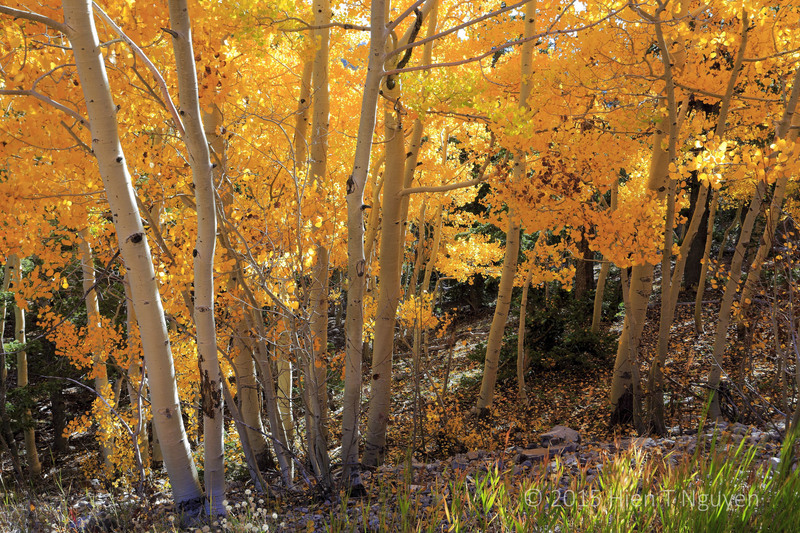 Trees usually grow from seeds, but Aspens tend to reproduce from root sprouts. Because of that, Aspen groves are resilient and regrow quickly after a forest fire, though individual trunks normally only live about 150 years. However, the root system continues to be alive and new sprouts will eventually replace the dead trees. 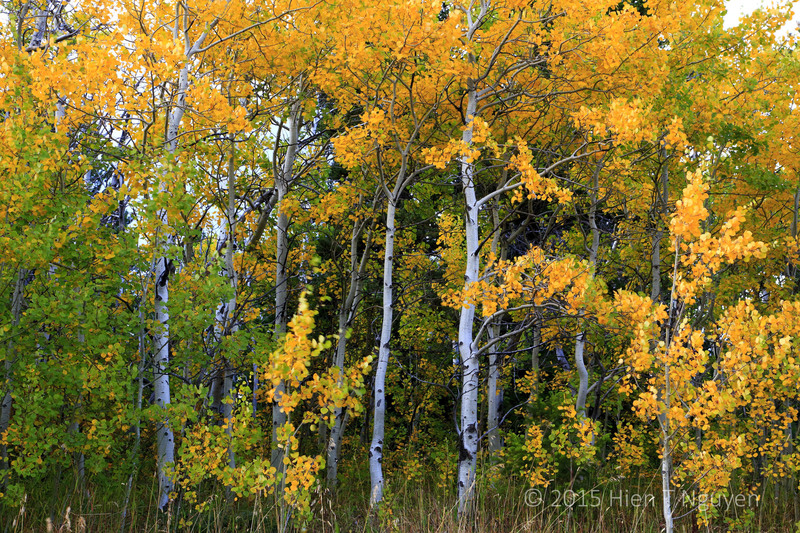 In 1968 a clonal colony of 40,000 Aspens was discovered near Fish Lake in Utah and has been called Pando or The Trembling Giant. By 1992 researchers using DNA techniques declared the Pando clones to be all from one original tree, and the roots to be 80,000 years old. 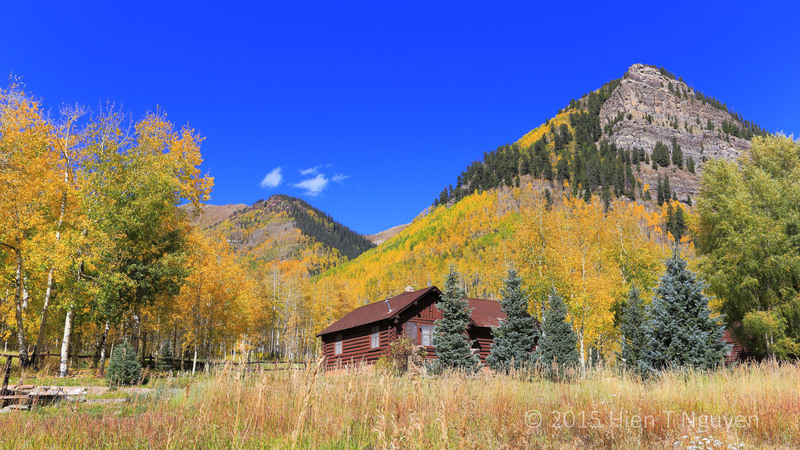 Some even claim that Pando is older, perhaps as much as 1 million years old. 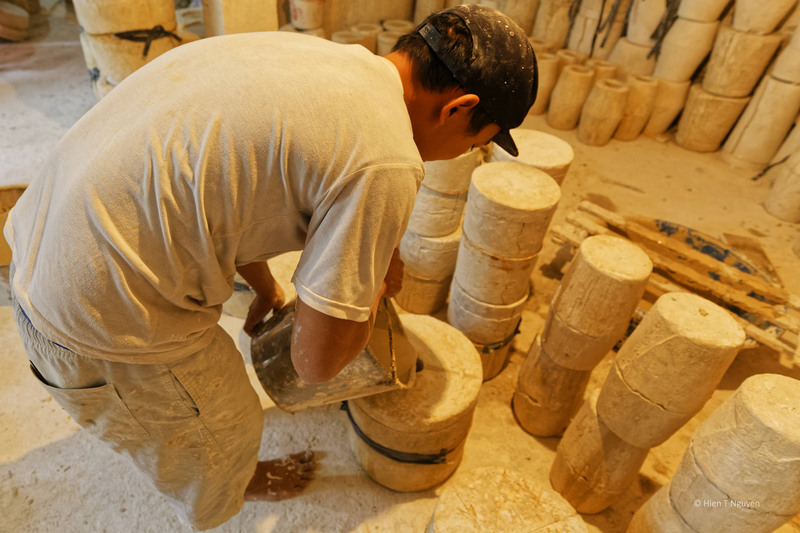 Pando covers 106 acres (43 hectares) and is said to weigh 13,000,000 pounds (6,000 tonnes). I did not drive by Fish Lake this time, but the following shots will give you an idea of what these Aspen clonal colonies look like. Aspens along Highway 145 near Rico, CO.
Yellow Aspens on the slopes of Wilson Peak near Telluride, CO.
Pinyon Pines grow in the states of Colorado, Utah, Arizona, and New Mexico. So it was no coincidence that during my recent road trip I took a good number of photos of these trees, sometimes without intending to do so. 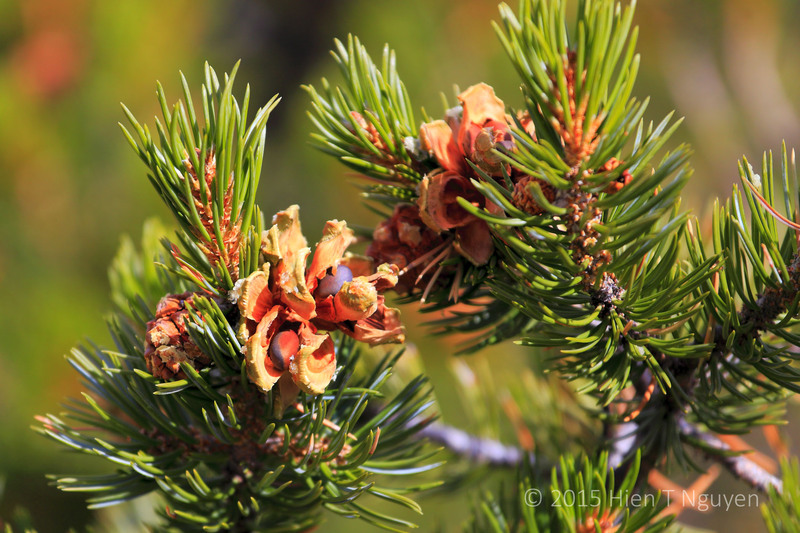 The nuts from Pinyon Pines have been harvested by Native Americans for thousands of years up to the present day, and have been a providential part of their diet especially when game was scarce and other crops were not doing well. 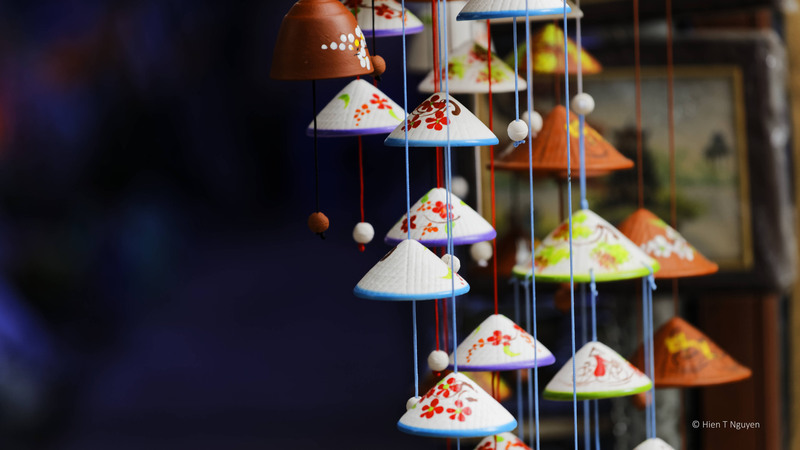 Pine nuts are a good source of protein, fat, and fiber, all essentials nutrients for humans. 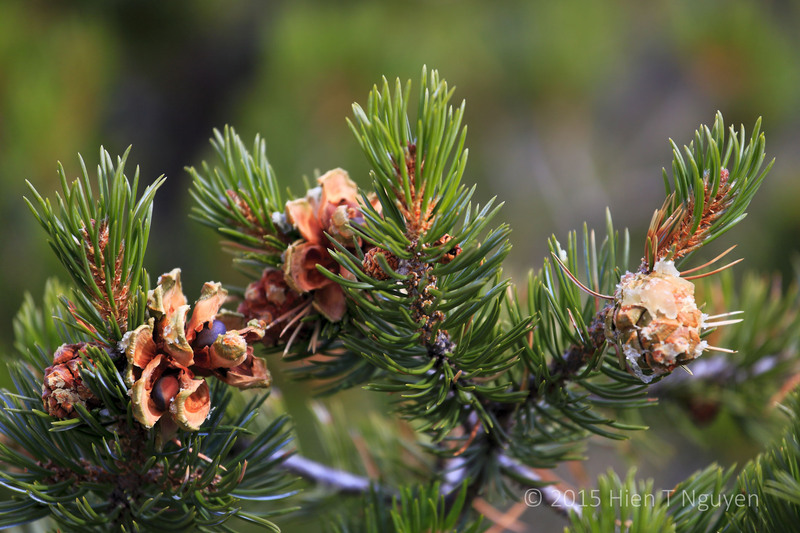 Pinyon Pine Cones and nuts at Great Sand Dunes National Park. 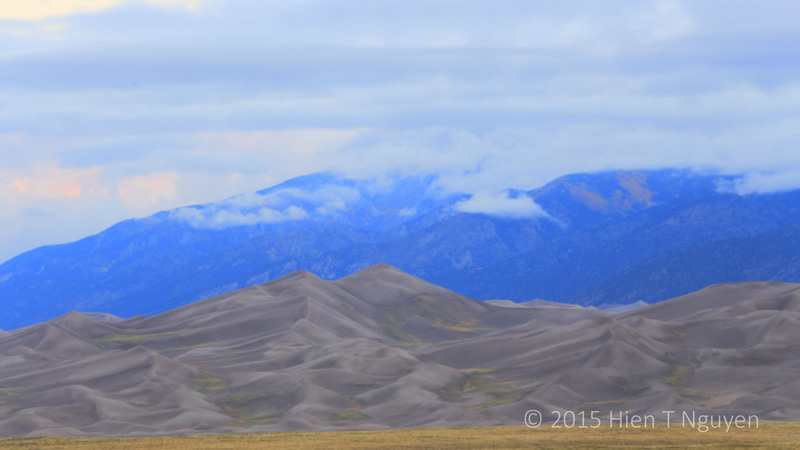 Great Sand Dunes with Pinyon Pines in foreground. Medano Creek , much thinner at this time of the year runs at the feet of the dunes. 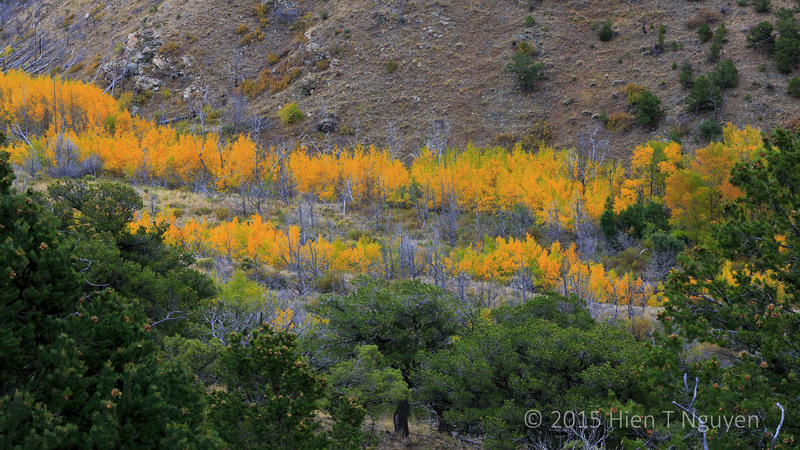 Rows of Aspens with Pinyon Pines in foreground, as seen from Dunes Overlook Trail. 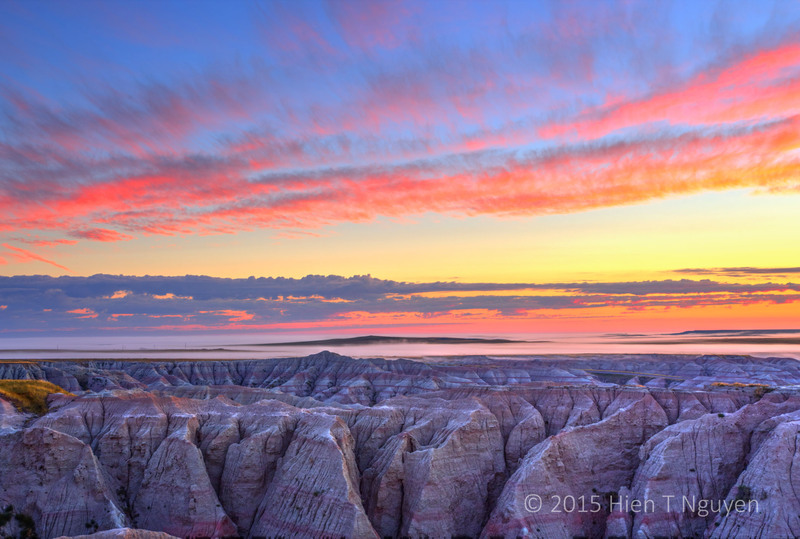 When I saw this sunrise at Badlands National Park during my recent road trip, I knew it was going to be impossible to take only one photo that would take into account the bright and colorful rising sun shining intensely over everything, and the hills that were only a third as bright. 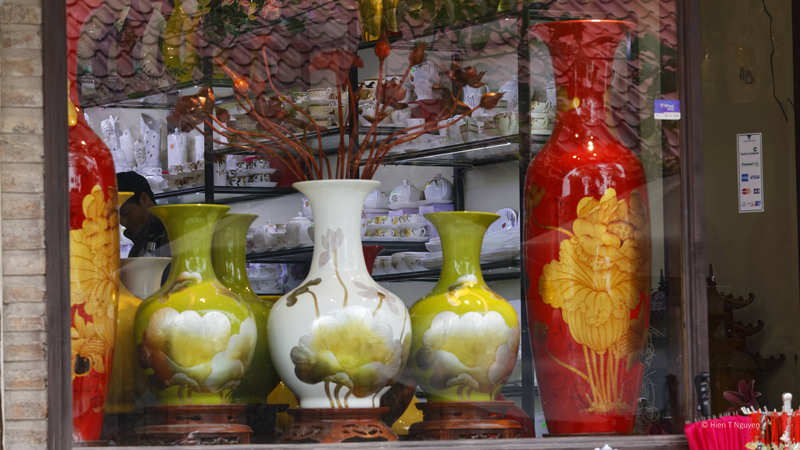 So I took three shots: overexposed, underexposed, and normal. Today, using Photomatix HDR software, I got the following result. 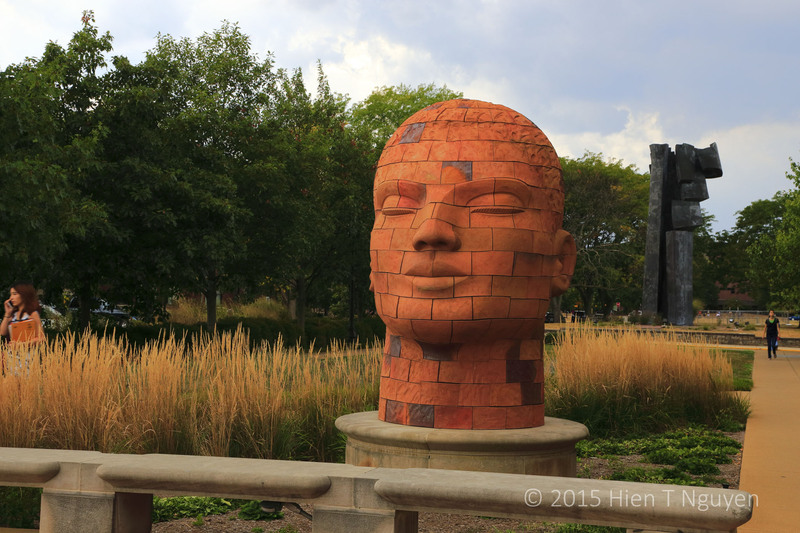 This is the last of the “Additional Photos” posts on the road trip I undertook in September and October. 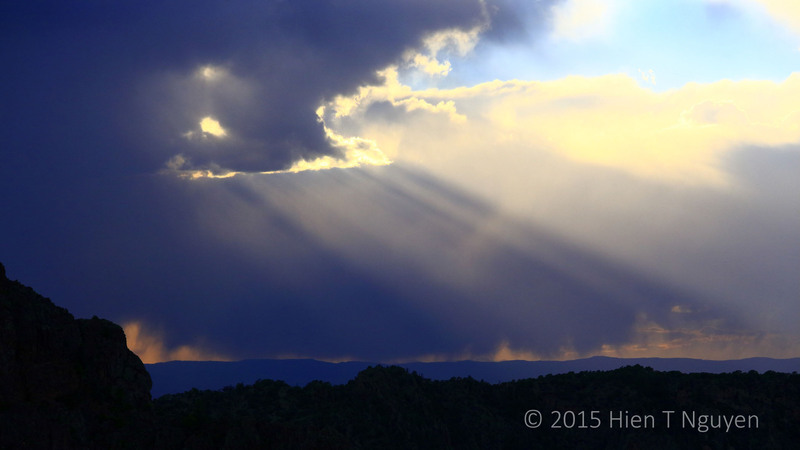 It is fitting that it covers Mesa Verde National Park, near the town of Cortez, CO. 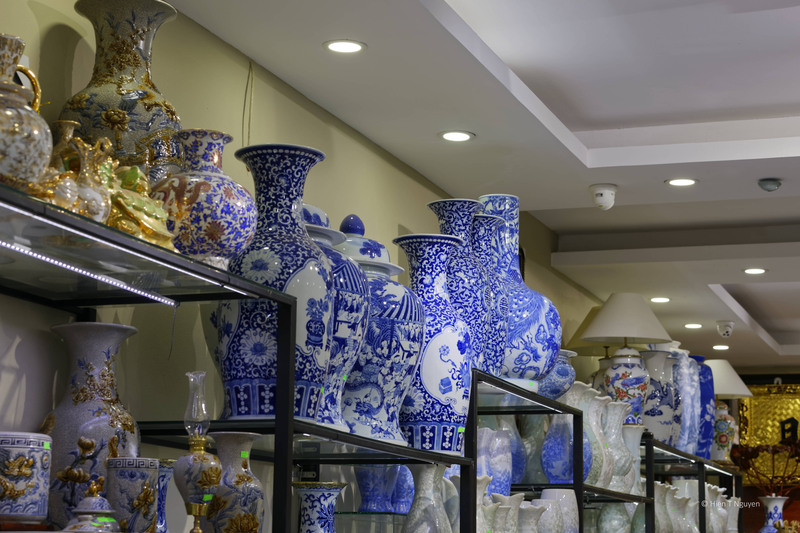 The park is not about scenery but about the fascinating history and archaeology of those who lived in the area before the arrival of the white man and western civilization. 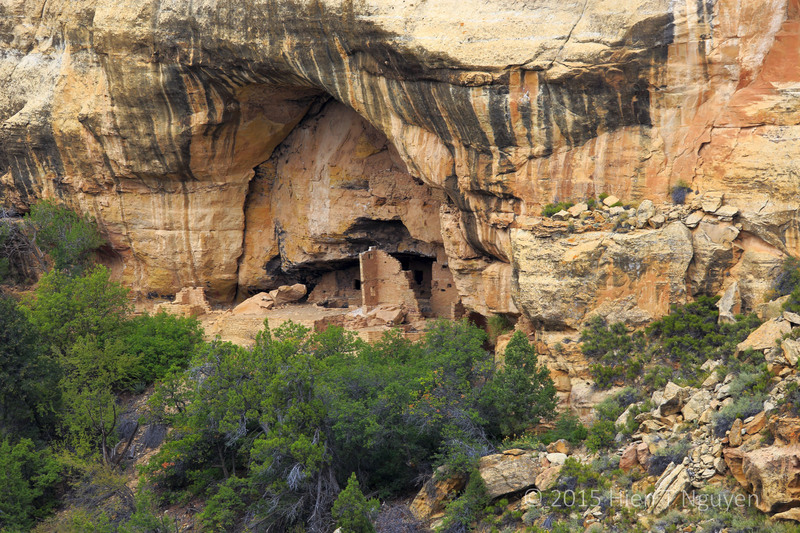 A variety of people have lived for 13,000 years in the Mesa Verde area. They started as small groups of nomadic hunter gatherers, but around 1000 BCE they began cultivating corn to supplement their hunting diet. 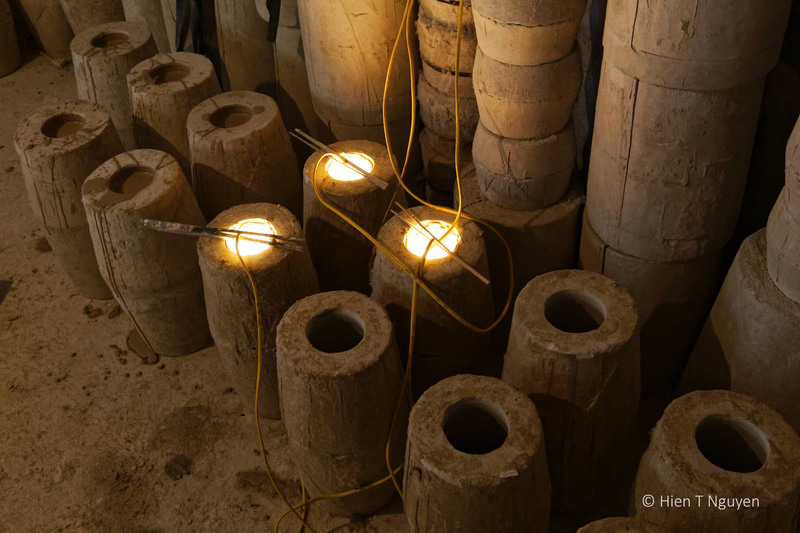 They weaved baskets and dug into the earth to build pithouses. 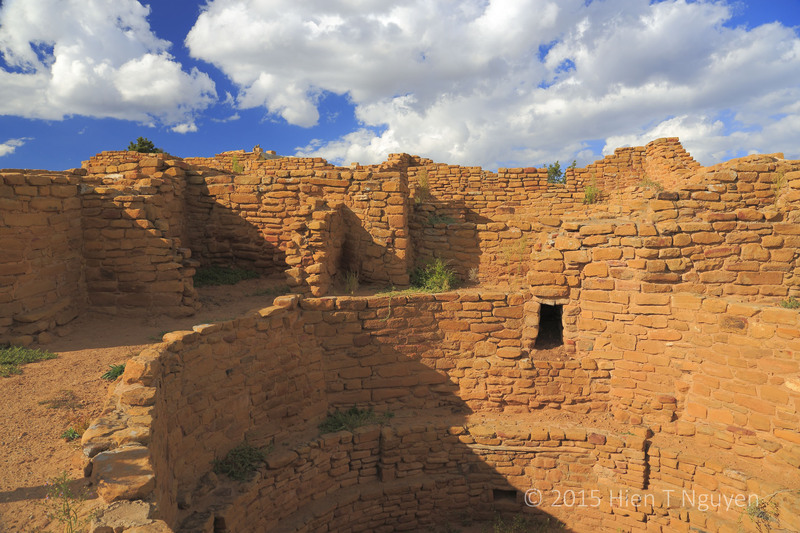 Agriculture allowed population to increase, and by 750 CE the ancestral Puebloans (the politically correct name for the Anasazi) began building entire pueblos above ground with houses, some with many rooms, and kivas or ceremonial rooms. 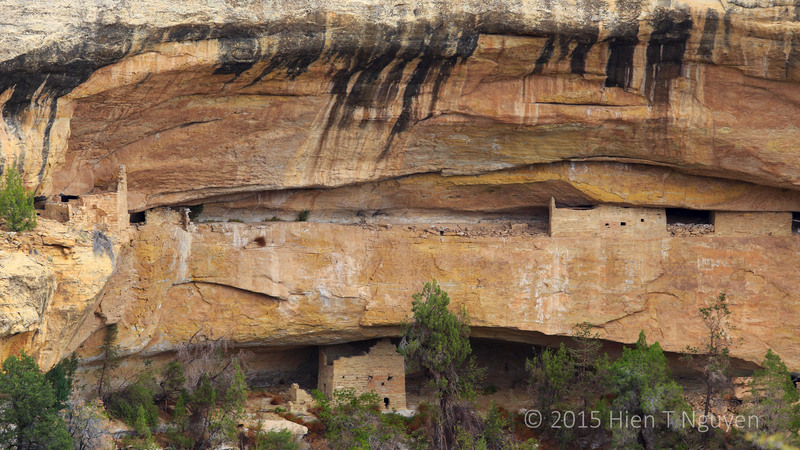 Ruins of above ground communities at Mesa Verde National Park. 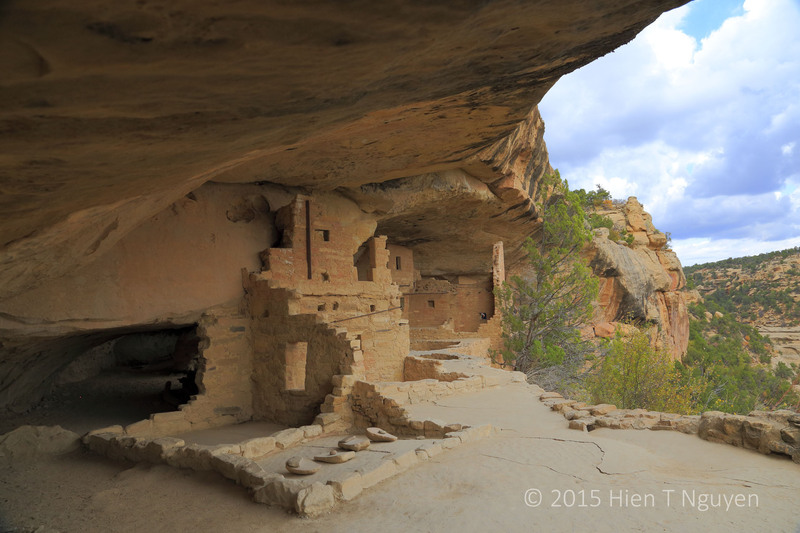 Ruins of Coyote Village with kiva in foreground, Mesa Verde National Park. 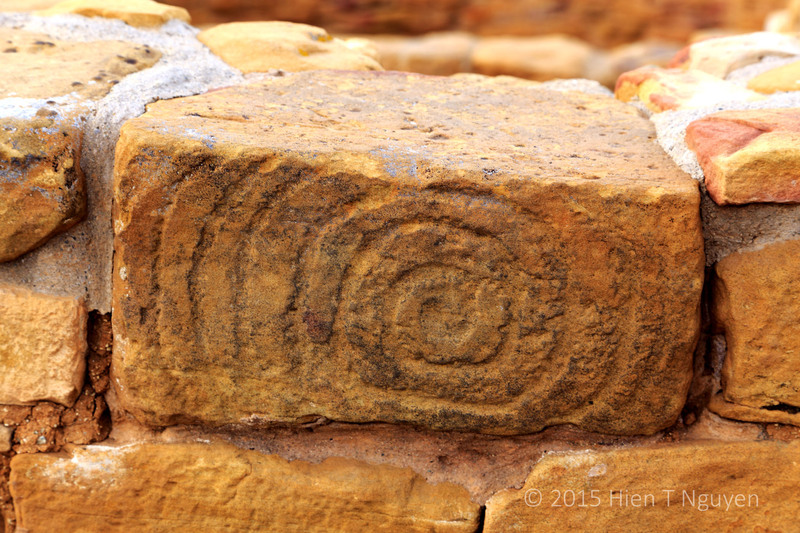 Stone with spiral petroglyph as part of a kiva wall, Mesa Verde National Park. 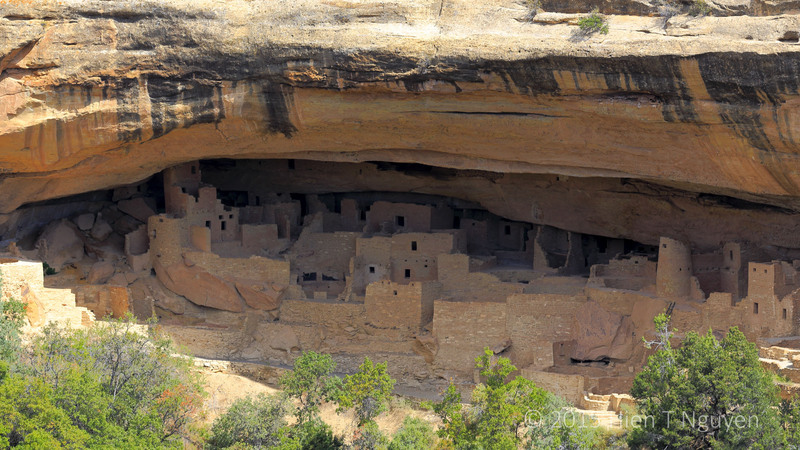 However, Mesa Verde is better known for the cliff dwellings which the ancestral Puebloans did not begin to build until the 12th century. They only lived in those cliff houses for about 100 years, abandoning them at the end of the 13th century, following extended periods of drought that led to warfare and forced people to emigrate or die from starvation. 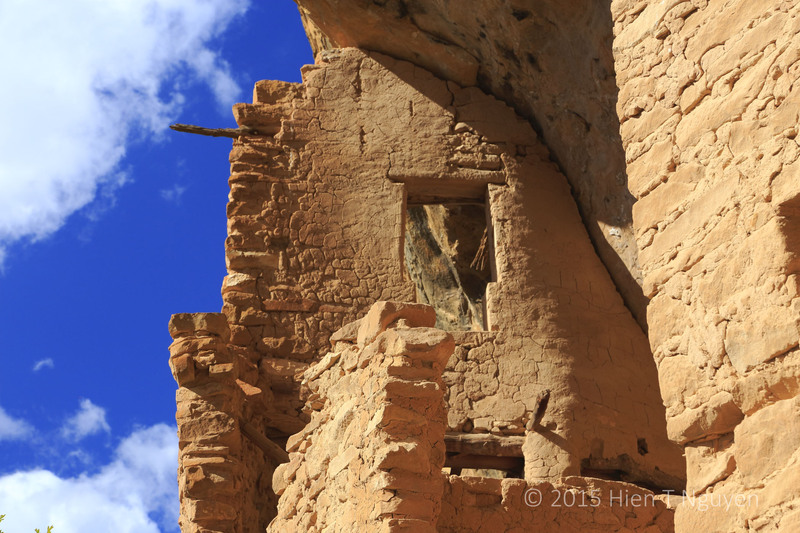 The descendants of the ancestral Puebloans now live in Southern Arizona and New Mexico. Cliff Palace the biggest cliff dwelling at Mesa Verde National Park. 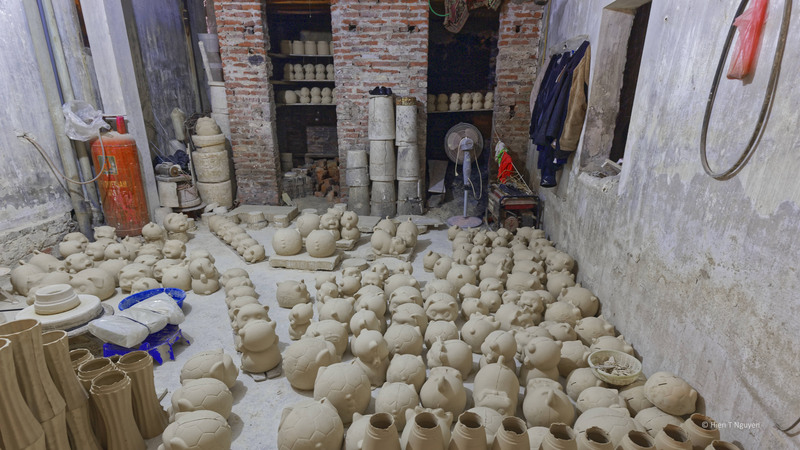 It has 150 rooms and 23 kivas. Oak Tree House at Mesa Verde National Park. Sunset House on two levels at Mesa Verde National Park. Mummy House on two levels at Mesa Verde National Park. 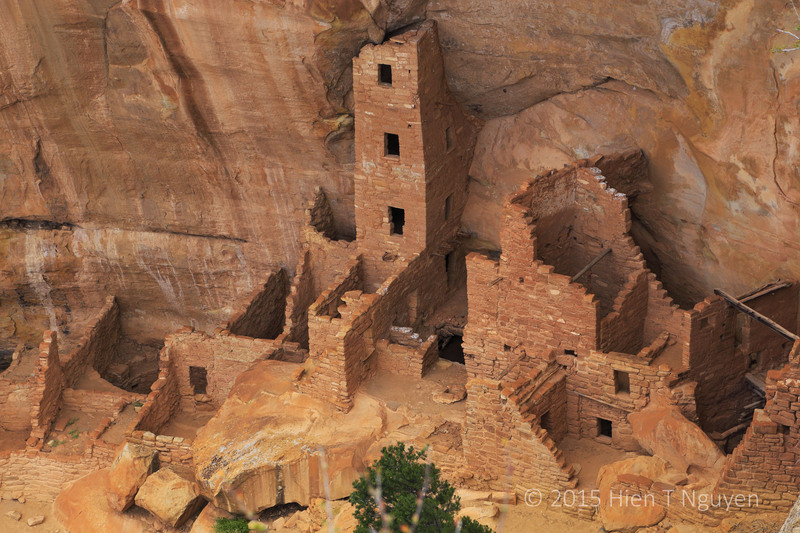 Ancestral Puebloans cultivated their lands on the top of the mesa above their houses. So how did they go from their cliff dwellings to their fields, or move from one level to another? 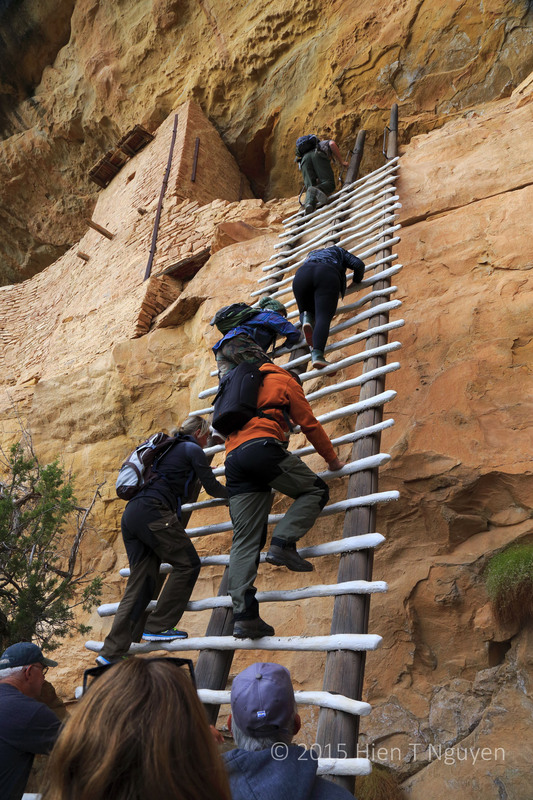 They used ropes and ladders, or carved climbing steps in the sandstone. 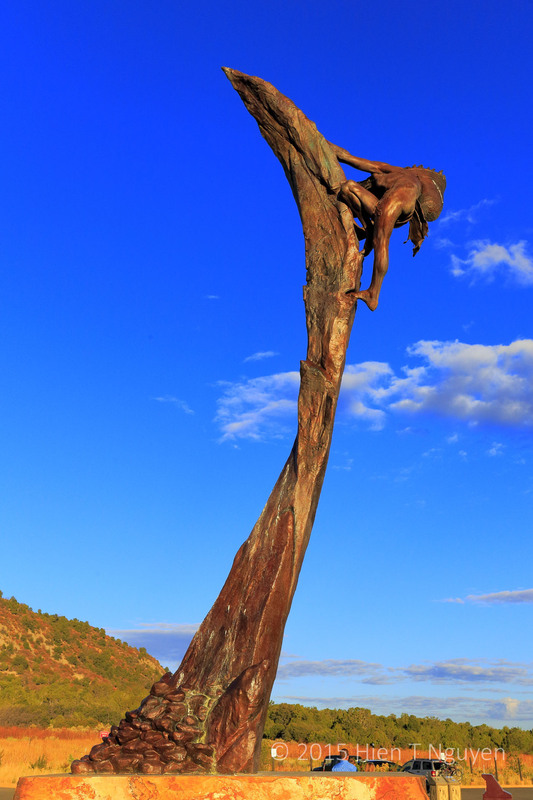 At the new Visitor Center of Mesa Verde, there is a statue by sculptor Edward J. Fraughton depicting an “ancient one” descending a narrow column of sandstone while carrying a basket of corn. “The Ancient Ones” by sculptor Edward J. Fraughton, in front of the Visitor Center at Mesa Verde National Park. 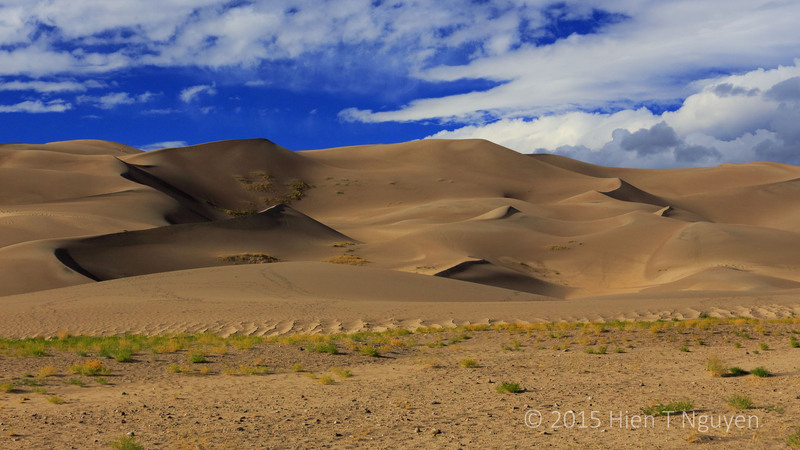 More photos taken at Great Sand Dunes near Mosca, CO. Click on images to view them in full size. 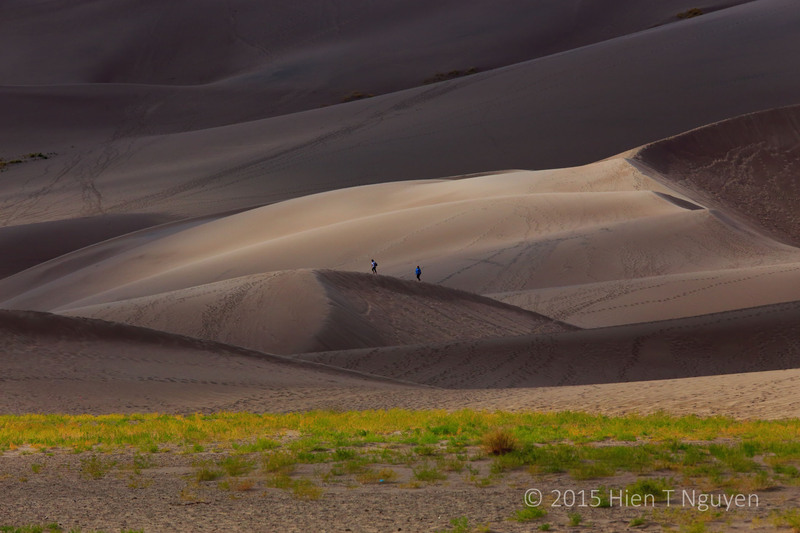 Hikers at Great Sand Dunes National Park. 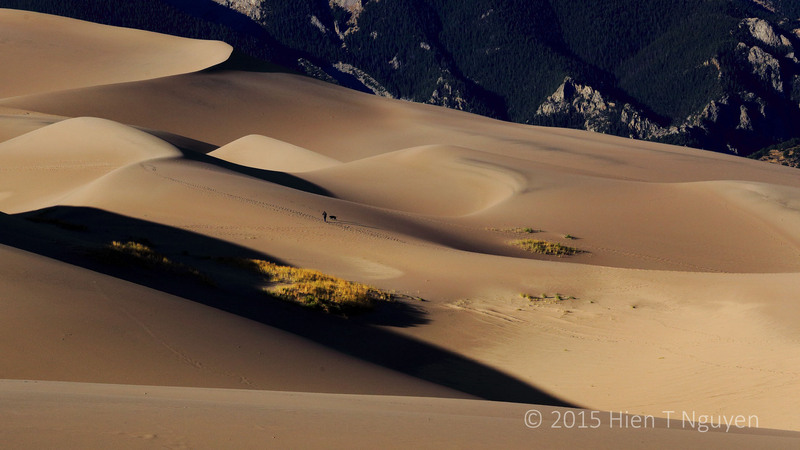 Man and best friend at Great Sand Dunes National Park. 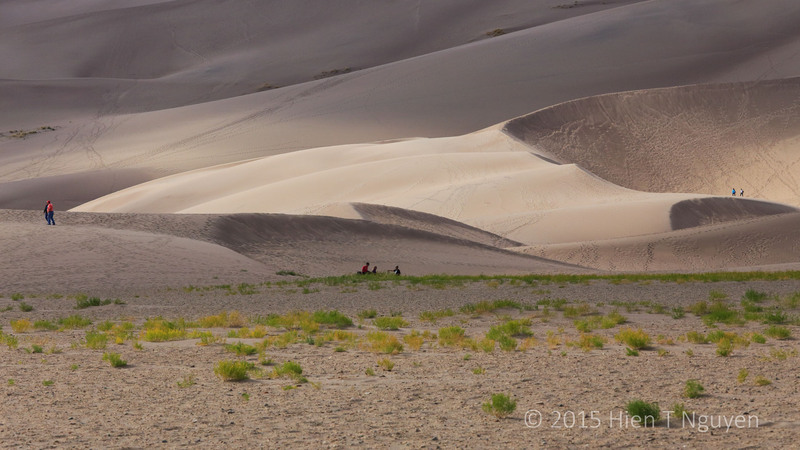 Couple at Great Sand Dunes National Park. 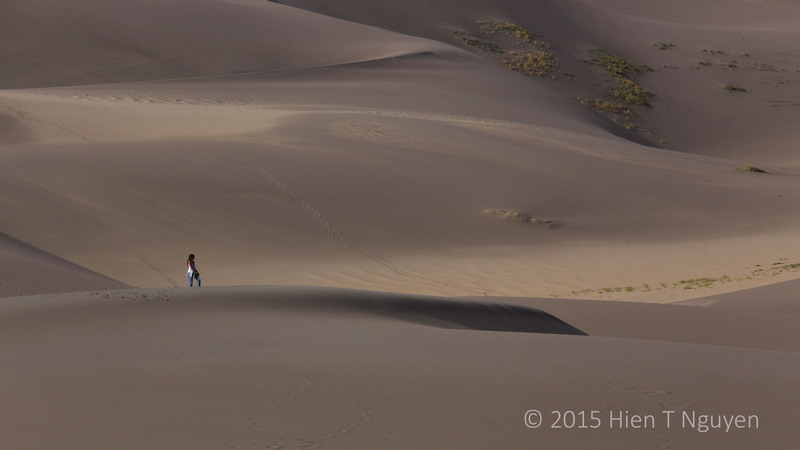 Girl at Great Sand Dunes National Park. 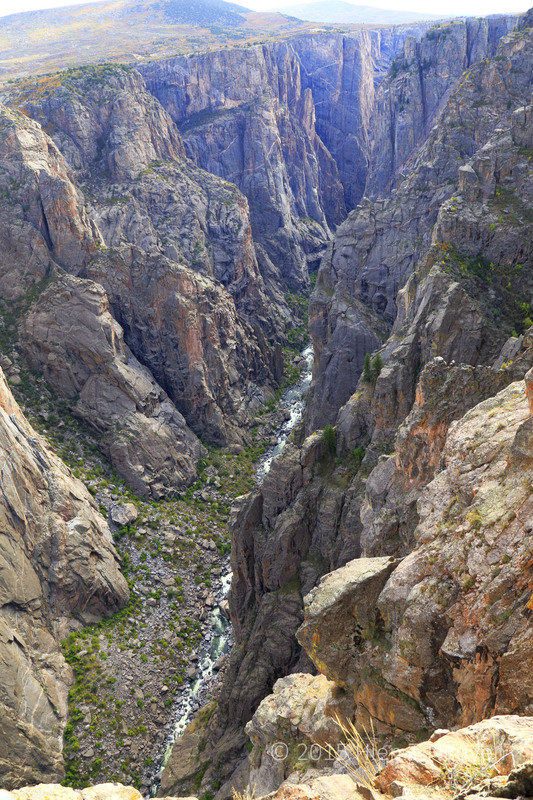 Black Canyon of the Gunnison near the town of Montrose in Colorado only became a National Park in 1999, but it has been known over a century for its rugged features, steep and narrow walls, and impassable nature. In 1853 Captain John W. Gunnison led an expedition to explore it and described it as “a stream imbedded in [a] narrow and sinuous canyon, resembling a huge snake in motion.” A few months later, his party was attacked by a band of Utes, and he was among eight who were killed. The canyon river was renamed in his honor. 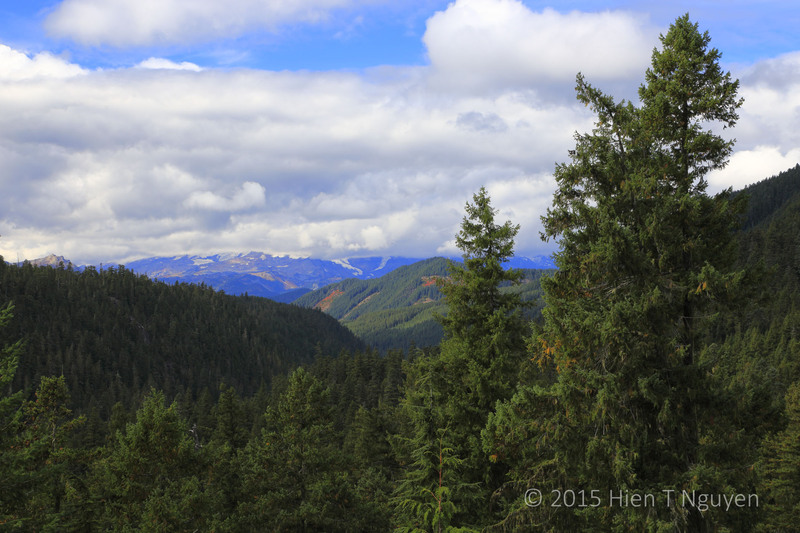 I took the following photos from the overlooks on the South Rim drive of the park. View of Black Canyon from Pulpit Rock overlook. 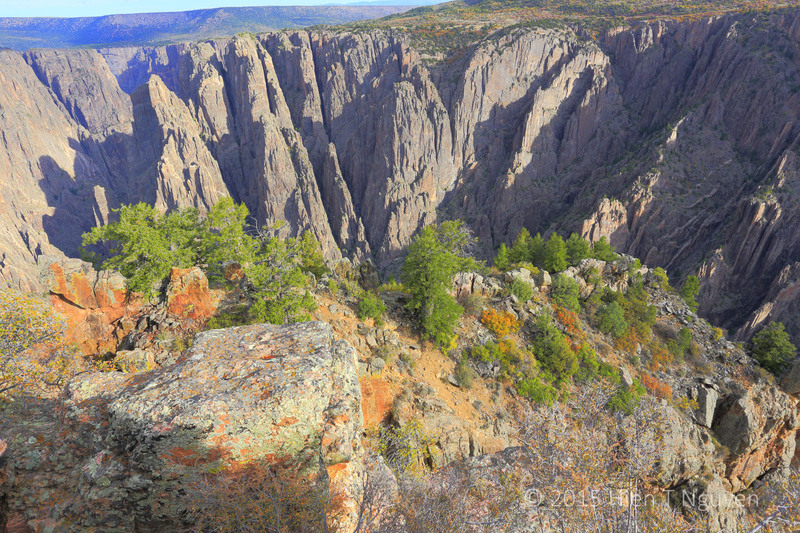 View of Black Canyon from Cross Fissures overlook. The entire canyon is 48 miles (77 km) in length, but only the deepest and most dramatic 12 miles (19 km) are within the national park boundaries. The canyon is deep and steep because the Gunnison runs rather fast through it, dropping an average of 34 feet per mile (6.4 m/km) compared to the Colorado River at Grand Canyon which averages 7.5 feet per mile (1.42 m/km). Because of its almost vertical walls, sunlight only reaches the bottom of the canyon for 33 minutes a day, giving rise to the name of Black Canyon. 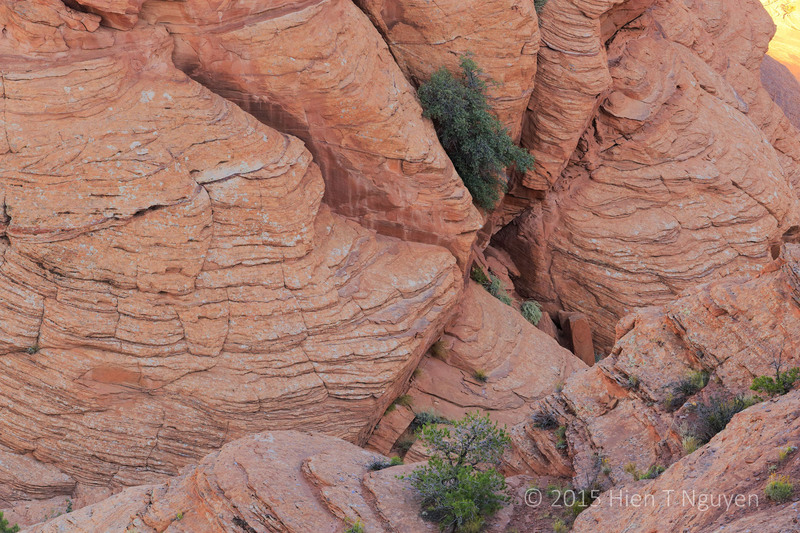 However, the rocks on the canyon walls are varied in colors, not black. View of Devil’s Overlook at Black Canyon. 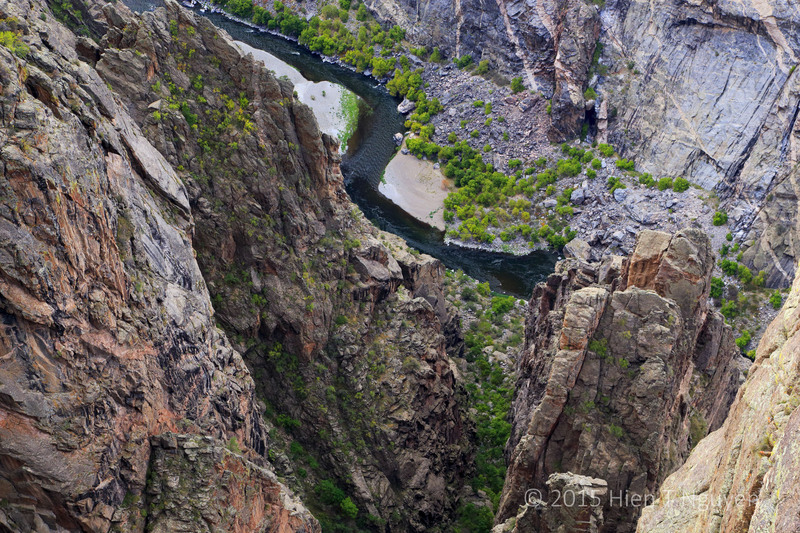 Due to the rate at which the river cuts through the rocks, Black Canyon is also a very narrow canyon. 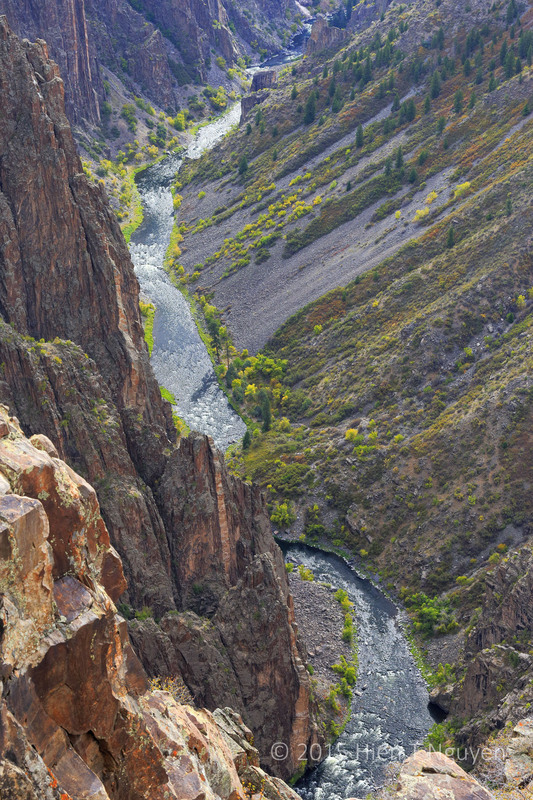 At Chasm View, only 1,100 feet (335 m) separate the North and South rims. View of Black Canyon at Chasm View overlook. View of Gunnison River from Painted Wall overlook. Between 1905 and 1909, a 5.8 mile (9.3 km) diversion tunnel was dug to channel water from the Gunnison River to the Uncompahgre Valley. The tunnel currently helps irrigate 76,300 acres of the valley which produces fruit and many crops, including Moravian malting barley used in Colorado’s Coors beer. 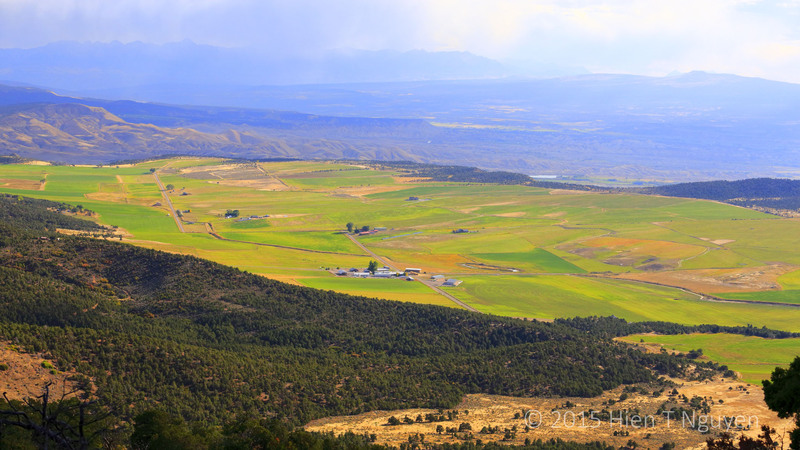 As we hiked up to Warner Point, I took the following photo of lush fields in the Bostwick Park mesa with the Uncompaghre Valley and the San Juan mountain range in the background. Bostwick Park mesa viewed from the trail to Warner Point at Black Canyon. Final stop was Sunset View point. I had hoped for a nice sunset, but a large black cloud loomed ominously. Still Sunset View yielded an interesting shot. Spoiled sunset at Sunset View point in Black Canyon. Painted Desert covers an area 120 miles long by 60 miles wide (190 by 97 km) starting from Cameron, AZ, near Grand Canyon National Park, and extending past Holbrook, AZ. 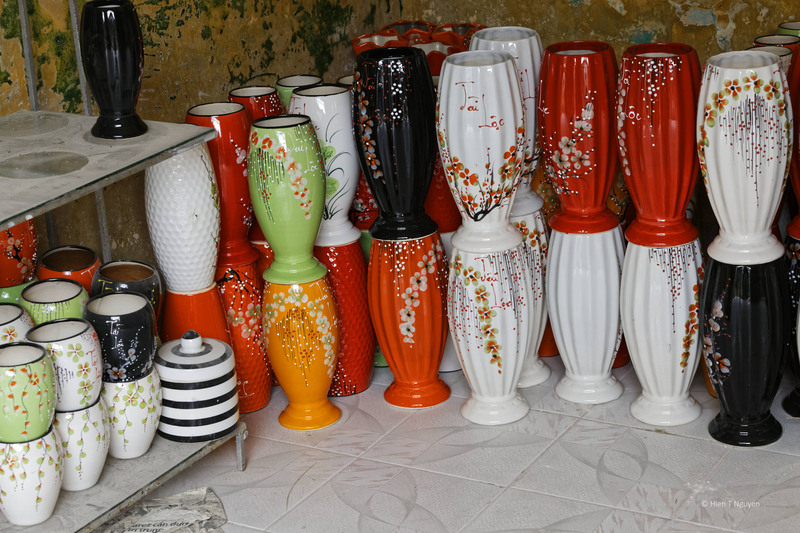 It was discovered in the 16th century by Spanish explorers who named it “El Desierto Pintado”. 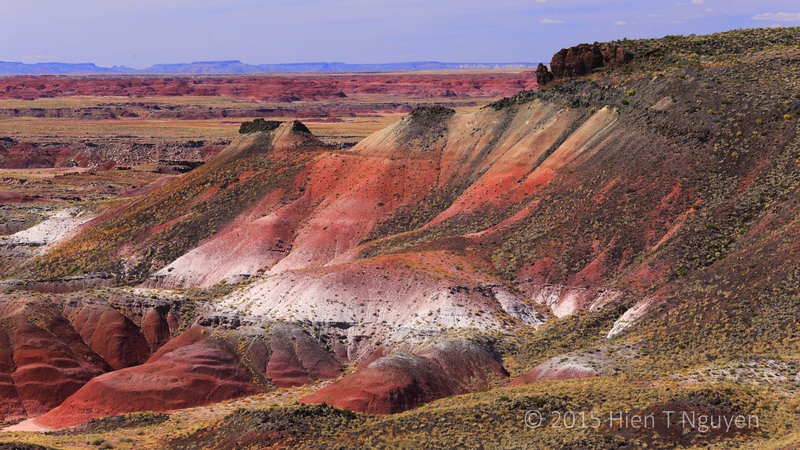 Most of Painted Desert now lies within the boundaries of the Navajo Nation. 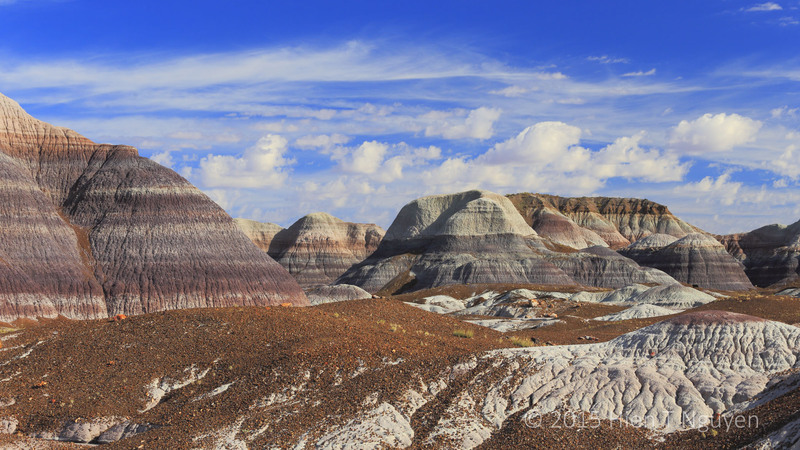 A small part of it is within Petrified Forest National Park, divided by Interstate 40 into northern and southern parts. Petrified Forest of course contains many deposits of petrified wood, although a lot of it had been looted and carried away before the place became a National Monument in 1906 and a National Park in 1962. 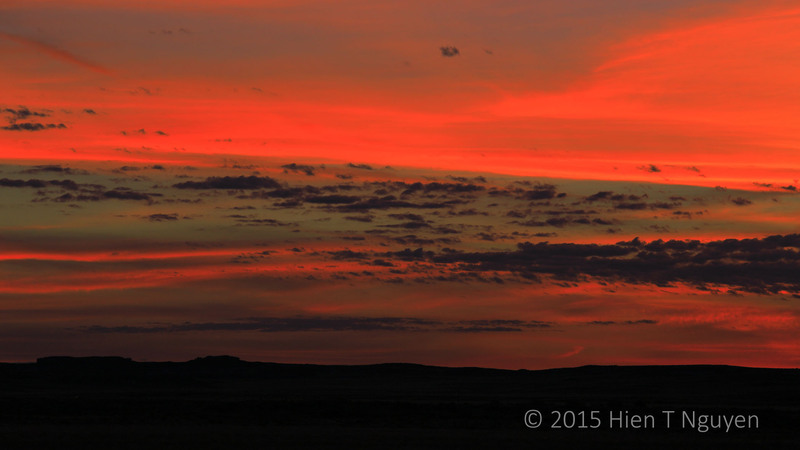 Arizona sunrise over Painted Desert. 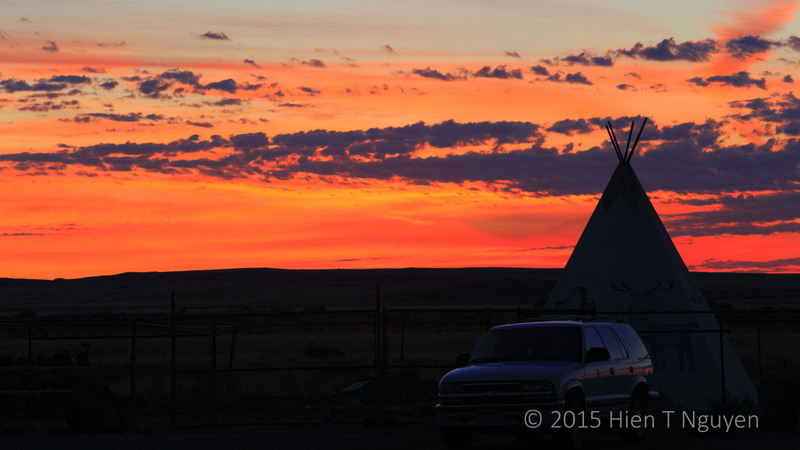 Arizona sunrise over teepee outside of Petrified Forest National Park. 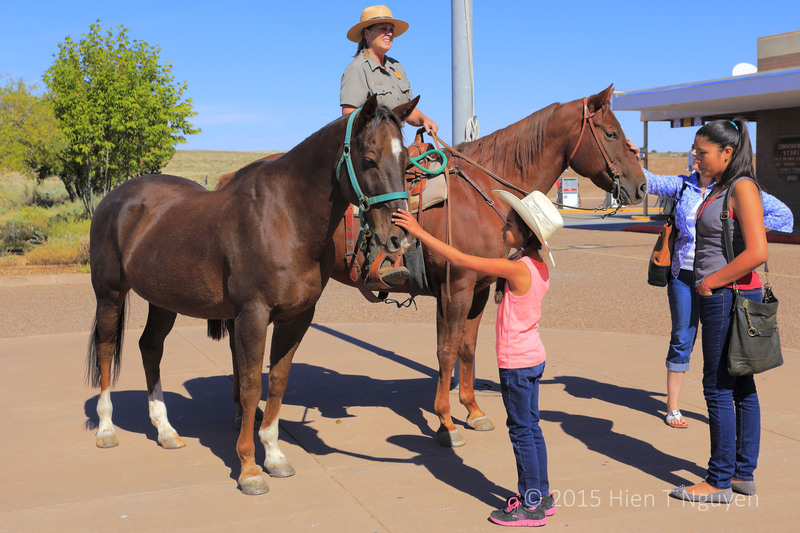 Visitors admiring park ranger horses at Visitor Center in Petrified Forest National Park. 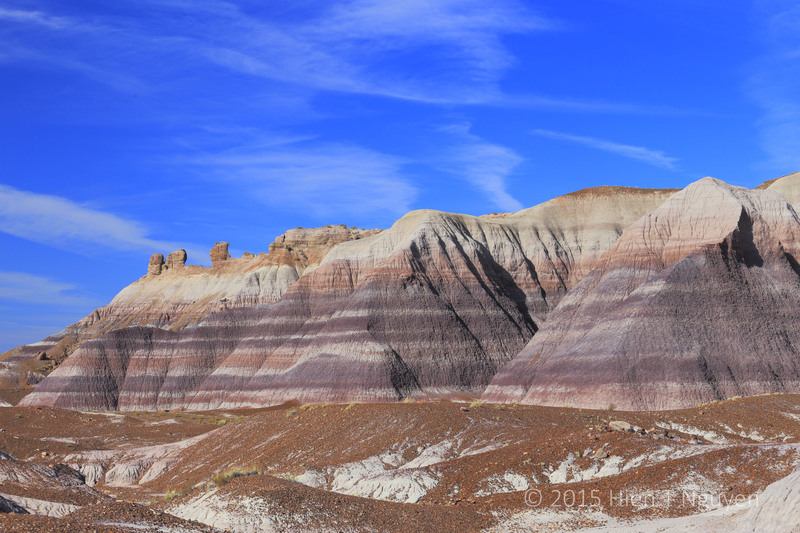 View of Painted Desert in northern section of Petrified Forest National Park. 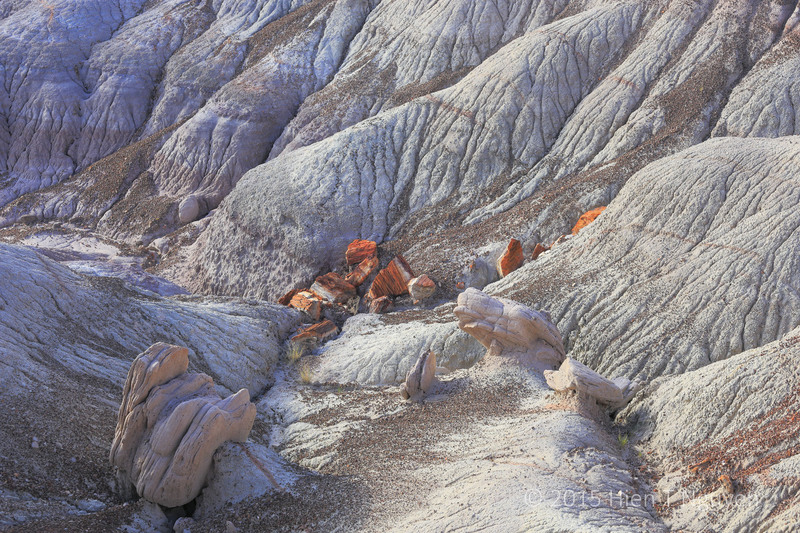 Painted Desert lies within the Chinle Formation which consists of sedimentary rocks dating back 200 million years ago. Its colors range from red, orange, and yellow to blue, lavender, and purple, depending on the rate at which minerals were deposited. 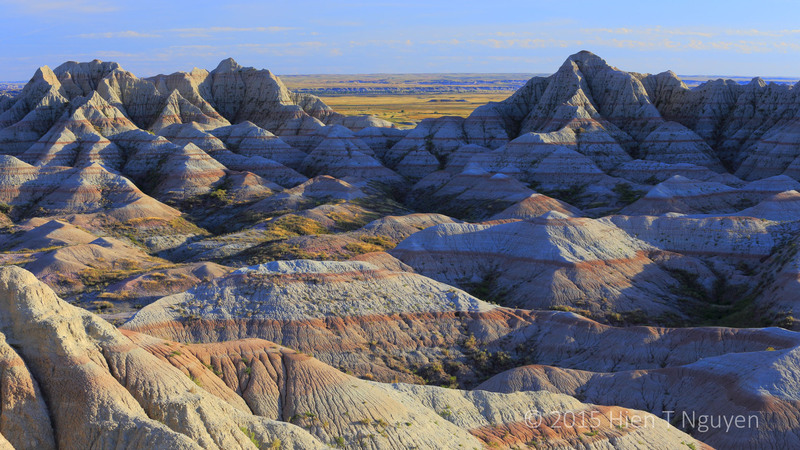 Rapid deposits lead to colors like lavender, blue, gray while slower deposits produce the red and yellow seen in the northern part of the park. 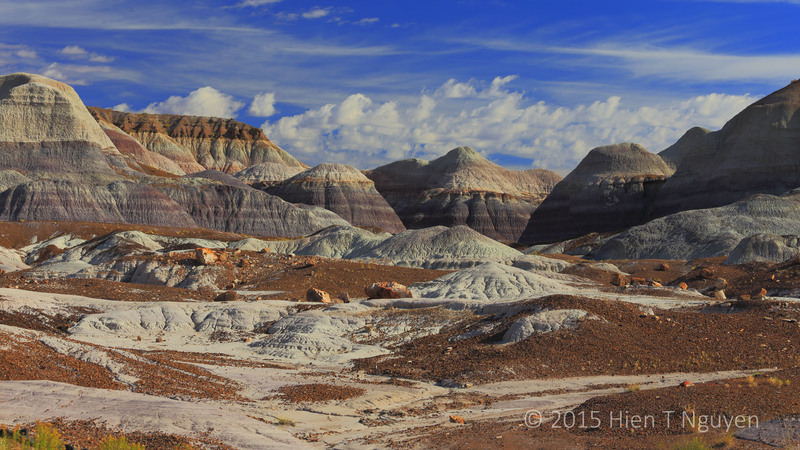 View of Painted Desert at Blue Mesa in southern part of Petrified Forest National Park. 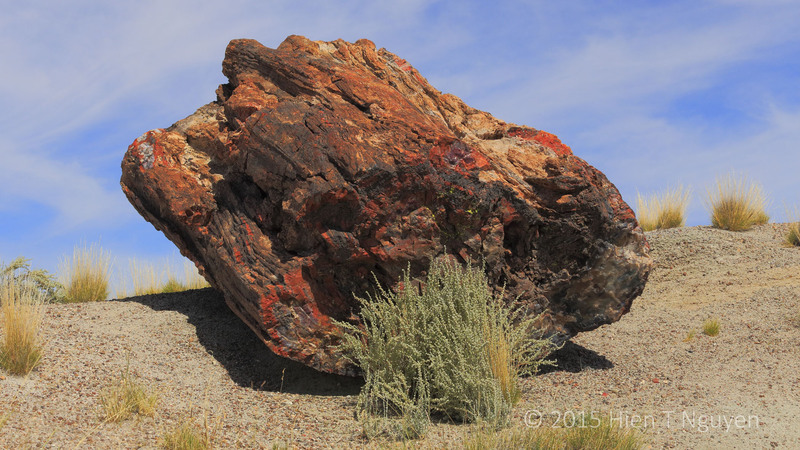 Small pieces of rock are petrified wood. 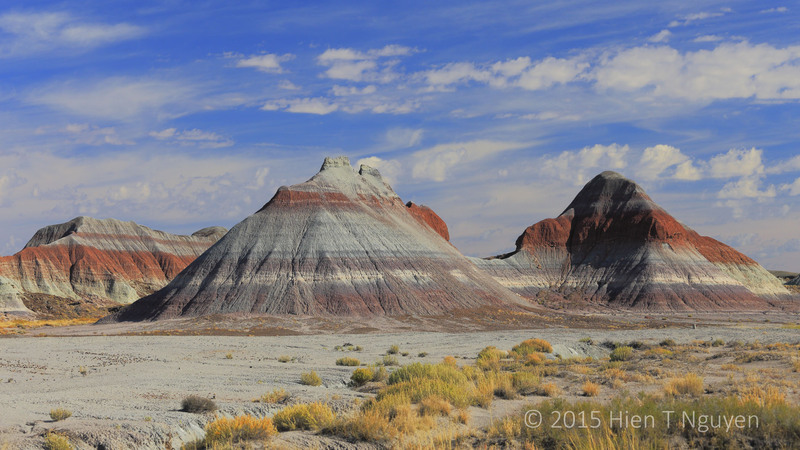 Rock formations named Teepees in southern part of Petrified Forest National Park. 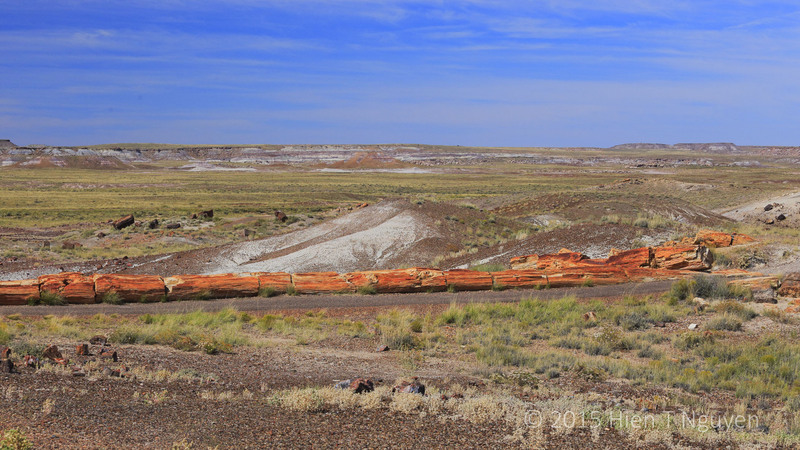 A piece of petrified wood in southern part of Petrified Forest National Park. 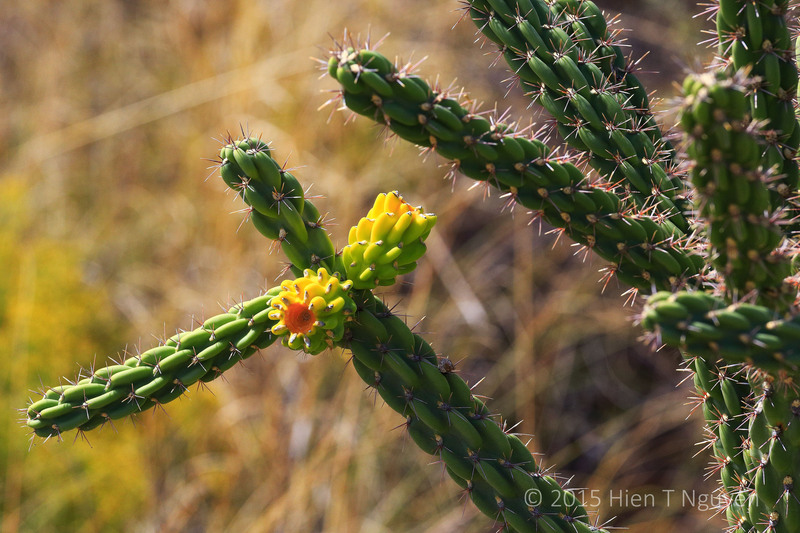 Whipple Cholla Cactus at Petrified Forest National Park. 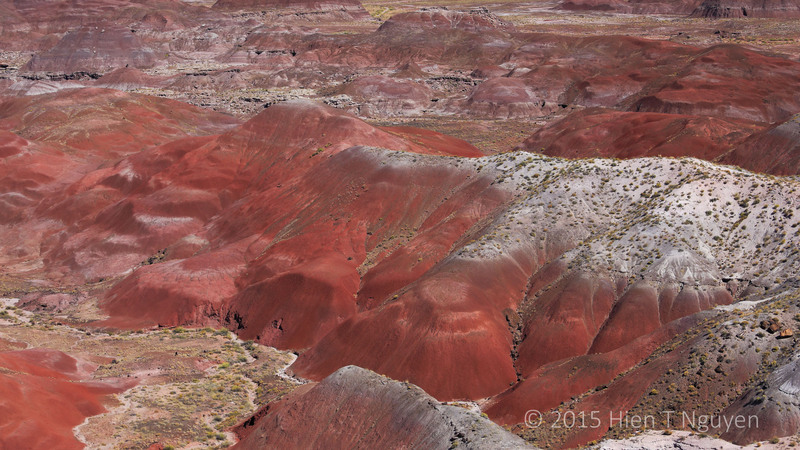 People have lived in Painted Desert for as long as 13,000 years and have left their imprints on the landscape. 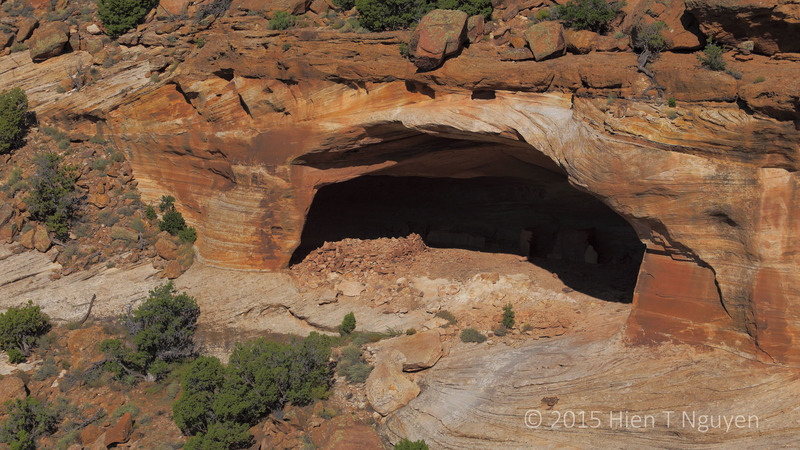 Ancestral Puebloans built houses, entire villages, and carved petroglyphs on rocks. 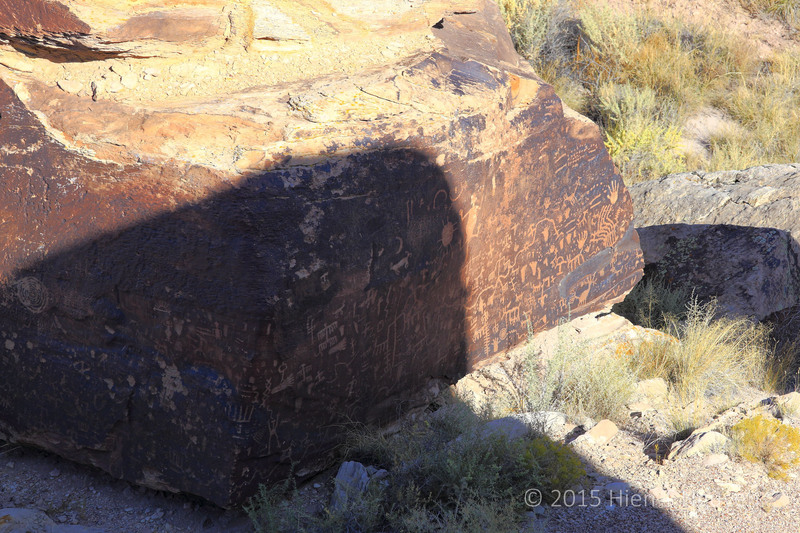 I took the following photos at Newspaper Rock, which is not one rock but several containing as many as 650 petroglyphs. 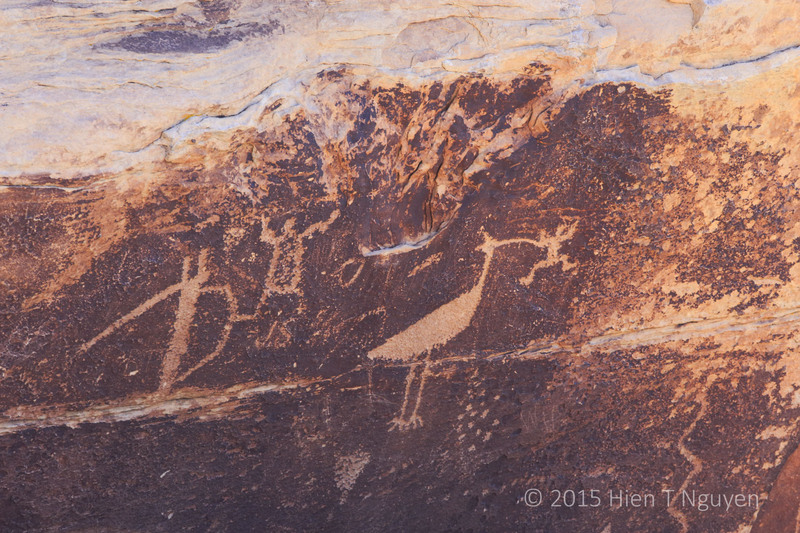 Petroglyphs at Newspaper Rock in southern part of Petrified Forest National Park. 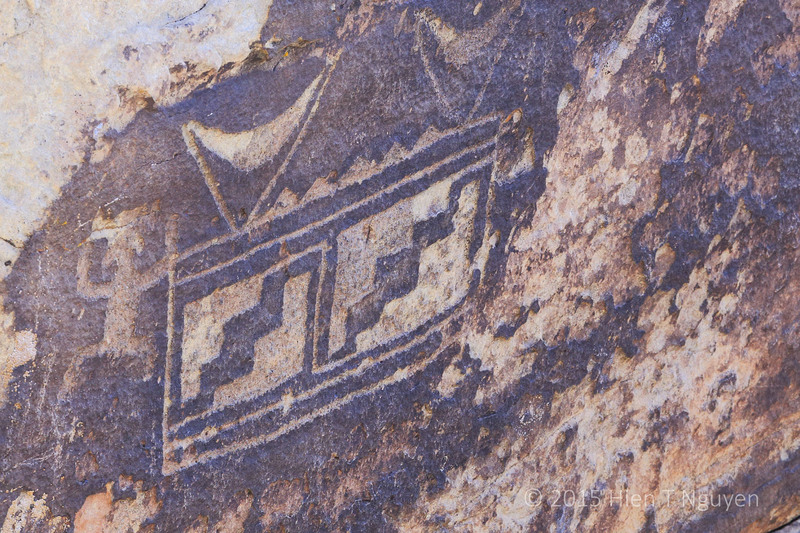 Visitors were not allowed to walk down to the rocks, and high noon lighting was not the best, but the petroglyphs were still clearly visible. Finally, the Wigwam Motel where we stayed is on the National Register of Historic Places. It was built in 1950 and its accommodations are rather austere by today’s standards, but it was really striking and the price was right! 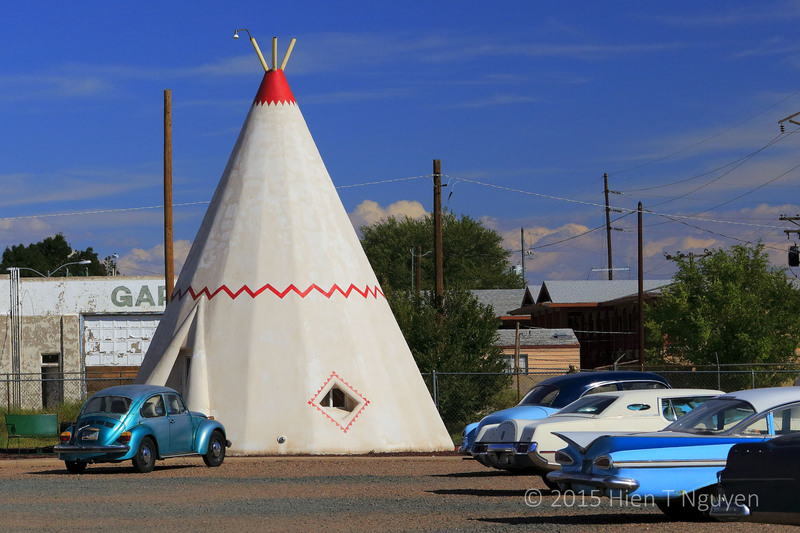 View of a teepee at Wigwam Motel in Holbrook, AZ. Antique cars on site belong to the motel owners. Canyon de Chelly (Chelly comes from the Navajo word Tseyi) National Monument is located within land of the Navajo Nation in Northeast Arizona. It is here that in 1864 Kit Carson managed to defeat the Navajo warriors and forced 8,500 Navajo men, women, and children to migrate to a reservation near Fort Sumner in New Mexico. The Long Walk took place in the winter of 1864 over 300 miles. Some died on the way, while many others perished on the reservation due to disease, famine, and in general poor management of the reservation by the US government. In 1868 the Navajos were allowed to return to Canyon de Chelly. A few still live there, but more than 300,000 Navajos are now spread out over the 27,413 square miles (over 7 million hectares) of the Navajo Nation in parts of Arizona, New Mexico, and Utah. Fortress Rock at Canyon de Chelly. 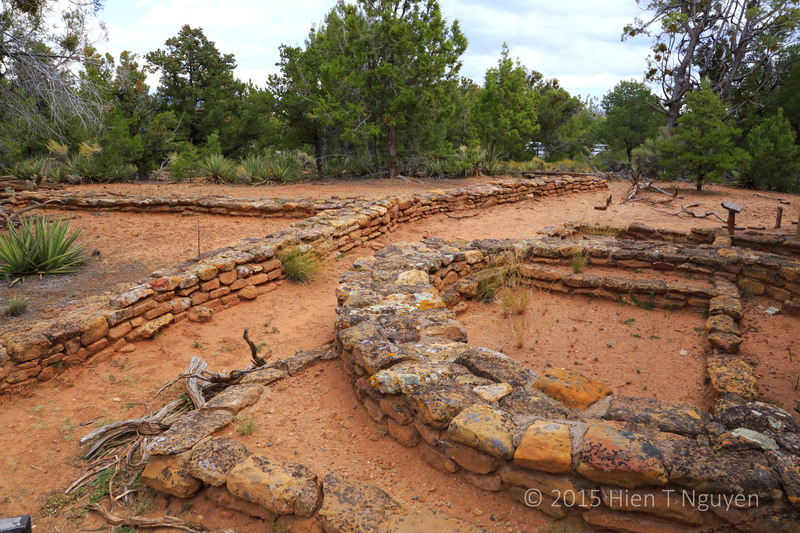 This is where Navajo warriors took refuge when they were attacked by troops under Kit Carson in 1864. Massacre Cave at Canyon de Chelly. In 1805 Spanish soldiers shot at the Navajos from this vantage point, killing 90 warriors and 25 women and children. One Navajo woman grappled with a Spaniard and plunged to her death, dragging her enemy with her. The Navajos now call this place “Two Fell Off”. White House ruins at Canyon de Chelly. 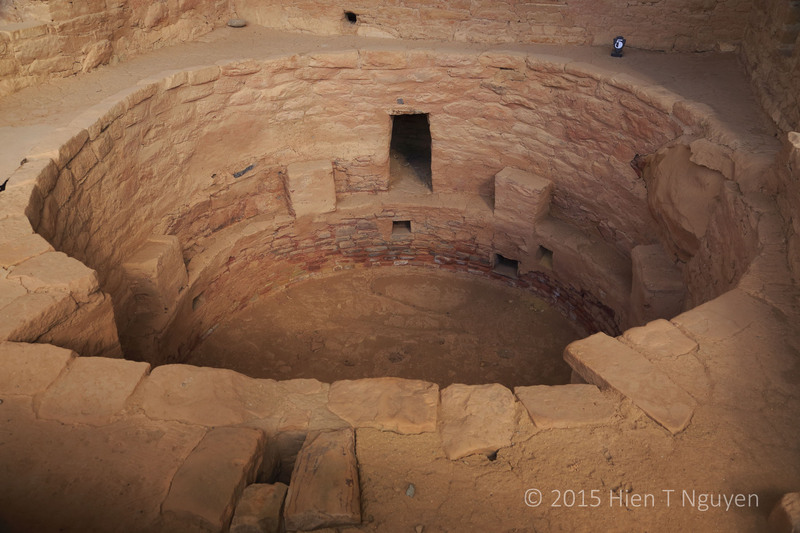 These were built by ancient Puebloans who lived there from 1060 to 1275 AD. 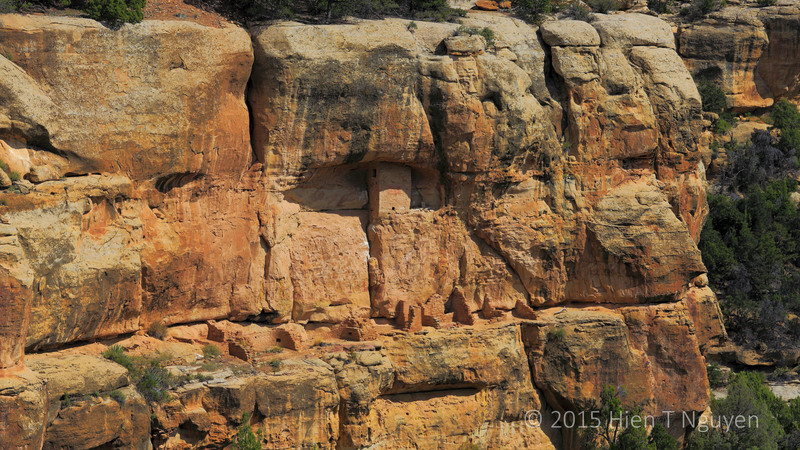 Look closely and you’ll see a good size petroglyph on the cliff wall between the two levels of these ruins. 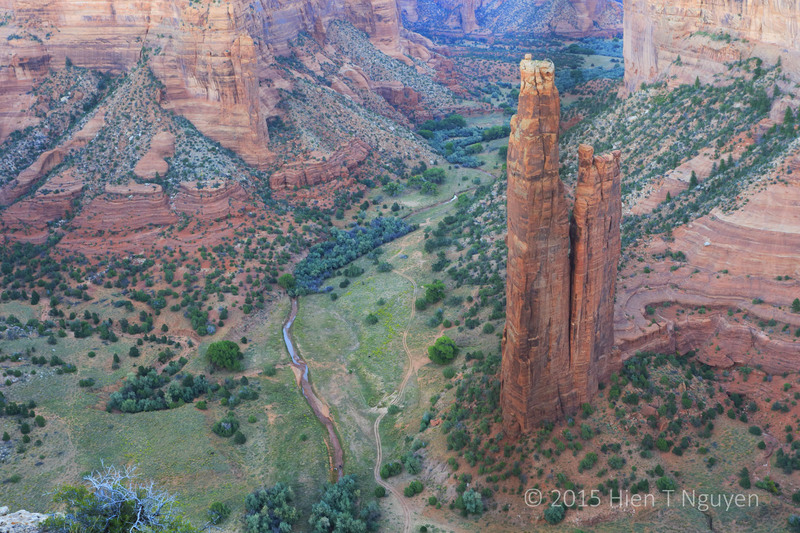 Spider Rock at Canyon de Chelly. 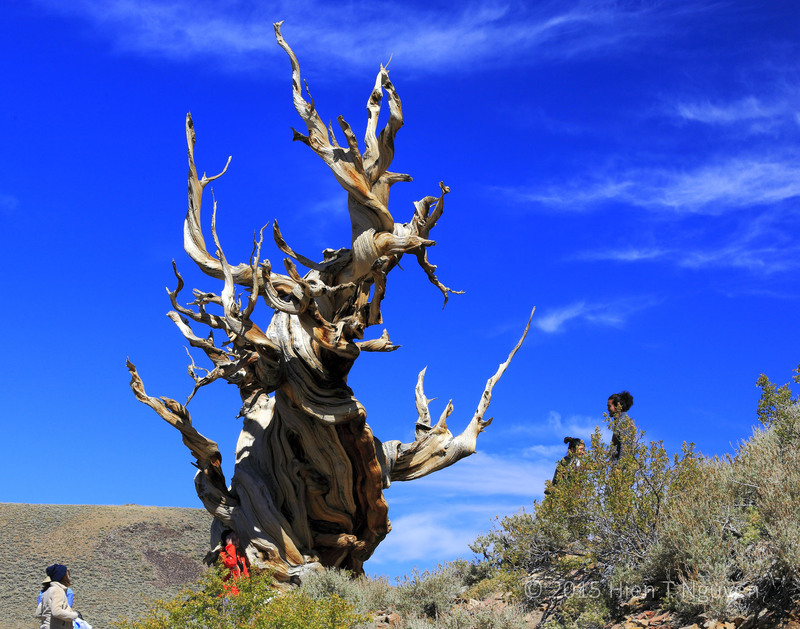 It is 800 ft (240 m) high and has been filmed in television commercials. The lower spire is Speaking Rock. 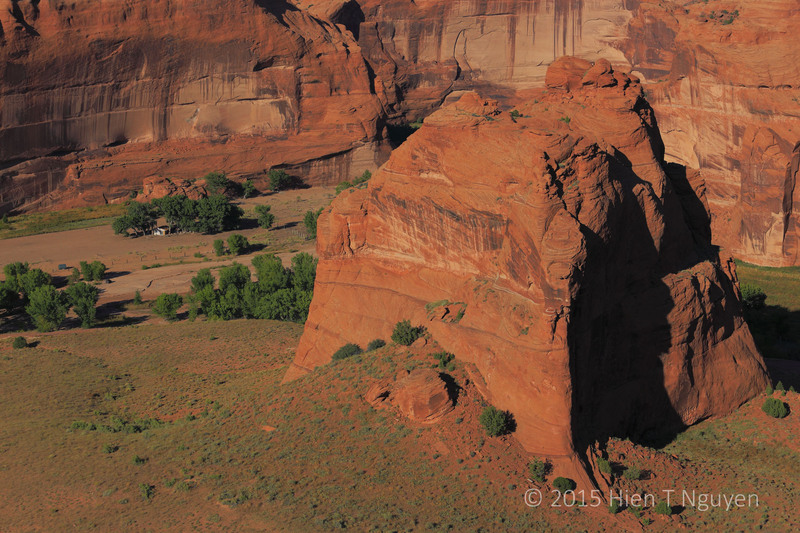 Unusual rock formation seen from Spider Rock Overlook at Canyon de Chelly. 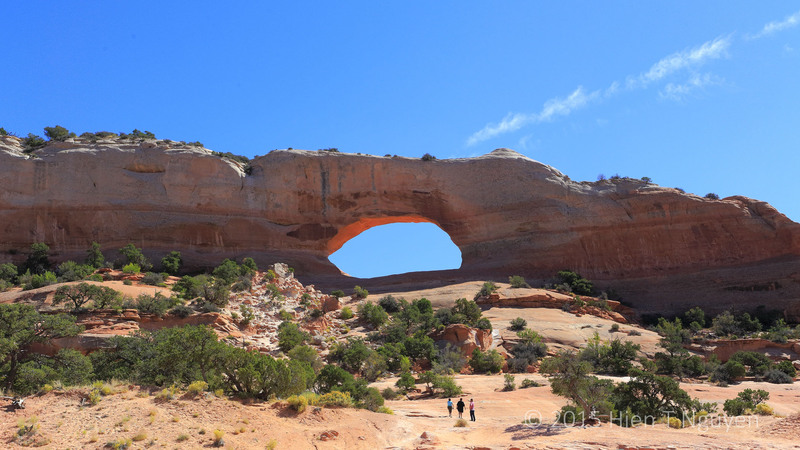 By the time we went through Moab, UT, I had driven through two thirds of our planned itinerary, and the wow factor was slowly yielding to road weariness. 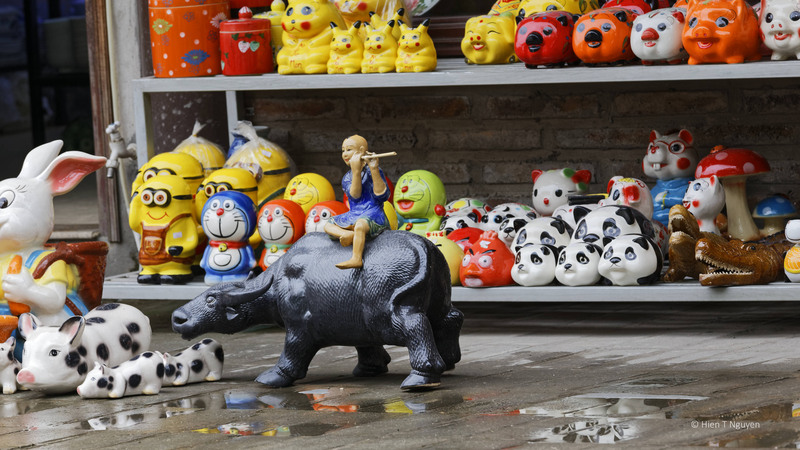 We had been to the area already and knew some of the sights so we only made brief stops. 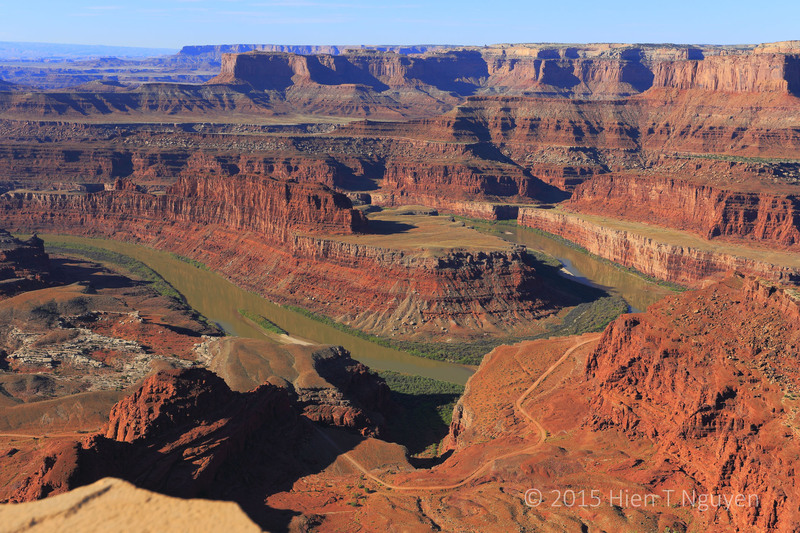 Dead Horse Point State Park is one of my favorites and you can probably see why from the following very popular shot of the Colorado River as it flows south to merge with the Green River in Canyonlands National Park. The name of the park comes from the legend that some horses corralled on the point were somehow left to die of thirst within sight of the river 2000 ft below them. Colorado River at Dead Horse Point State Park. 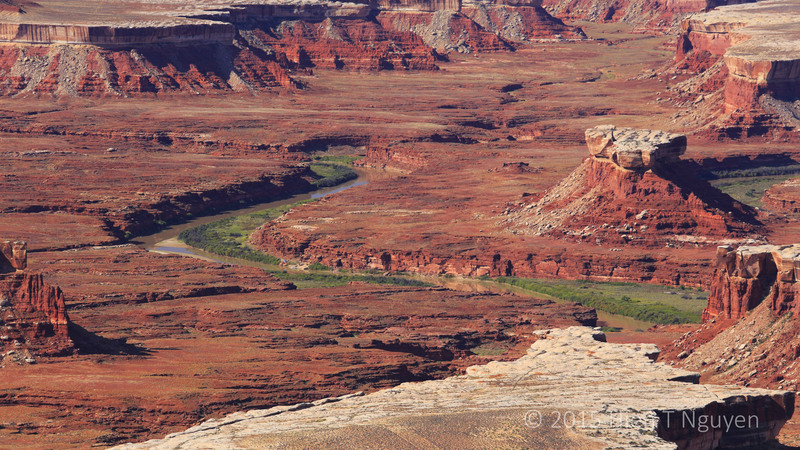 Green River at Canyonlands National Park. We went through the town of Moab on our way to our next stop in Arizona. 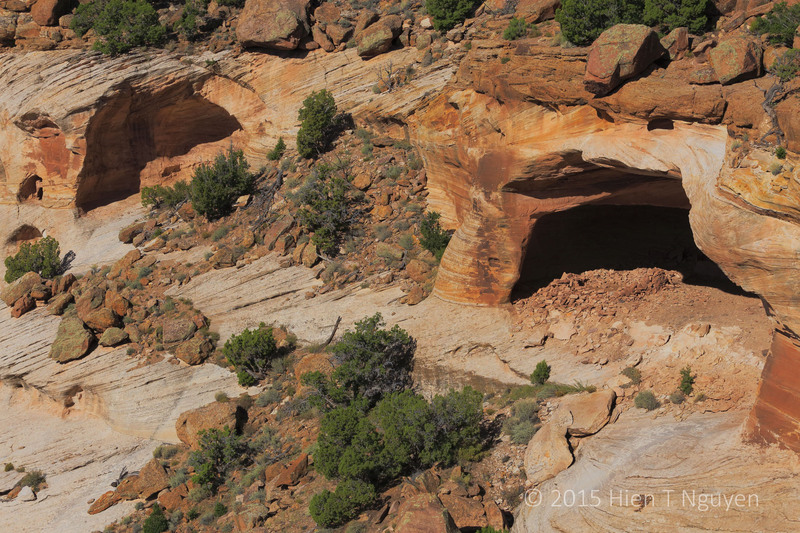 Right by Highway 191, some 24 miles from Moab was Wilson Arch, easily accessible to anyone. I was told that unwary tourists have been misled by dishonest tour bus guides who took them to see Wilson Arch, since it was right by the side of the road, then told them they had been to Arches National Park! Wilson Arch right by Highway 191, 24 miles south of Moab, UT. On the way from Capitol Reef National Park to Green River, UT, we stopped by Goblin Valley State Park which merits a post all by itself. It lies north of Hanksville, UT off Highway 24. It is not a very big park as it covers only 3.6 acres (1.5 ha), but it is worth a visit. Nearby there are camping sites and even a couple of yurts. Families with young children favor this park as it is very accessible to the younger ones who can roam freely throughout the area. 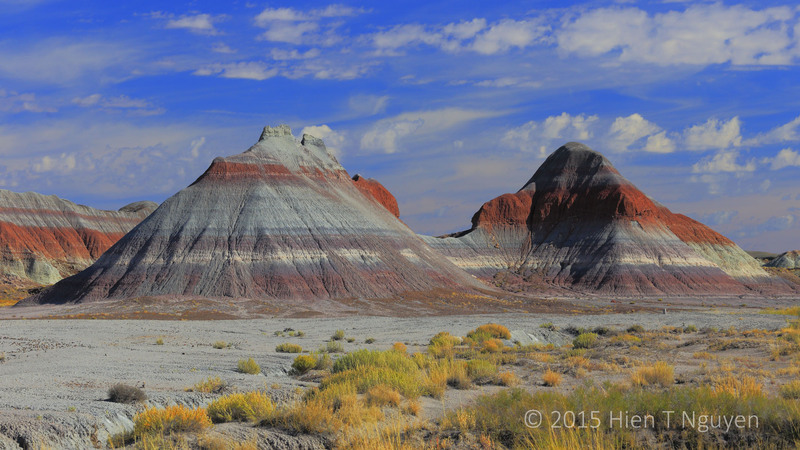 From Hanksville the drive is 32 miles long to get to the park entrance where the majestic Wild Horse Butte dominates. 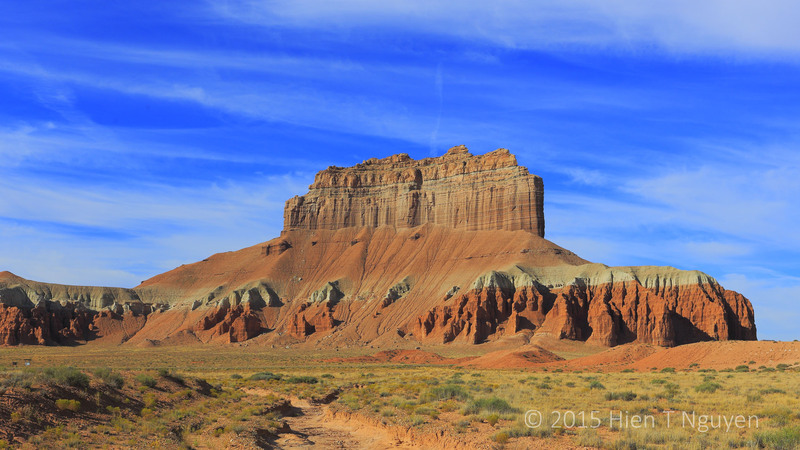 Wild Horse Butte at entrance to Goblin Valley State Park. 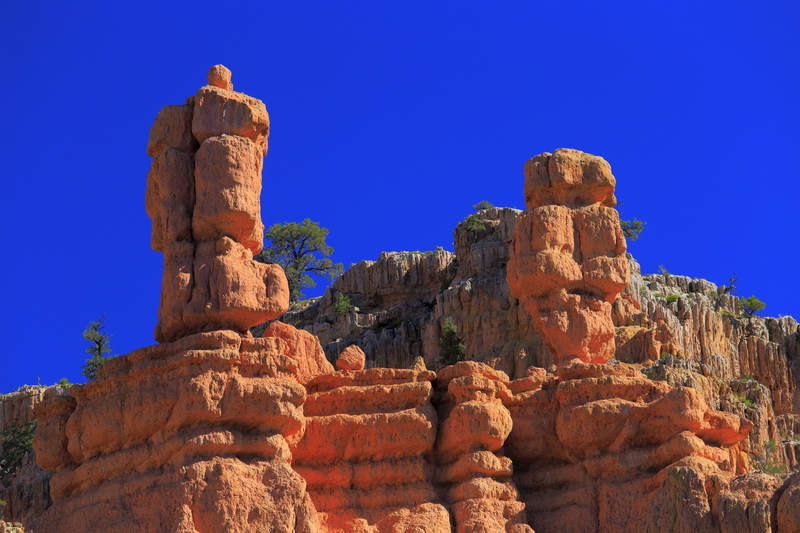 Inside the park are thousands of hoodoos or phantasmagorical rock formations unseen elsewhere. 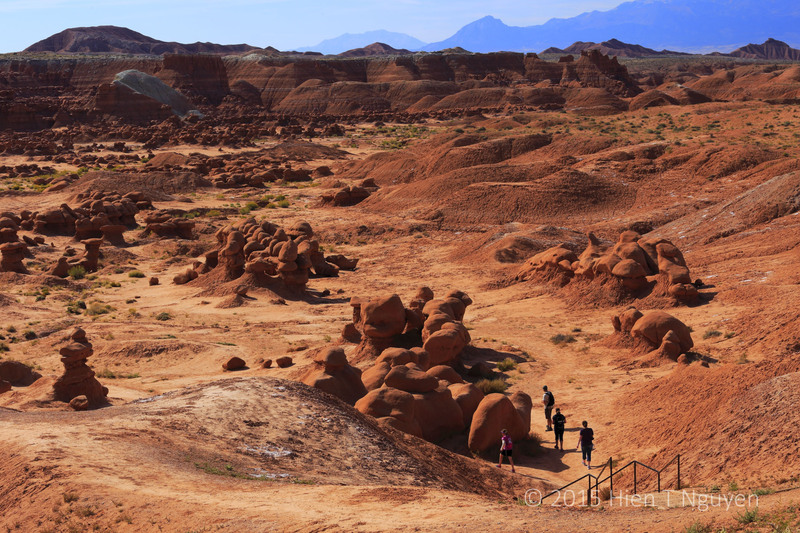 A movie, Galaxy Quest, was filmed at Goblin Valley because of the fantastic, out-of-this-world scenery. 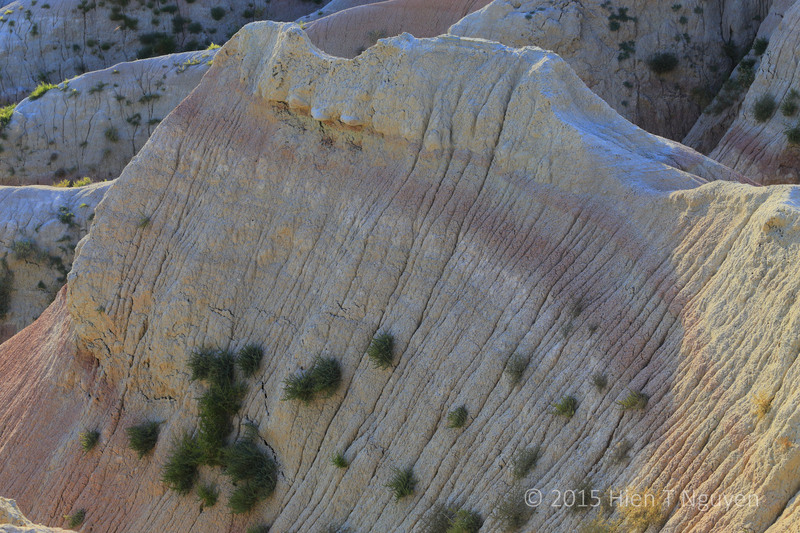 Hoodoos at Globin Valley State Park. 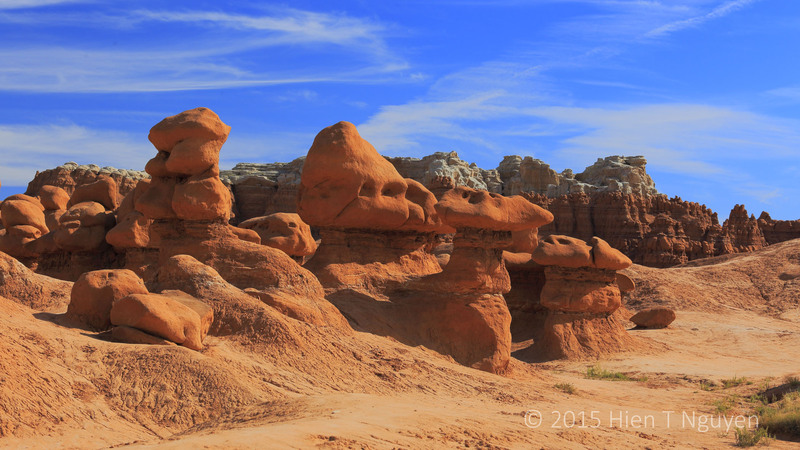 Hoodoos at Goblin Valley State Park. View from parking lot at Goblin Valley State Park. This last photo helps explain where those “goblins” came from. Hoodoo at Goblin Valley State Park. On the hill at left are buried Entrada Sandstone rocks that erosion will eventually transform into hoodoos. 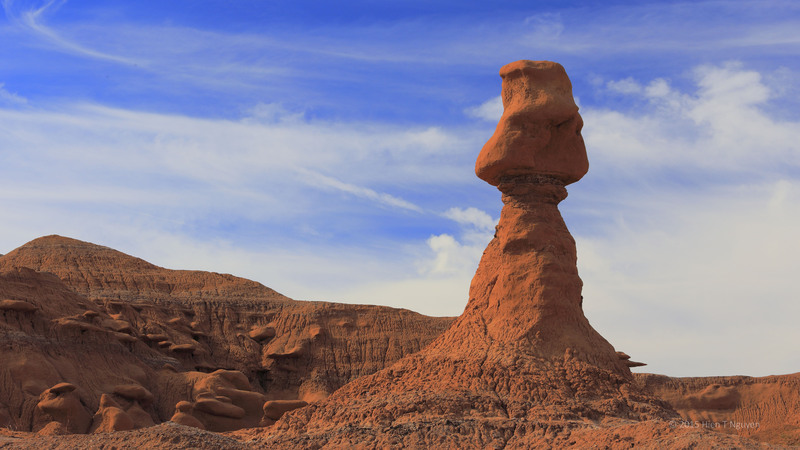 The hoodoos at Goblin Valley are made of Entrada Sandstone, the same rocks found at Arches National Park and in Cathedral Valley section of Capitol Reef National Park. All of these places are on what is considered the Colorado Plateau. In the Jurassic period, some 170 million years ago, Goblin Valley was the tidal flat of an ancient sea where sandstone, siltstone, and shale were deposited and transformed into solid layers of rocks. 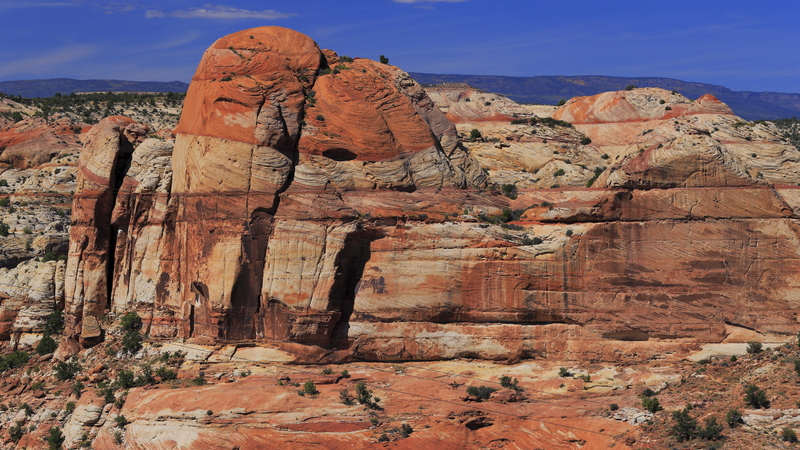 The Colorado Plateau started to be uplifted 10 million years ago, after which erosion by wind and water began carving Entrada Sandstone into goblins. 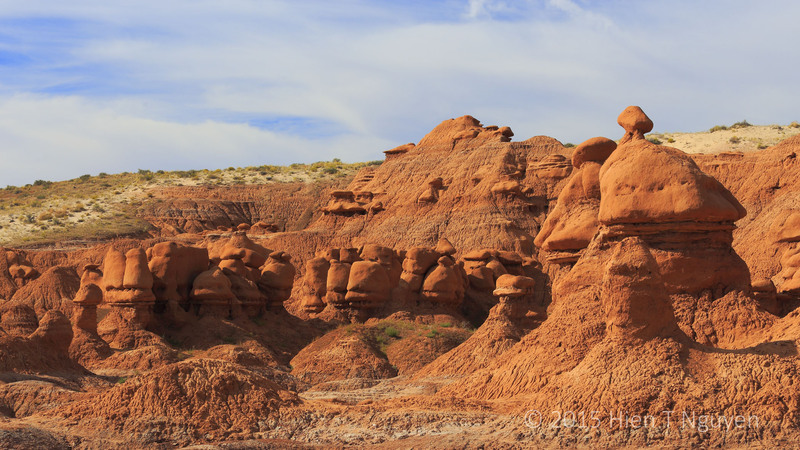 Erosion is continually changing Goblin Valley and those hoodoos or goblins will continue to be born, shaped and weathered and eventually fall down to the valley. Capitol Reef National Park, near Torrey in Utah, owes its name to two of its natural features: whitish rock formations that look like the Capitol dome in Washington, DC; and the giant Waterpocket Fold that stretches from North to South making the rock walls pushed up from the earth look like reefs. There was no easy way to cross the area from East to West until Highway 24 was built in 1962. View of Capitol dome from Highway 24 at Capitol Reef National Park. 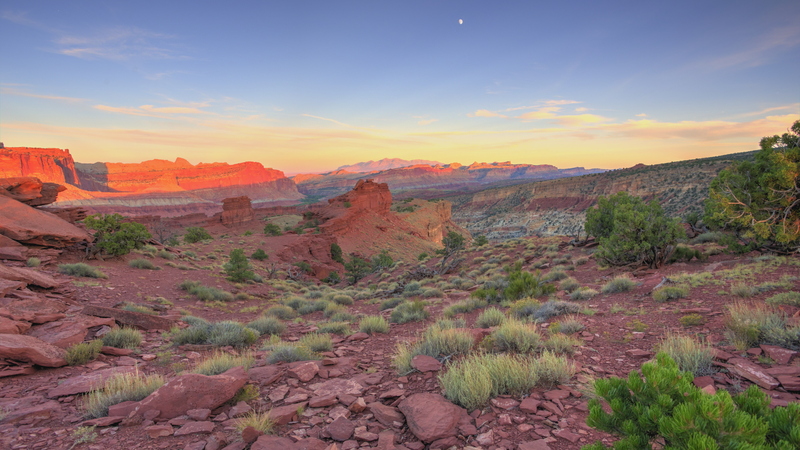 Capitol Reef National Park at sunset and moonrise. Beginning of trail to the Golden Throne at Capitol Reef National Park. 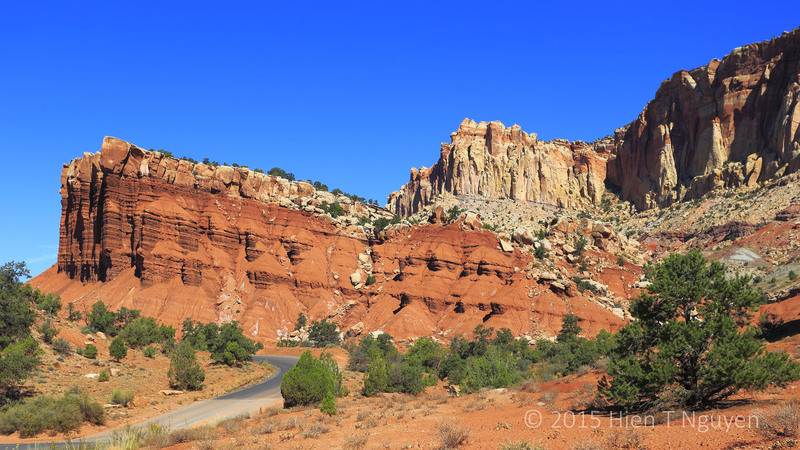 I drove on the paved section of Notom Road which ran for 34 miles (54 km) on the East side of Capitol Reef. That’s where the Waterpocket Fold rock wall stretching for miles was clearly visible. Rock formation by the side of Notom Road, with the long Waterpocket Fold wall seen on the lower right side of the photo. On aerial photos, the fold is clearly visible as it is nearly 100 miles (160 km) long. 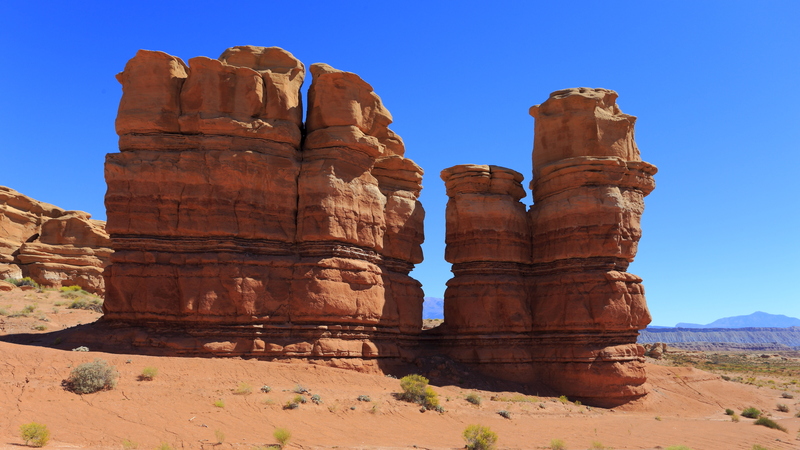 Despite these geologic obstacles, Mormon pioneers began settling in the area in the late 1870’s. They established a community named Fruita along the Fremont River, planted fruit trees and raised animals. Fruita is now within the park boundaries and the Mormons have been bought out and moved away, but the orchards are still productive with about 3,000 trees. 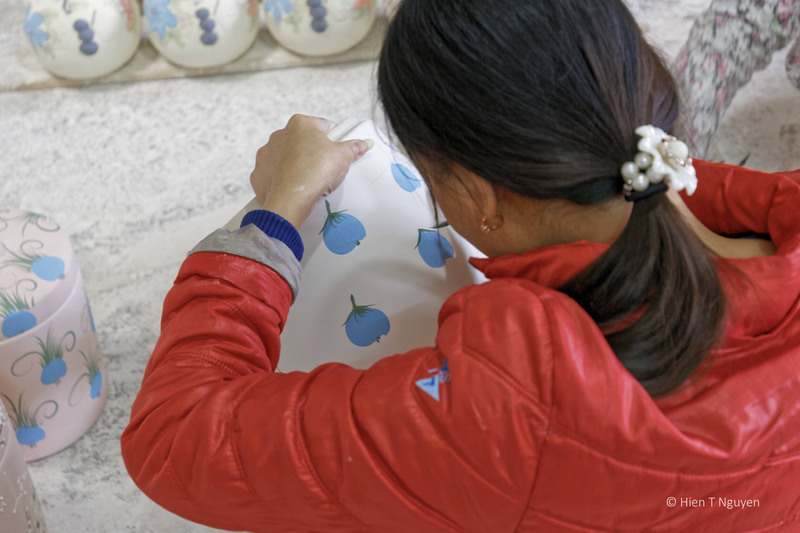 In season, visitors can pick and eat fruit for free, or pay a small fee if they take it home. 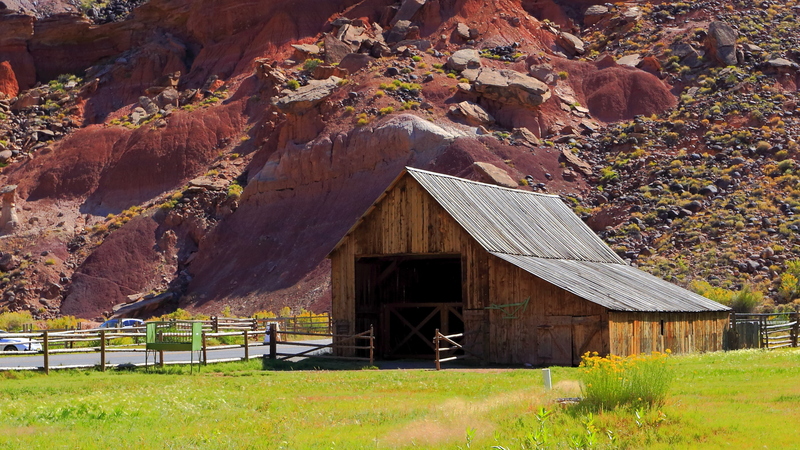 Mormon barn in Fruita, near the Visitor Center at Capitol Reef National Park. The Gifford family was the last family to be bought out by the government in 1969. 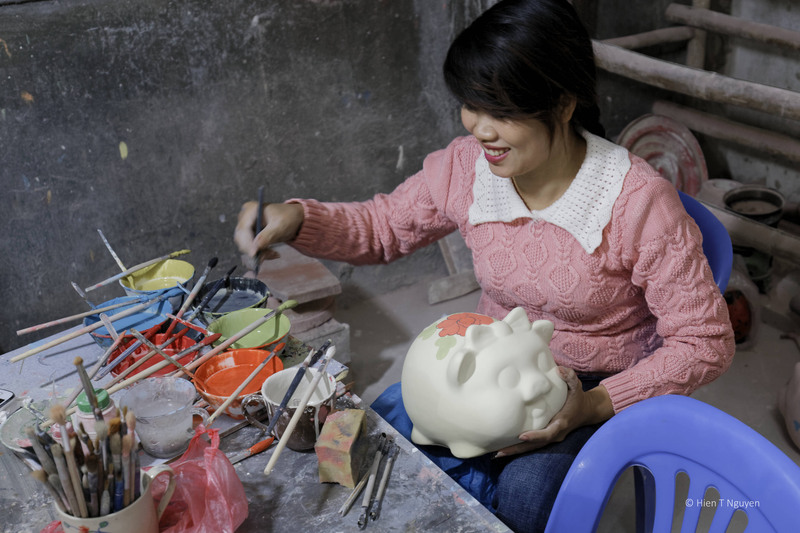 Their house now serves as a museum where souvenirs, fruit pies, and ice cream are sold! 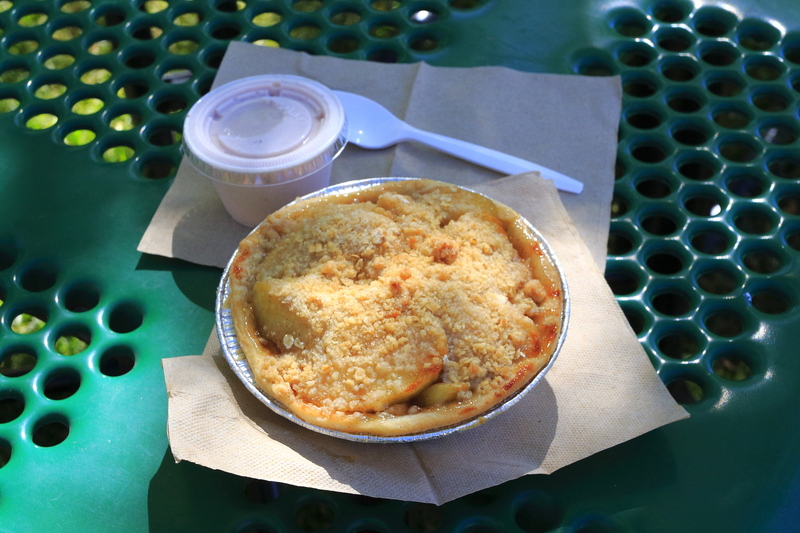 My Fruita lunch: apple pie and strawberry ice cream. The following morning, the sun put on a beautiful sunrise. 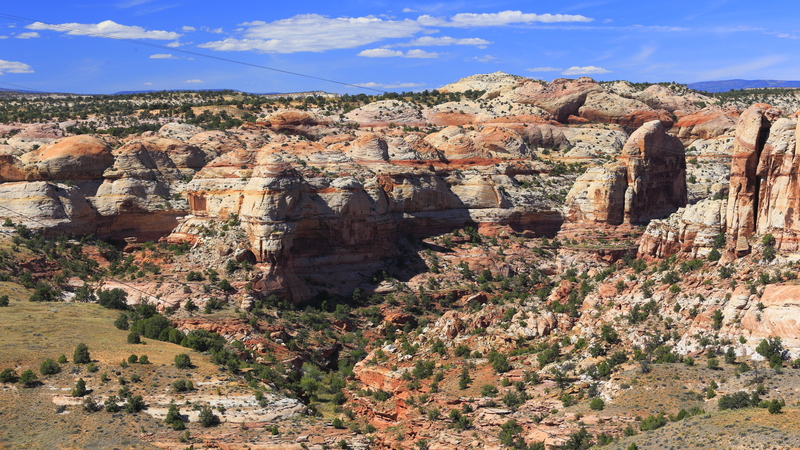 I took these photos from the hotel which was only 2 miles from Capitol Reef. 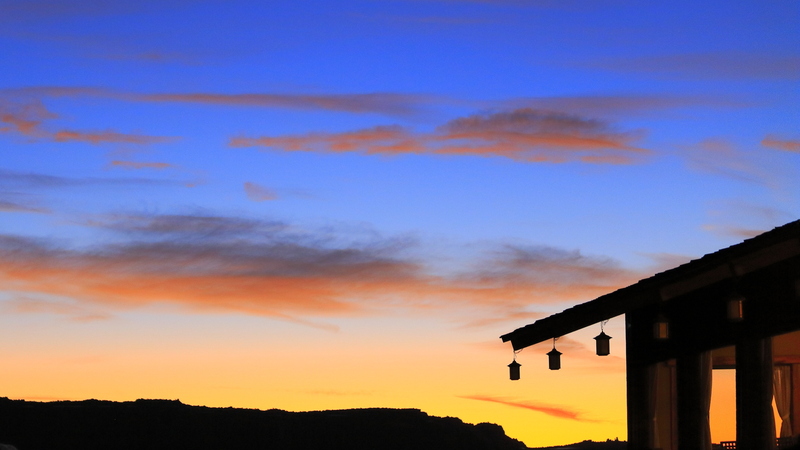 Sunrise over Capitol Reef, as seen from hotel. 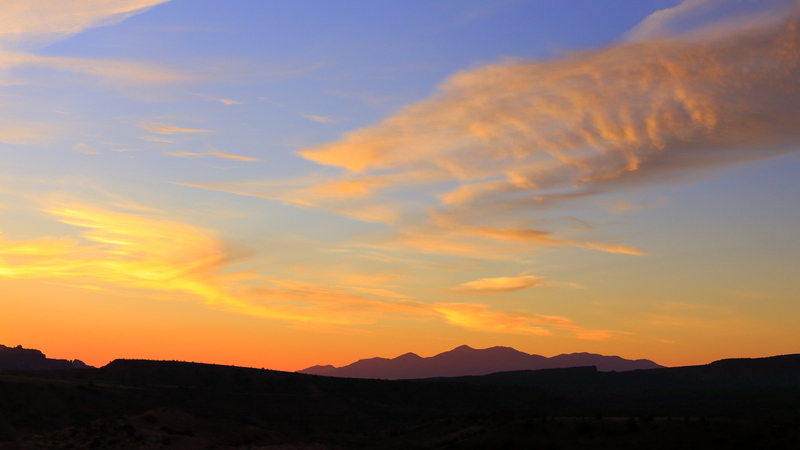 Sunrise over Capitol Reef National Park. 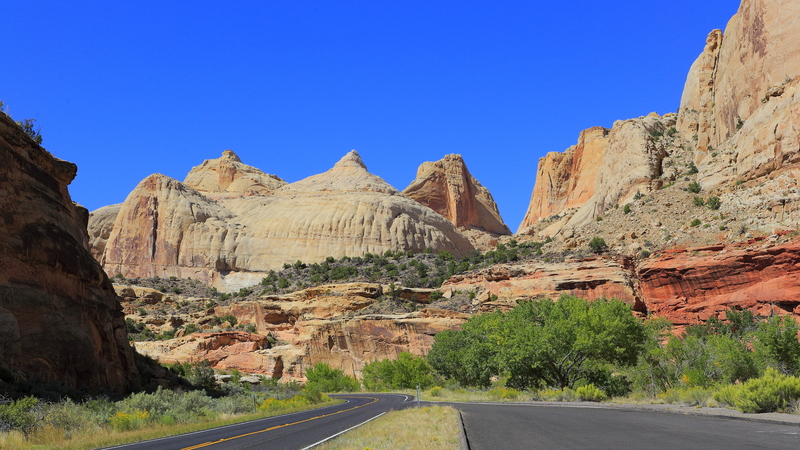 Going from Great Basin National Park to Capitol Reef National Park, I drove on Scenic Byway 12 (Highway 12) in Utah. It was one of the best drives I had ever experienced. It was 124 miles long, well paved, not too twisty, and goes through some of the most magnificent scenery in the world. 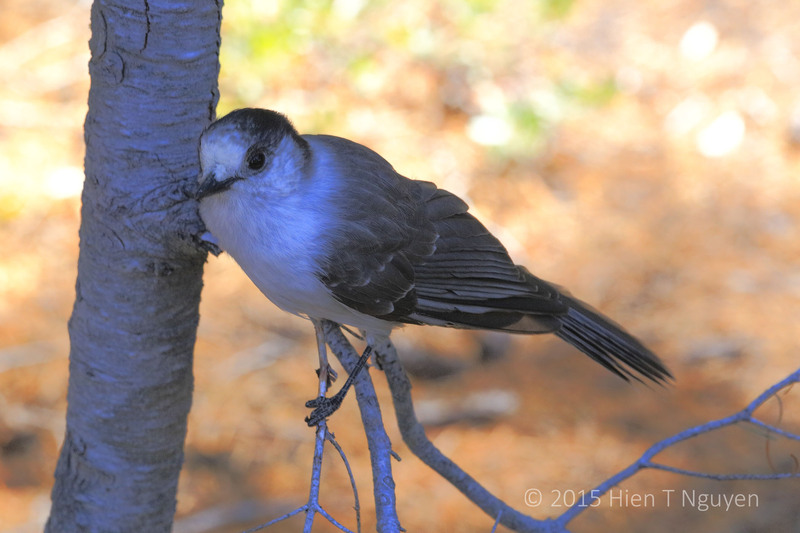 We only stopped briefly at Red Canyon, Bryce Canyon National Park, and the Boynton Overlook which was about midway, and I really think we should have spent more time and made more stops. 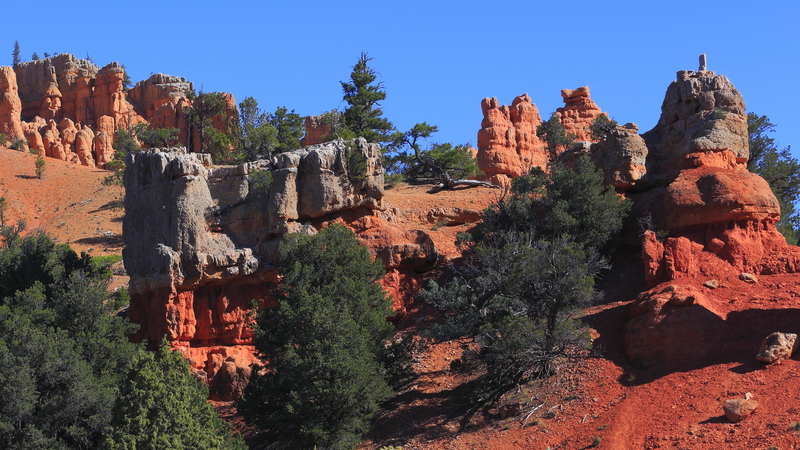 View of Red Canyon as seen from Highway 12 on the way to Bryce Canyon. 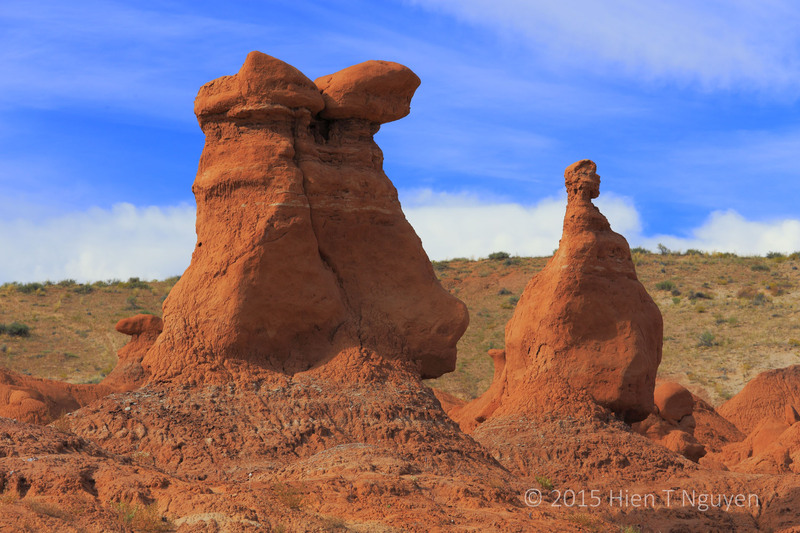 Hoodoos named Salt and Pepper shakers at Red Canyon. Bryce Canyon is one of the most photographed places on earth, and I’ve been there three times already. This fourth time, I went to Fairyland Point Overlook at the northern end of the park. 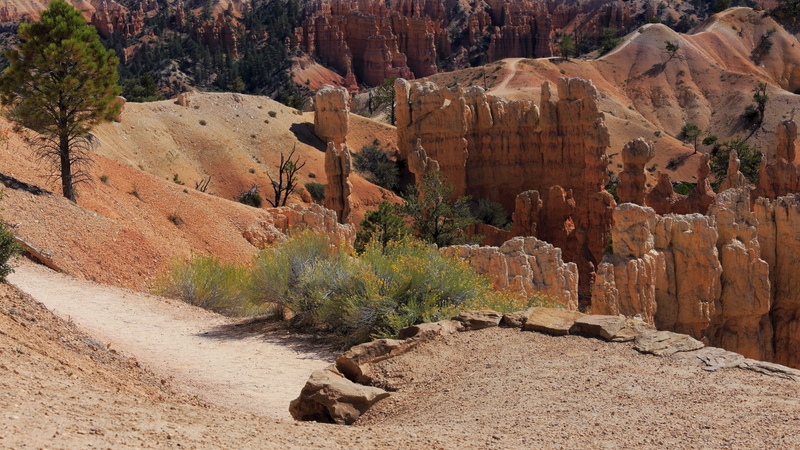 View of beginning of hiking trail from Fairyland Point Overlook at Bryce Canyon. 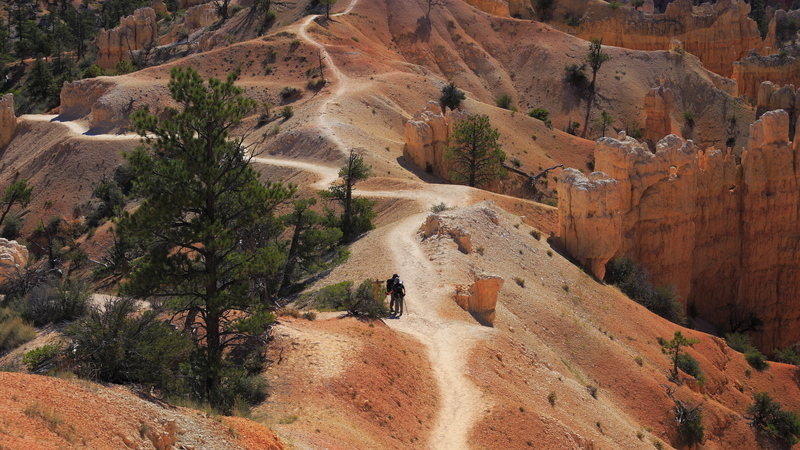 Hikers on trail, as seen from Fairyland Point Overlook at Bryce Canyon. 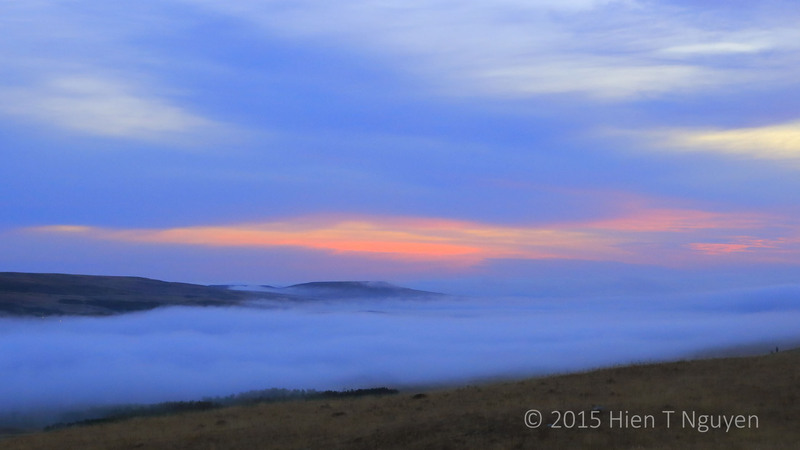 The views from Boynton Overlook on Highway 12 were simply spectacular, almost surreal. View from Boynton Overlook on Highway 12. Another view from Boynton Overlook on Highway 12. 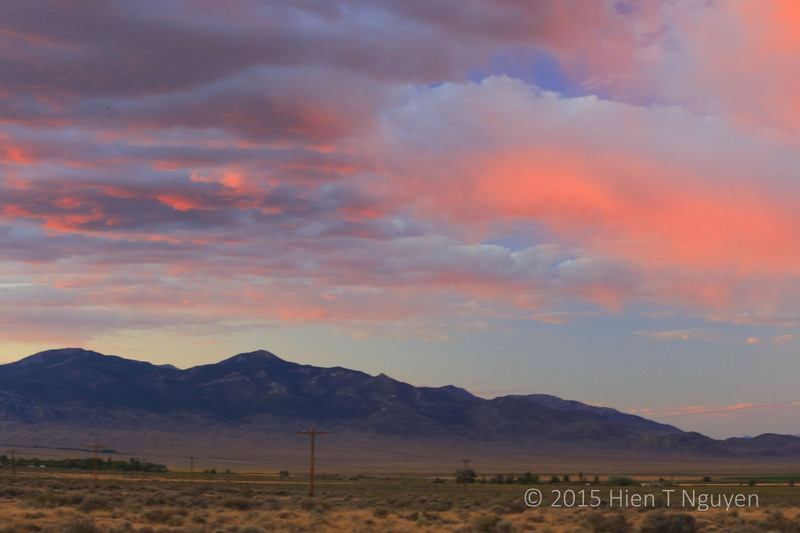 For our visit to Great Basin National Park, we stayed in the town of Baker (population 68) in Nevada near the border with Utah. 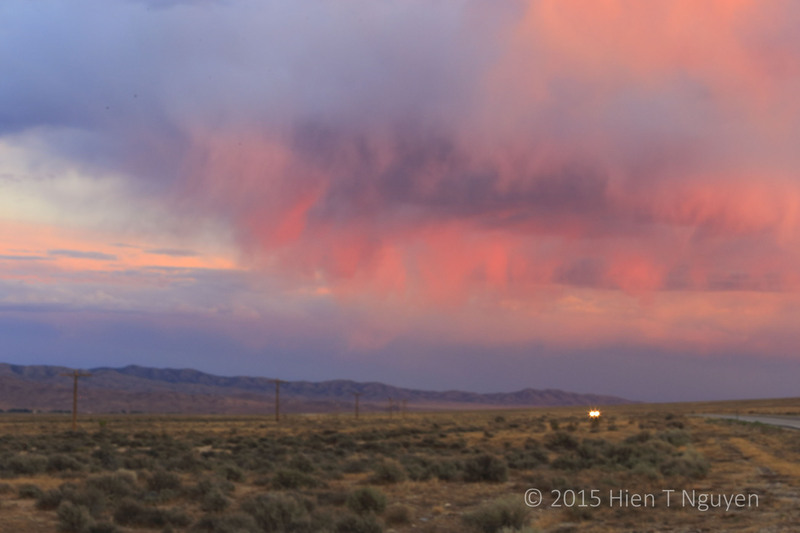 The best thing about Baker is that it is only 2 miles from the entrance to Great Basin. It has two motels, one restaurant that opens occasionally, and another one that you have to drive 6 miles to get to. My car, the Subaru Outback, parked at the Border Inn in Baker, NV. The day we arrived, a beautiful sunset put on a wonderful show. 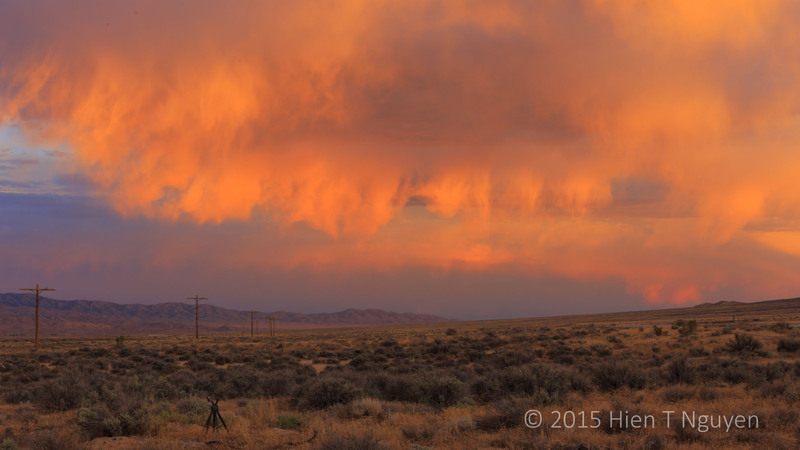 View from Baker, NV at sunset. 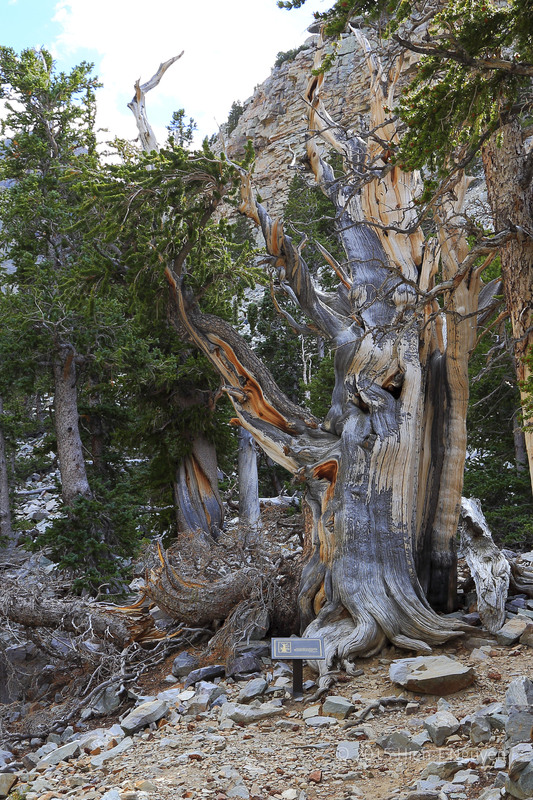 The following day, Great Basin was in full splendor, its mountainsides covered with yellow aspens. 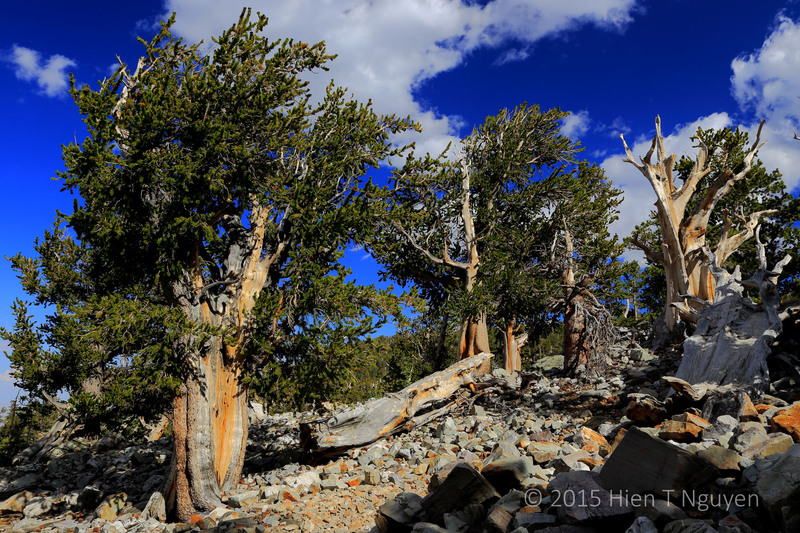 Mountainside at Great Basin National Park. 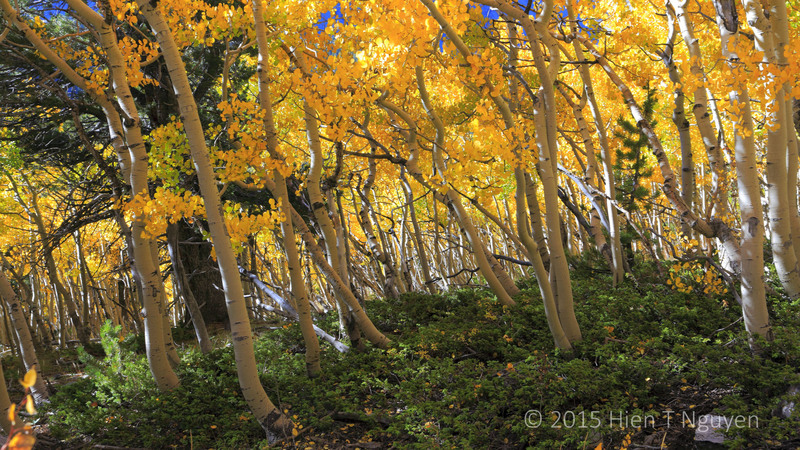 Aspens seen along hiking trail at Great Basin National Park. 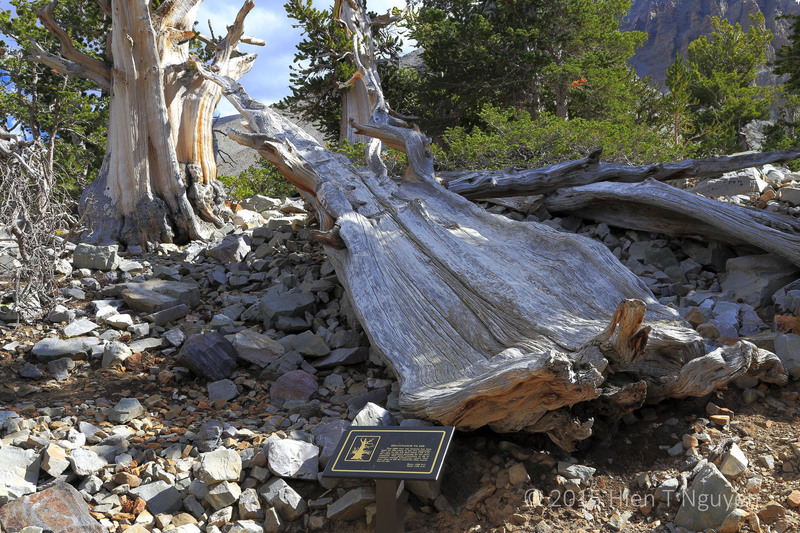 The Alpine Lakes Loop Trail at Great Basin takes you to two alpine lakes, Stella and Teresa. You start out at 9,800 ft (2,987 m) and climb about 600 ft (180 m) over 1.5 miles. 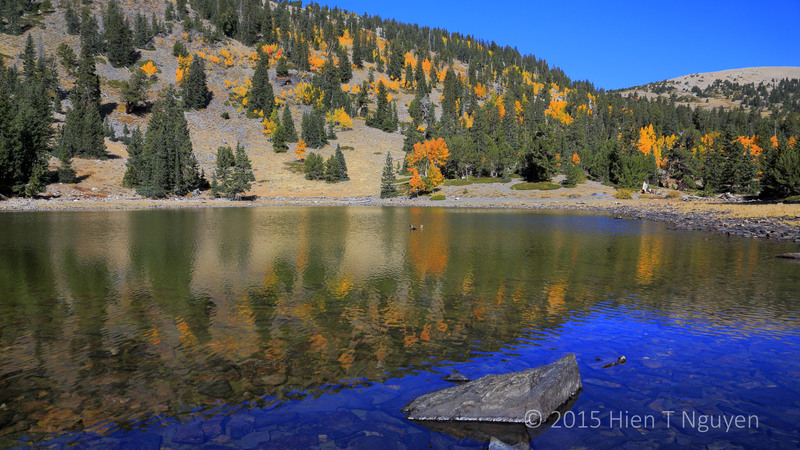 Stella Lake, an alpine lake at Great Basin National Park. 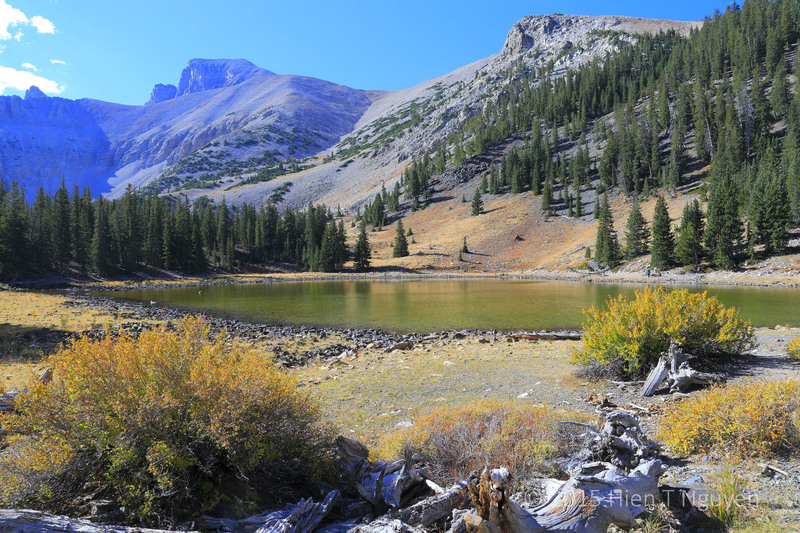 Stella Lake at Great Basin National Park. The water was crystal clear, and not very deep. 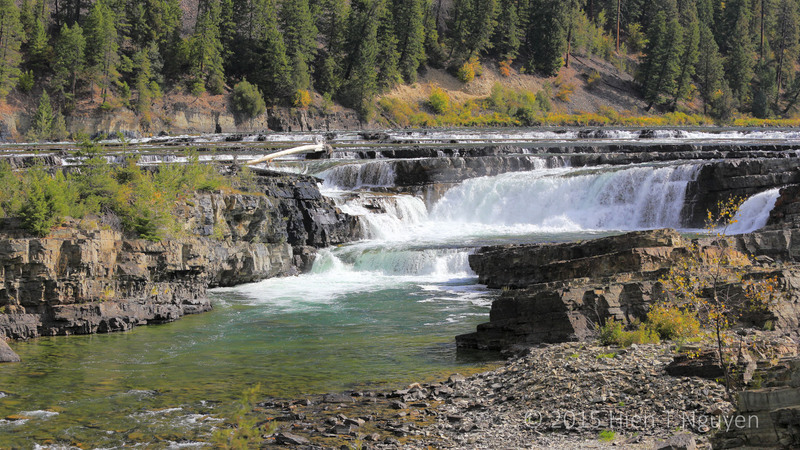 One of the nicest place I visited during this recent road trip was Kootenai Falls near Libby, MT. It was easily accessible, and the falls wild beauty was unmistakable. 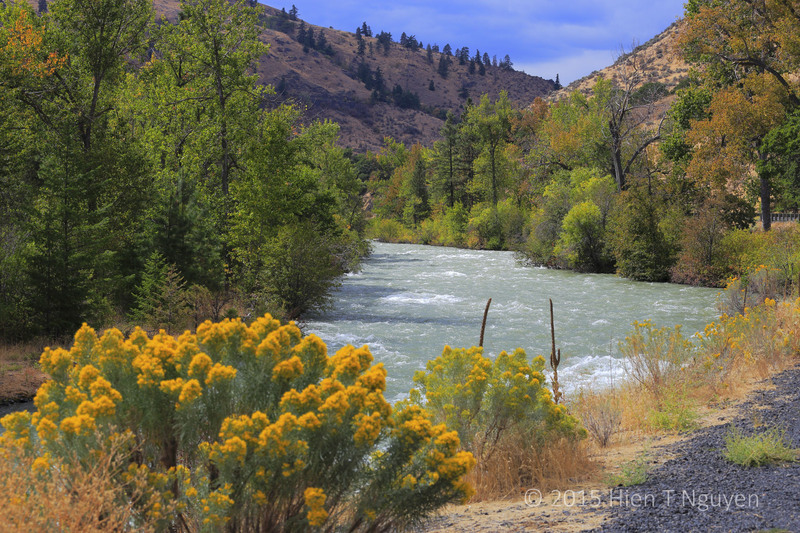 Parts of the movie The River Wild, a drama involving whitewater rafting, were filmed on the Kootenai River near the falls. Kootenai Falls drop 90 ft (27 m) in less than a mile, and their height is 30 ft (9 m), so rafting over the falls is not encouraged, but some kayakers have gone over them at their own peril. 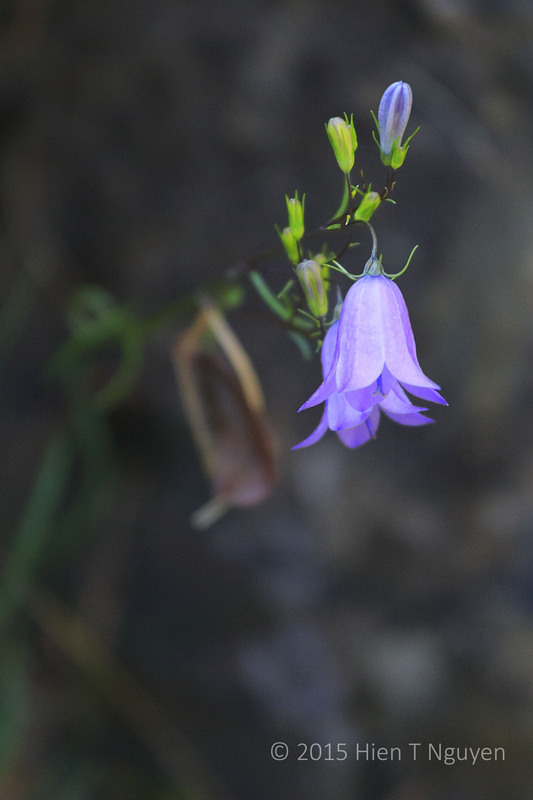 As I walked along the falls, I saw something very appealing: Mountain Bluebells in a narrow crevice in the rocks. In all the Western states we traveled through, the ubiquitous sagebrush grew along highways and everywhere else where most plants would not survive. I had to capture this sturdy icon of the West in the following shots. 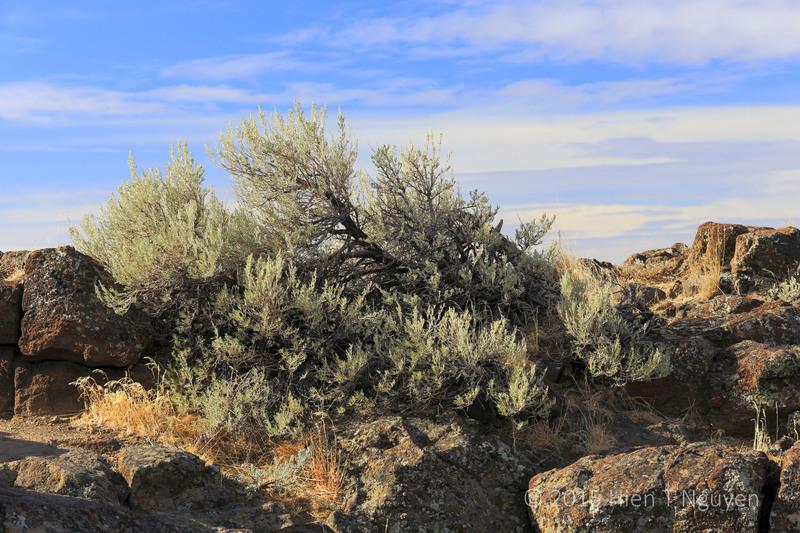 Sagebrush growing at an overlook near the Columbia River. 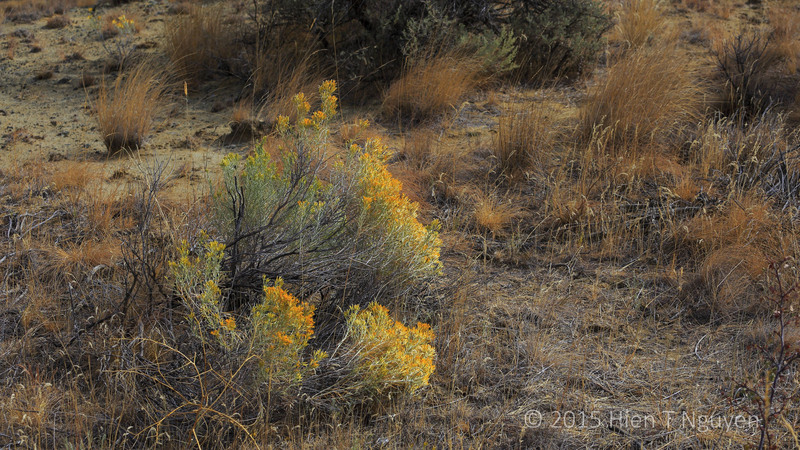 Flowering sagebrush at a rest area in Washington state. Windmills too have sprouted in the wild, at places reputed to be windy, although I saw very few blades rotating when we passed by them. 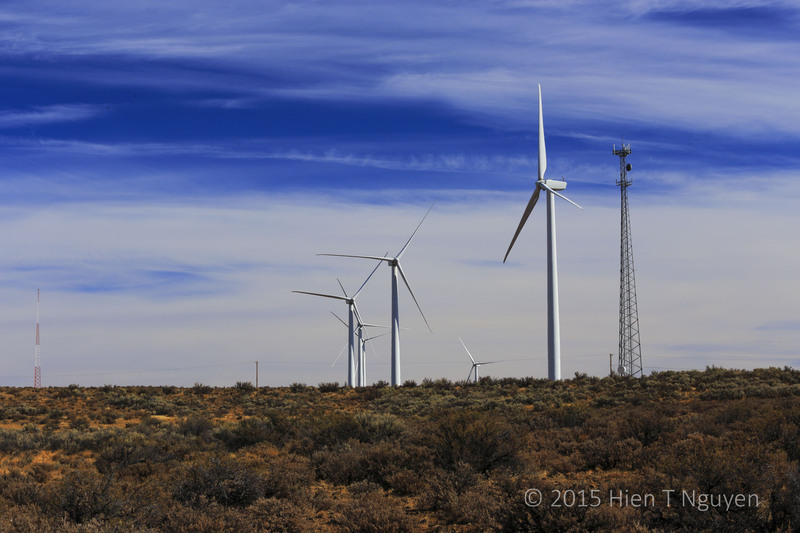 Windmills in Washington state near Columbia River. A friend asked me whether I saw Mt Rainier and I said yes. However, on second thought, I never actually saw Mt Rainier because it was always shrouded in clouds both days we were there. I drove up twice to Paradise which was a mere 5,000 ft (1,500 m) from the summit, but it did not make any difference. All I saw were clouds. Mt Rainier from 20 miles away, hiding behind clouds. 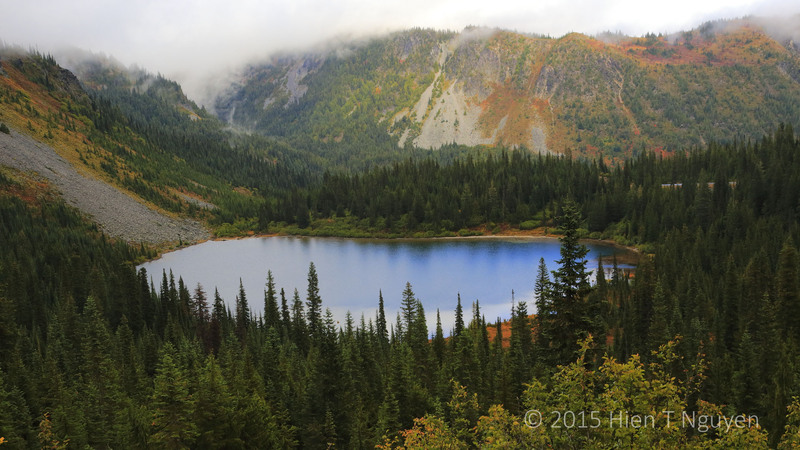 However, the drive passed by Reflection Lakes, which made for wonderful photography. Here’s one of the lakes you can see from the road. 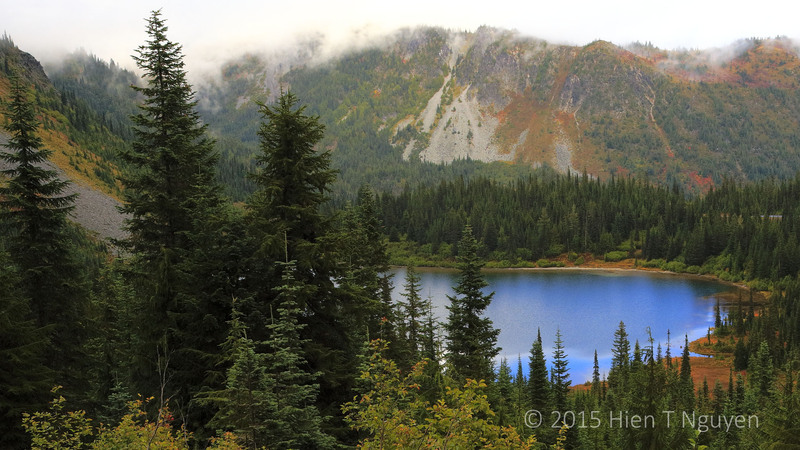 Reflection Lake with Mt Rainier behind clouds in the background. Another look at Reflection Lake, from a different angle. Another view of Reflection Lake. 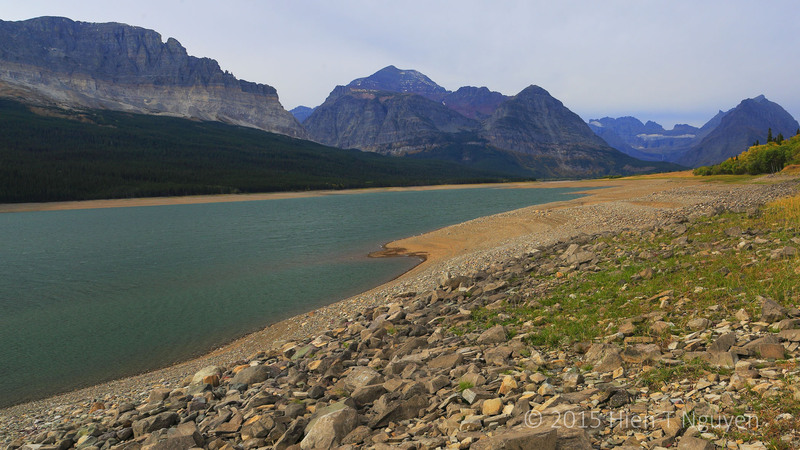 We spent a total of a day and a half at Glacier National Park, not nearly enough, but we did manage to visit Two Medicine, Many Glacier, and drive along Going-to-the-Sun Road which roughly divides the park into northern and southern halves. Our first afternoon was sunny but windy, with constantly shifting clouds. 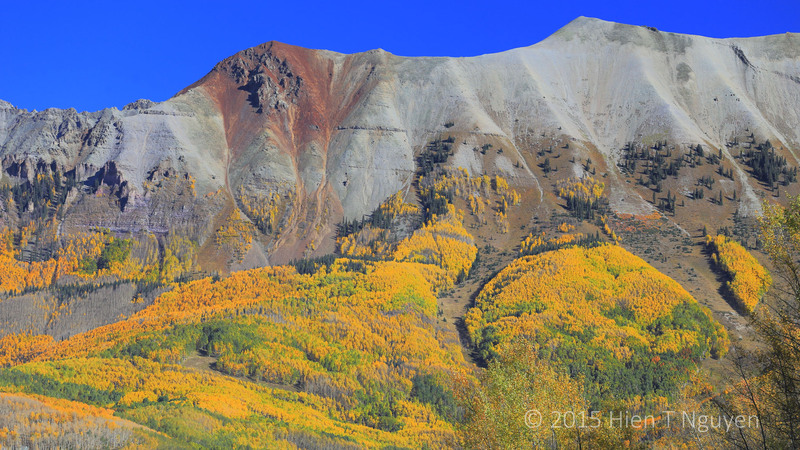 Aspens were near their fall colors peak. Two Medicine Lake at Glacier National Park. The clouds were changing constantly due to high winds. The following day started with thick fog and a colorful sunrise near the town of St Mary, the eastern entrance to Glacier National Park. 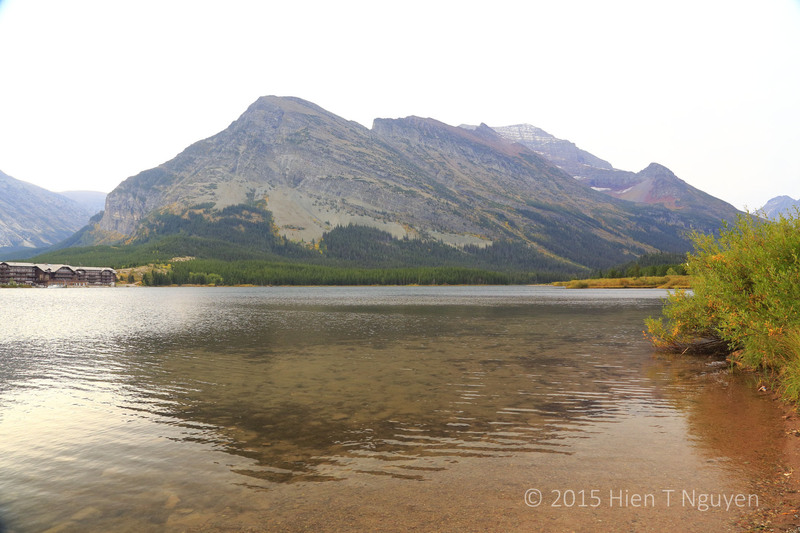 In the Many Glacier area, the only decent shot I got was one of Lake Sherburne. 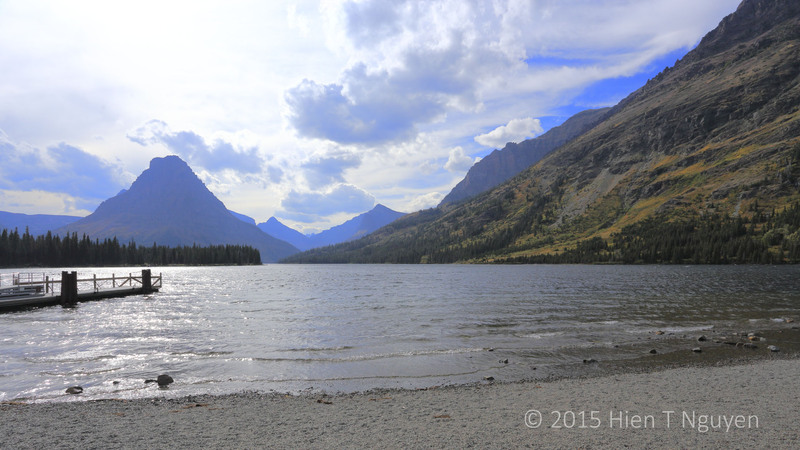 View of Lake Sherburne in Many Glacier area of Glacier National Park. Water level in the lake was very low because of the drought. Going-to-the-Sun Road was a nice drive, despite the overcast sky. The following two shots give you a taste of what the scenery looked like from the road. 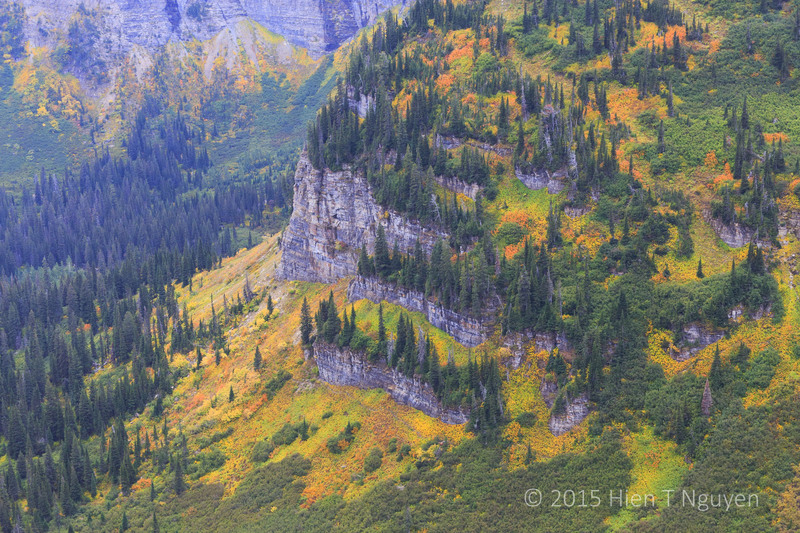 Steep slopes and deep valleys as seen from Going-to-the-Sun Road. 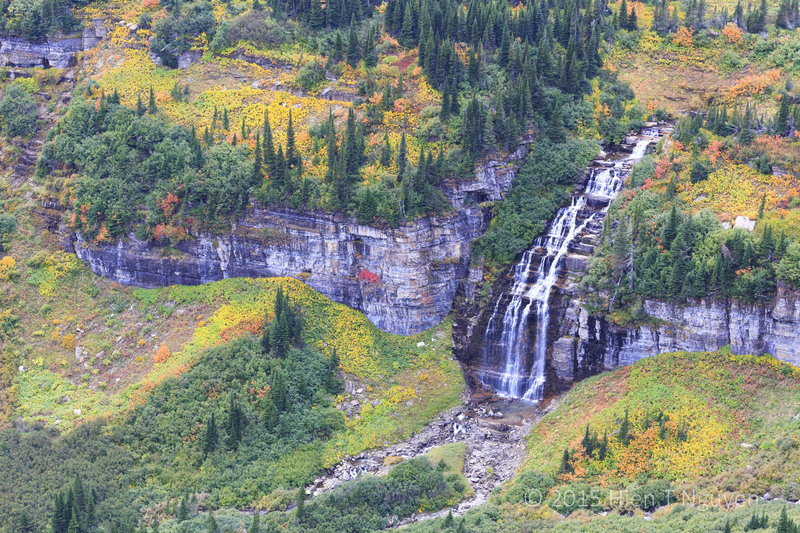 There were many waterfalls along Going-to-the-Sun Road. Even though they did not have as much water as in the spring, they still provided interesting views more appealing than the gloomy sky. 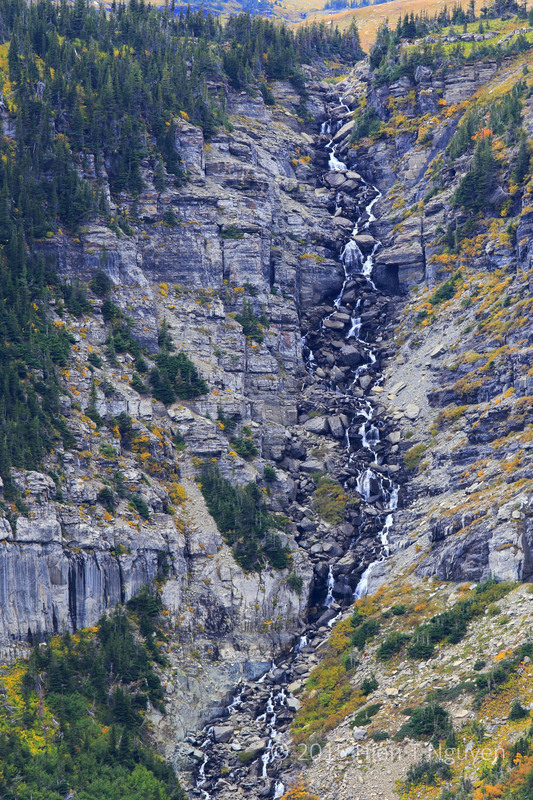 Waterfall seen from Going-to-the-Sun Road. Haystack Creek Falls flowing under a bridge on Going-to-the-Sun Road. It is much more impressive in the spring when lots of water cascade down the mountains. 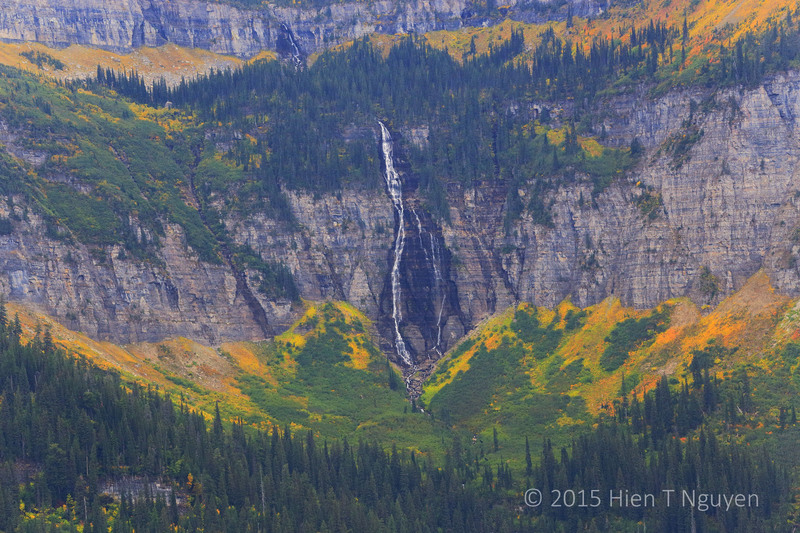 Finally, the highest waterfall in Glacier National Park: Bird Woman Falls. It is named not for Sacajawea, but for the wife of either Old Sun or Lone Walker. Bird Woman Falls seen from 2 miles away. A sign said Bird Woman Falls was 492 ft (150 m) tall, but the World Waterfall Database puts its height at 960 ft (293 m). That height includes an upper drop of 175 ft (53 m) seen near the top of the above photo, a larger tier of 560 ft (171 m), and a number of cascades between the two. 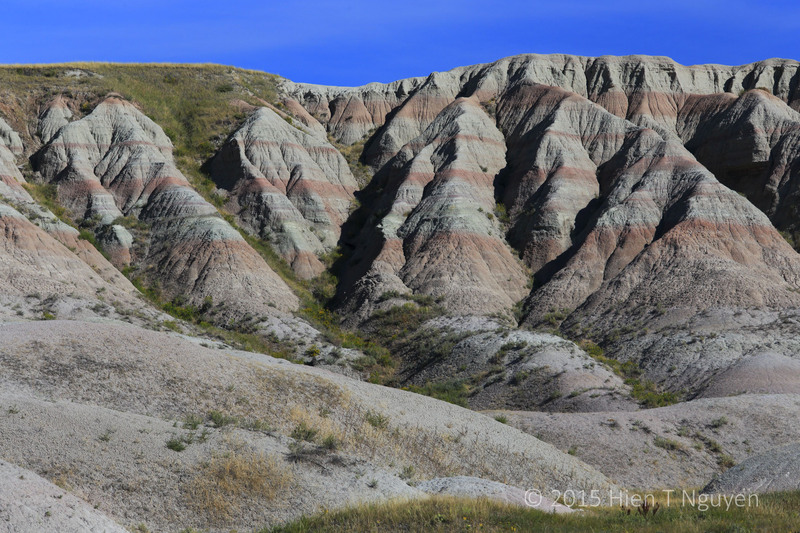 Here are some more photos I took at Badlands National Park near Wall, SD in early September. 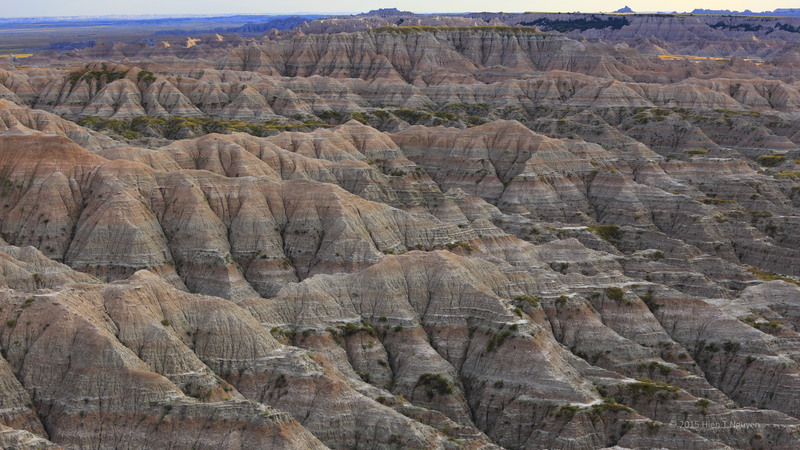 The Badlands consist mainly of sedimentary rocks deposited from 26 to 75 million years ago. Erosion from rivers and streams began 500,000 years ago and is occurring at the rate of one inch per year. So this area is constantly changing from one year to the next, and it is estimated that it will be completely eroded in another 500,000 years. Sedimentary rocks are friable. 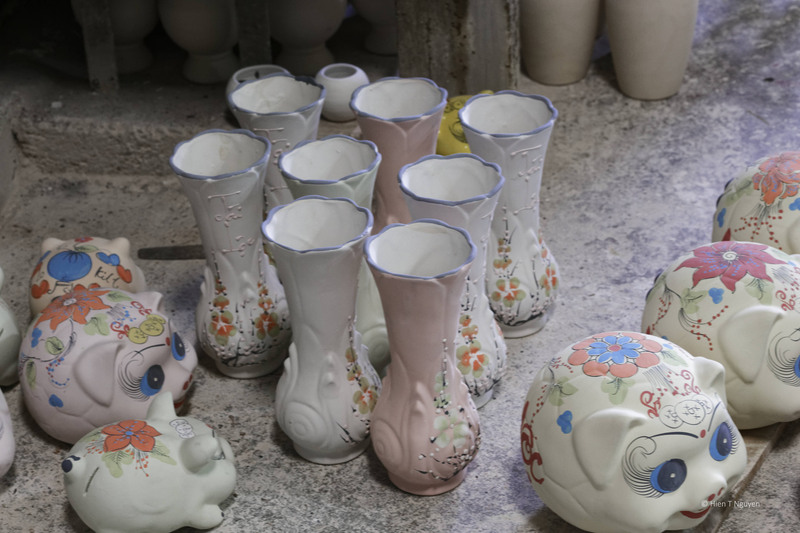 When you walk on them, it feels like walking on compacted sand that crumbles under your feet. People do hike trails that go up ridge lines so that they can explore and view the area from some height. Many fossils have been found in the various rock layers, and more fossils continue to be discovered as erosion uncovers them. 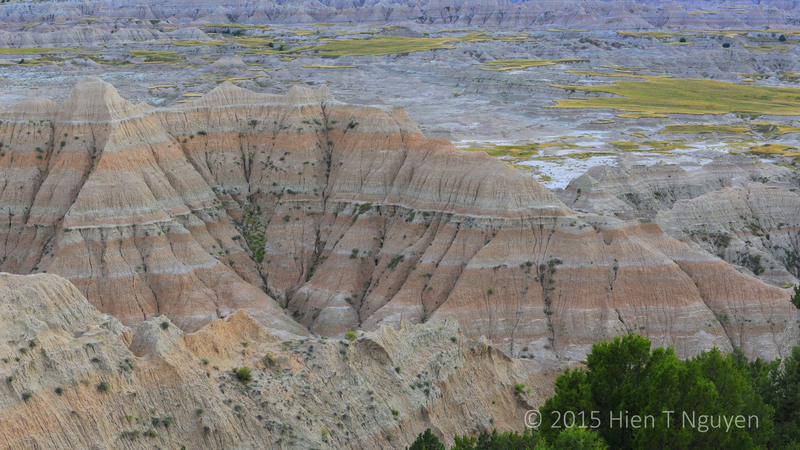 My car at Badlands National Park as another one was pulling out of parking lot at the Yellow Mounds Overlook. From September 7 to October 10 of this year, a friend and I completed a road trip that some have qualified as “lifetime”. 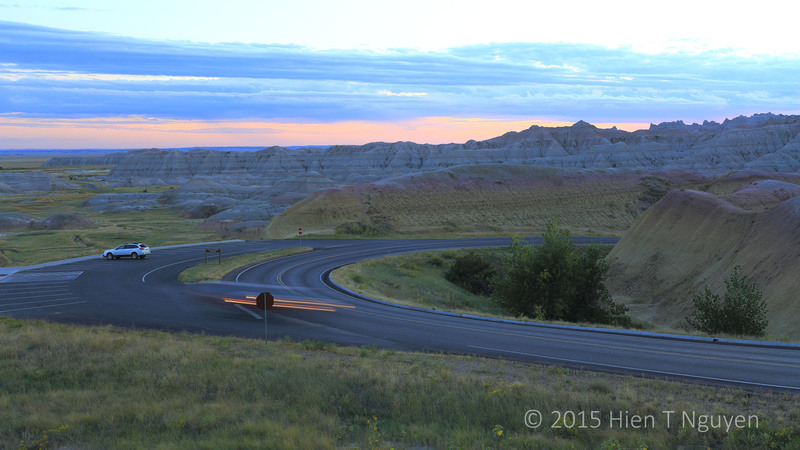 Over 33 days, I drove 9,714 miles (15,633 km) through 21 states. We successively visited the following places, and I’ve added links to the posts related to each so that you can click on them to view the photos taken at each location. 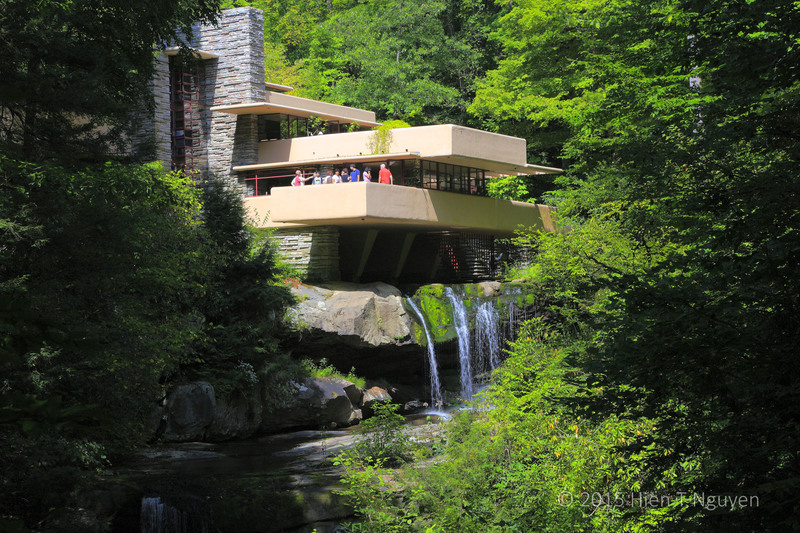 Frank Lloyd Wright’s Falling Water house in Mill Run, PA.
Purdue University in West Lafayette, IN. 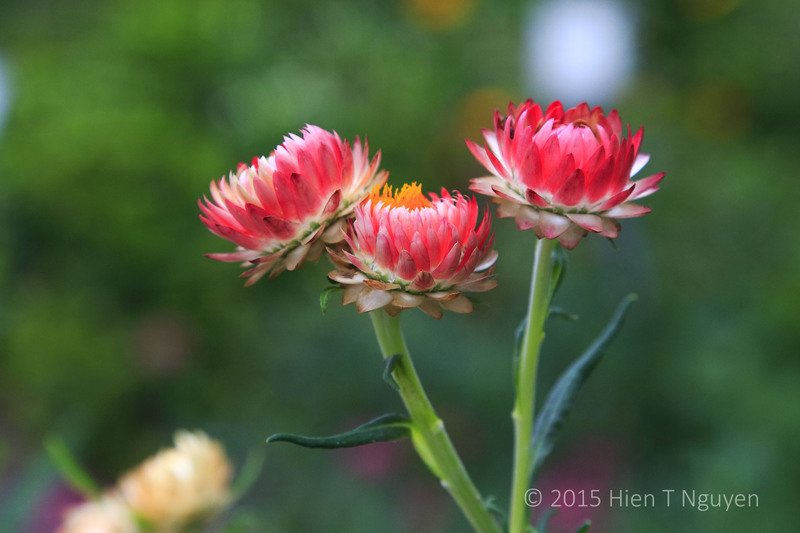 Shirley Welden Butterfly House (Calkins Nature Area) in Iowa Falls, IA. Mt Rushmore National Monument in South Dakota. Devils Tower National Monument in Wyoming. Kootenai Falls, in Libby, Montana. Mt Rainier National Park in Washington. 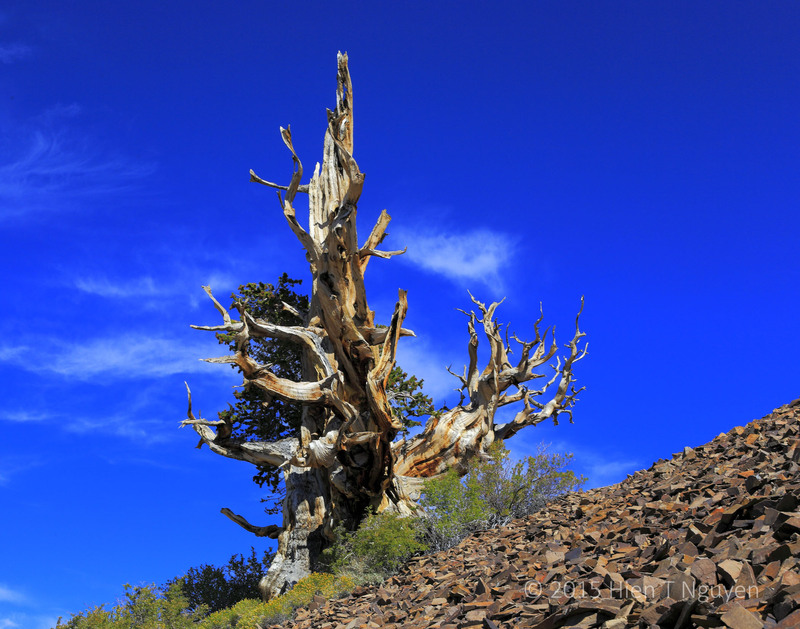 Ancient Bristlecone Pine Forest in California. Red Canyon and Bryce Canyon National Park in Utah. Capitol Reef National Park in Utah. Goblin Valley State Park in Utah. Dead Horse Point State Park in Utah. Canyon De Chelly National Monument in Arizona. Four Corners Monument in Arizona, Colorado, New Mexico, and Utah. 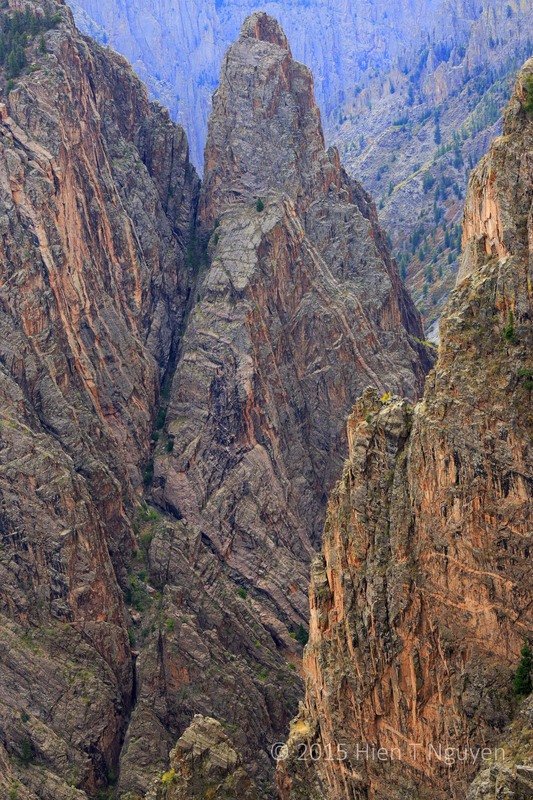 Black Canyon of the Gunnison National Park in Colorado. Mesa Verde National Park in Colorado. I took 3,021 photos and my friend probably took about the same number. Now that we are safely back home, I will go back through my files and comb through them for the more interesting shots worthy of being posted on this blog. 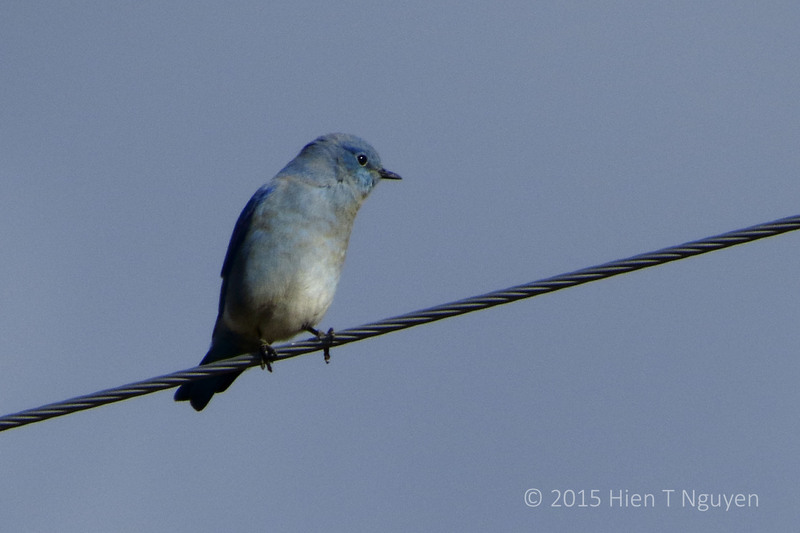 On our last day at Great Sand Dunes, a Bluebird flew and perched on an electric wire near where I stood. I had never seen one before, either back in New Jersey or out West, so I promptly pulled out my camera and took the following shot. Western Bluebird. It looked sad. 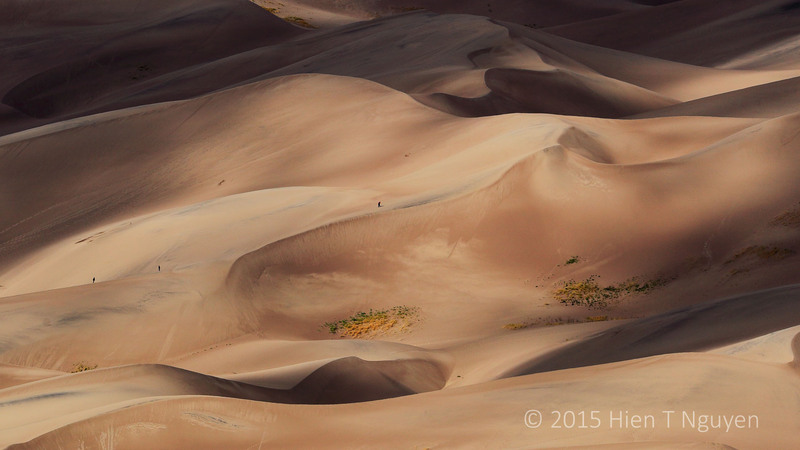 Today I spent from sunrise to sunset revisiting Great Sand Dunes National Park and taking photos to record what I saw. From the Great Sand Dunes Lodge where we stayed, I went out before sunrise and saw the dunes in semi darkness. They were stark, almost uninviting. Great Sand Dunes at dawn. 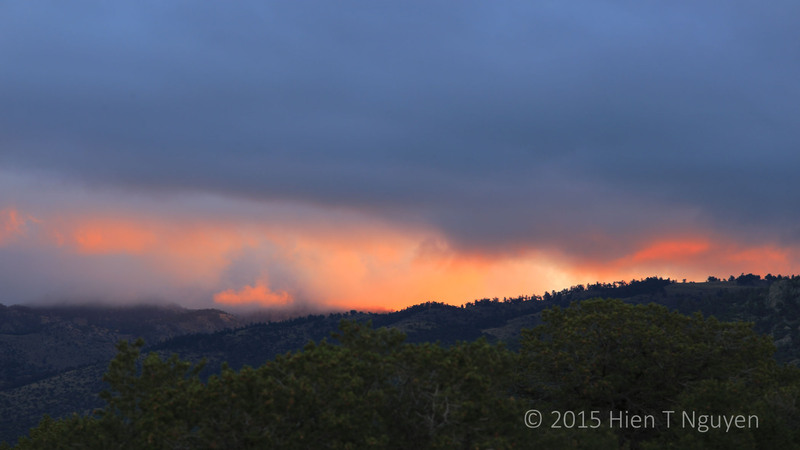 Soon enough the sun rose over the Sangre De Cristo mountains, setting clouds (it had rained the night before) on fire. Sun rising behind the Sangre De Cristo mountains. Finally sunlight fell on the dunes, a scene I won’t ever forget. 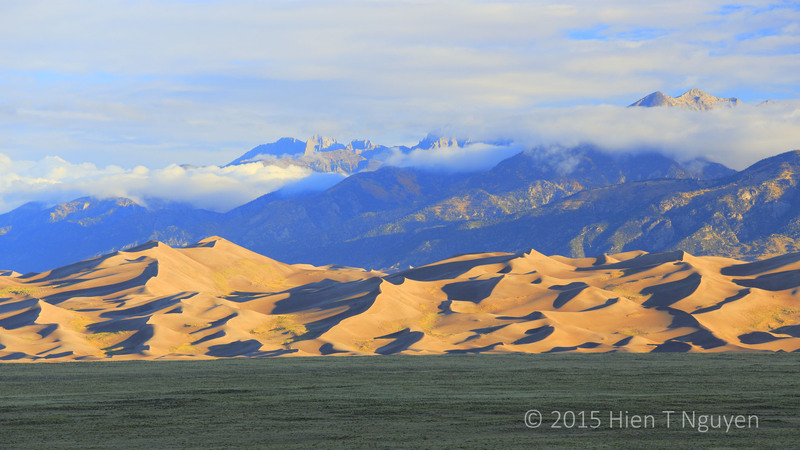 Great Sand Dunes bathed in early morning light. Later on I went on a short hike up to an overlook point on a nearby hill. 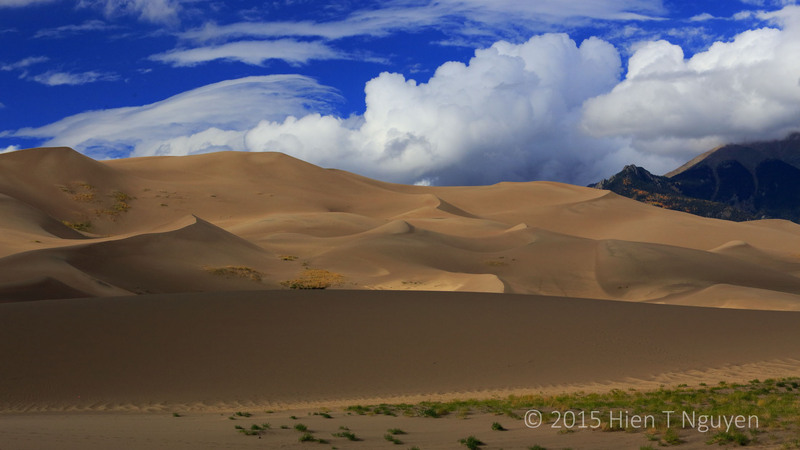 Clouds filled most of the sky, but once in a while enough sunlight came through to illuminate parts of the dunes. 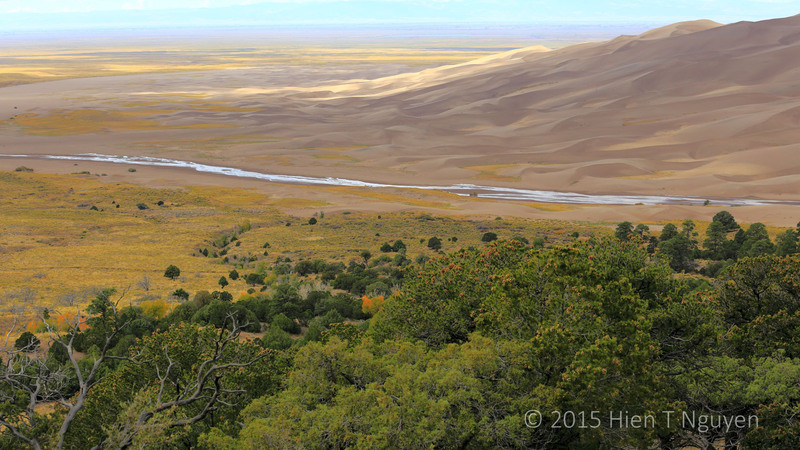 Great Sand Dunes from overlook point. 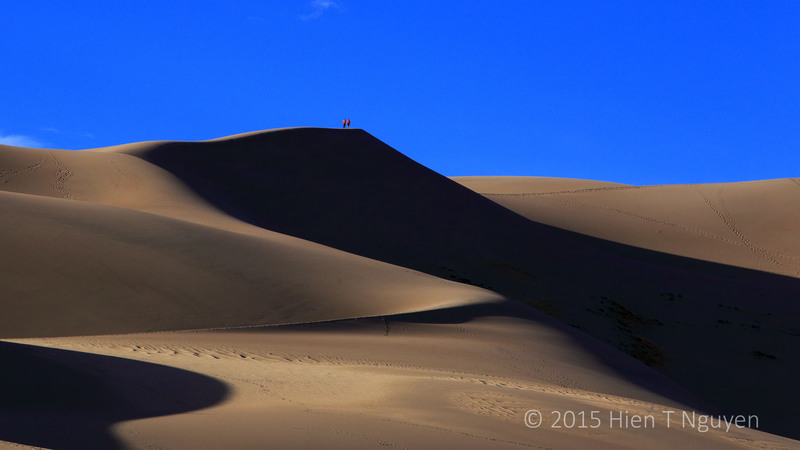 As noon approached, the dunes revealed more and more of their beauty. 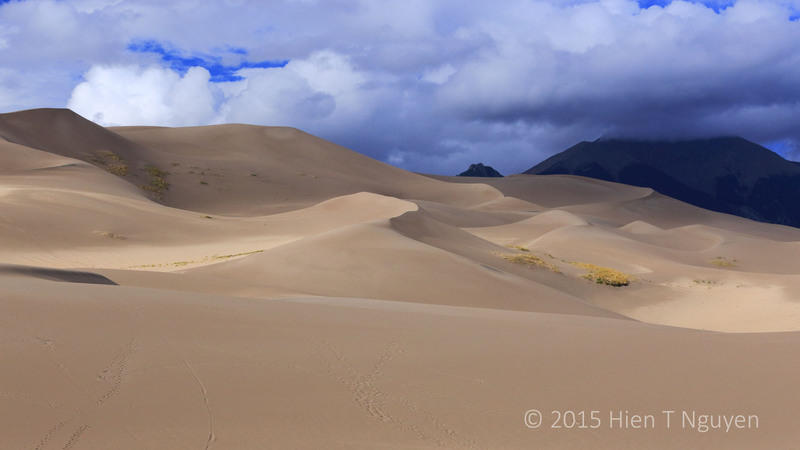 Great Sand Dunes around noon time. 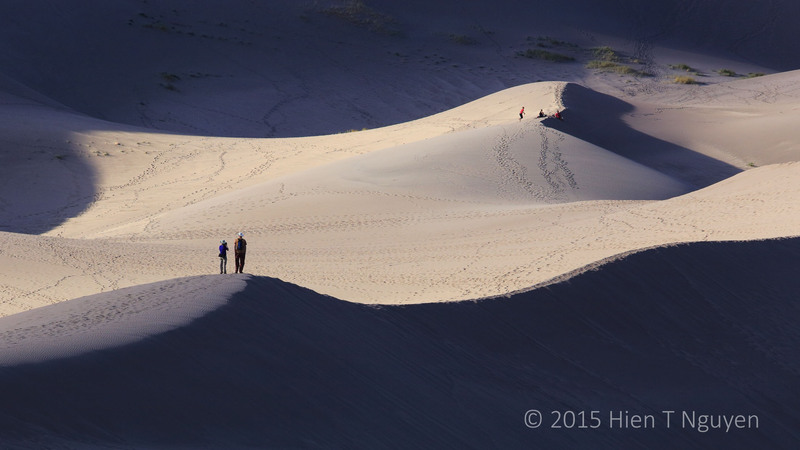 Later in the afternoon, I went back and walked toward the dunes, following hikers of all ages. 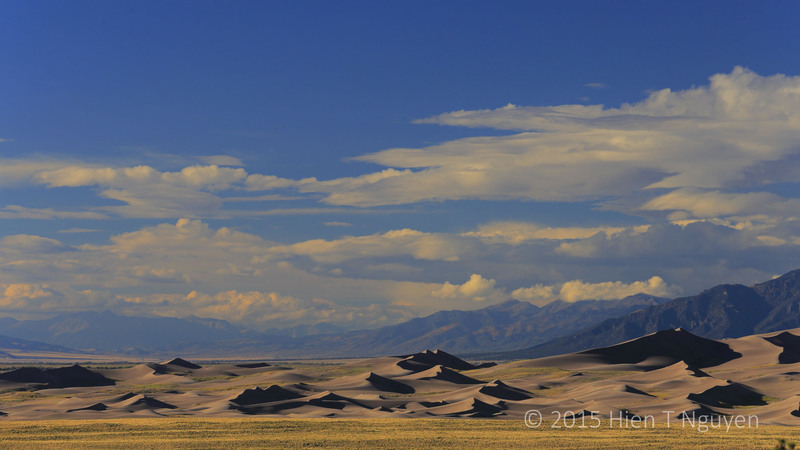 Great Sand Dunes in late afternoon. 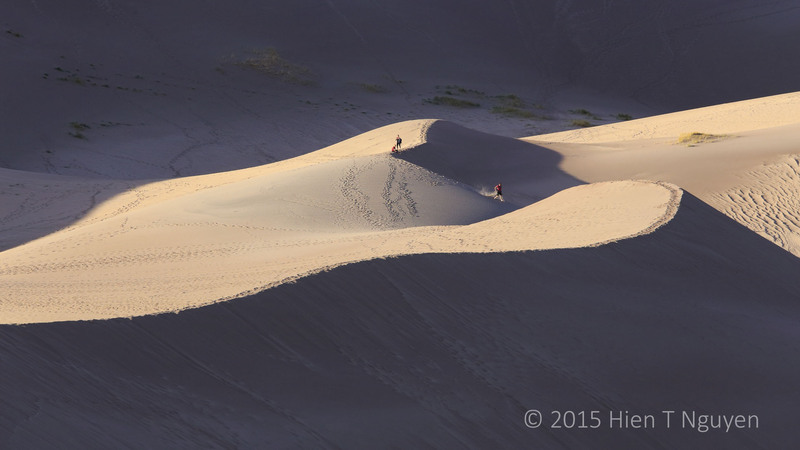 There were hikers on their way up to High Dune (650 ft) or even Star Dune (750 ft). Some even ran down the slopes leaving trails of dust behind them. 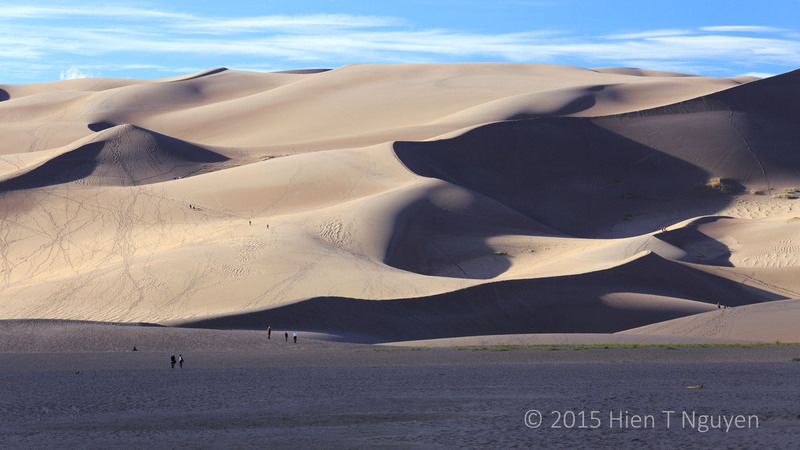 Great Sand Dunes National Park is a very family friendly park. 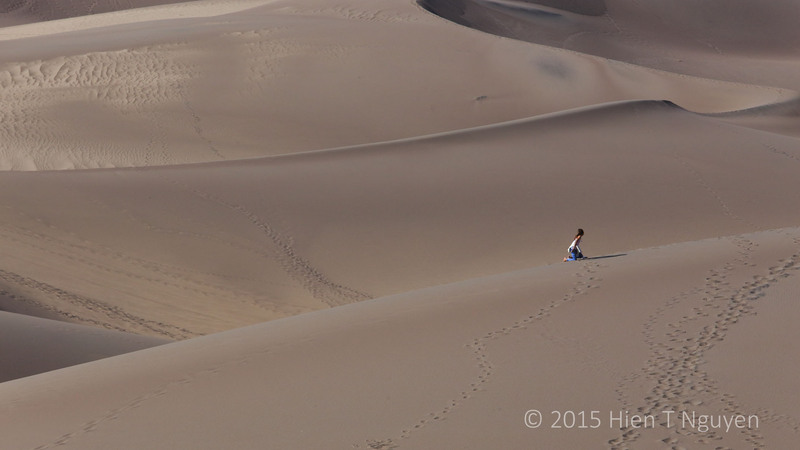 I saw parents with kids hiking along the mountain trails around the dunes, or running up the dunes and sliding or simply rolling down the slopes. In the spring and early summer, snow melt produces enough water for Medano Creek which runs right next to the dunes. The creek, with about a foot of water, is then a great playground for youngsters. Today we went from Cortez to Mosca, both cities in Colorado, to visit Great Sand Dunes National Park, our last stop before heading home. It rained almost all the way, the first rainy day on our road trip. 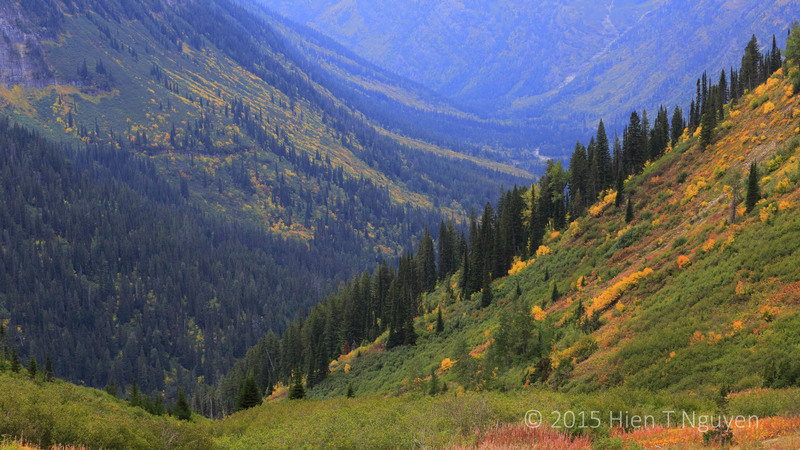 Up high in the mountains I could see aspen trees, their fall foliage muted by rain clouds and fog. As we came near Mosca, the sky brightened a bit. 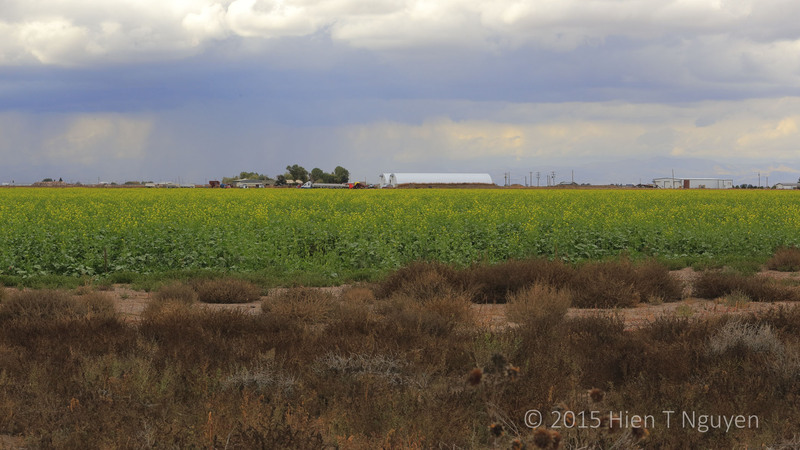 I saw two big fields of canola with yellow flowers stretching to the horizon. 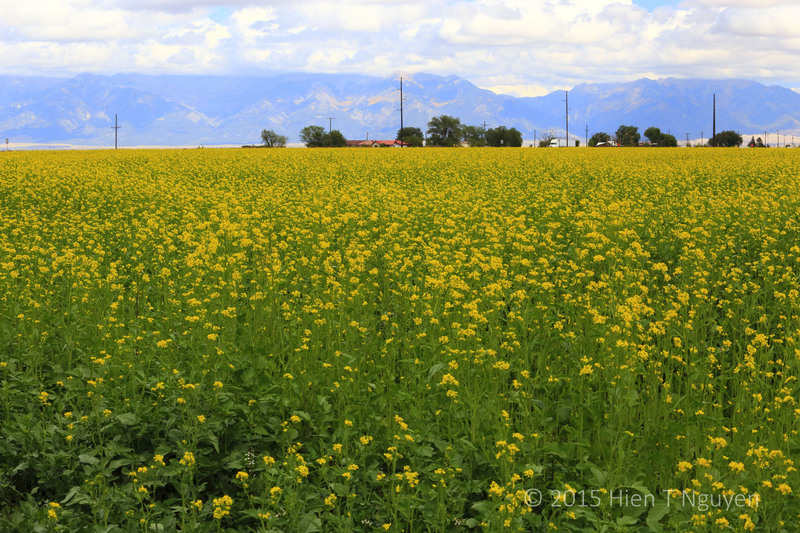 Canola field near Mosca, CO, with the Sangre de Cristo mountains in the background. Looking back the way we came, the other field was more subdued against a backdrop of rain clouds. Another canola field near Mosca, CO.
We arrived at our hotel in the early afternoon and lost no time in going to the Great Sand Dunes. We got some maps, attended a ranger geology briefing, watched a movie, and still had time to take pictures of the dunes. 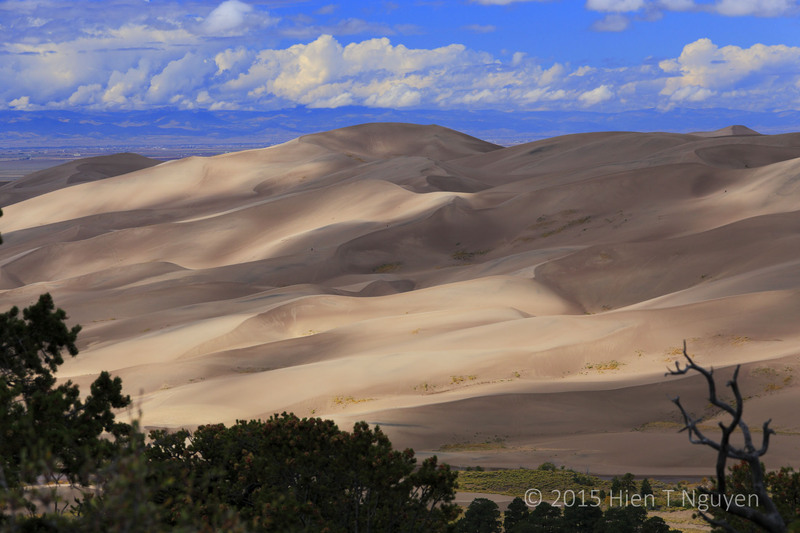 A view of Great Sand Dunes National Park. 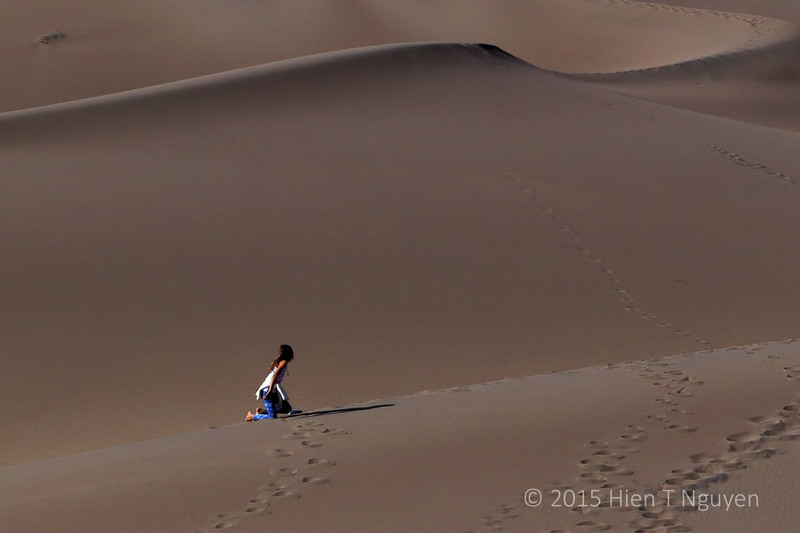 Girl running barefoot at Great Sand Dunes. She had to sit down briefly. 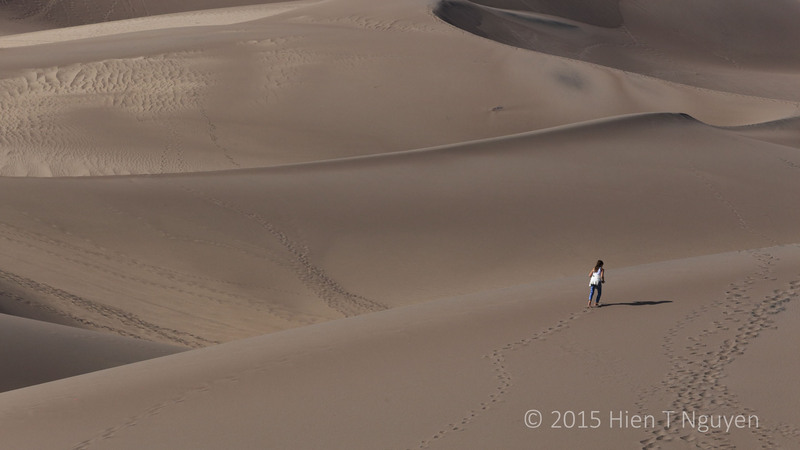 The park recommends that people wear shoes when hiking the dunes. She finally got up and followed her companions. 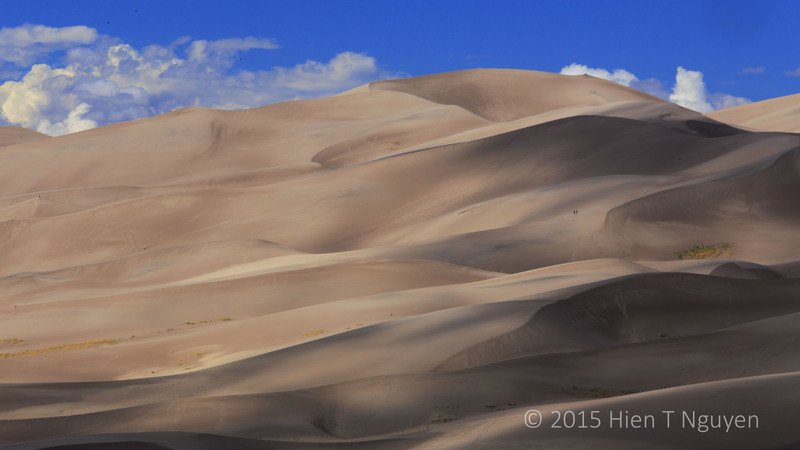 Another view of Great Sand Dunes National Park. 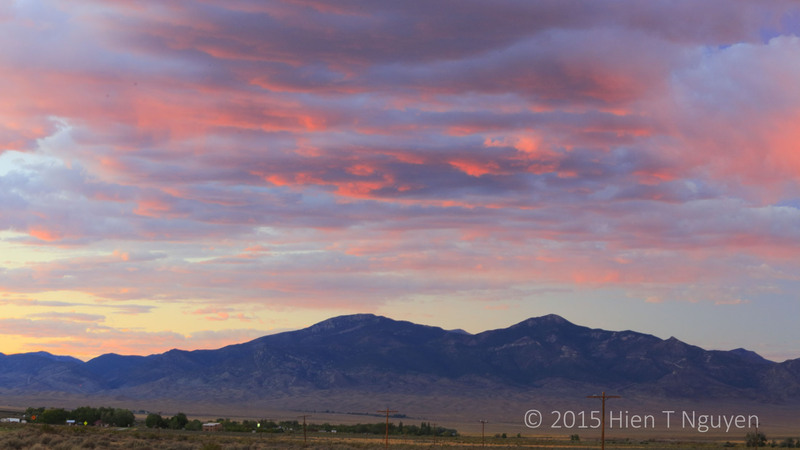 View of Great Sand Dunes at sunset, from our hotel room, with the Sangre de Cristo mountains behind them. Mesa Verde National Park, near Cortez, CO, is different from all the other national parks I have visited up to now. It does not have dramatic scenery or breathtaking vistas. However, for the whole day today it has drawn me into the ancestral Puebloan architecture and their history of survival in one of the harshest environment of the American Southwest. They lived in Mesa Verde some 700 years from 550 to about 1300 before moving on further south. They left ruins of houses and sometimes of entire villages that archaeologists are still studying today. I took over 200 photos, not all perfect mind you, and I hope the following will give you a taste of Mesa Verde if you haven’t been there yet. We arrived at the Visitor and Research Center early to buy tickets for a ranger guided tour of the Balcony House. 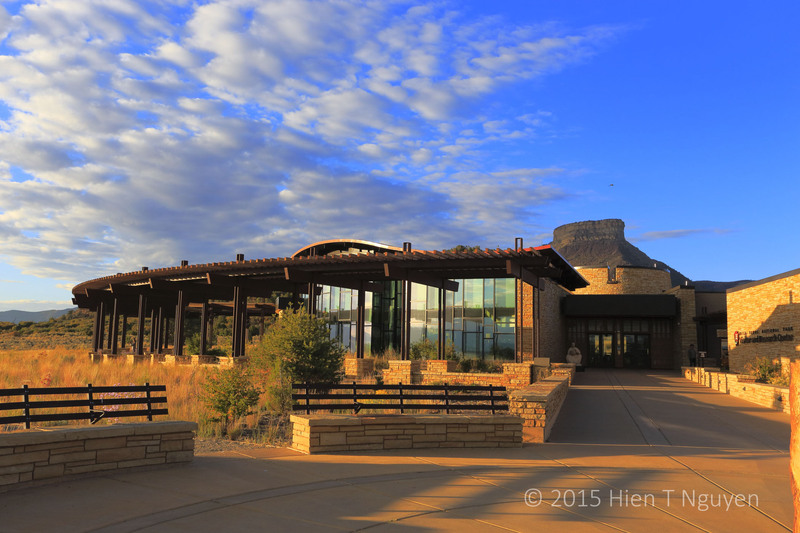 New Mesa Verde Visitor and Research Center, opened in December 2012. Climbing ladder to reach Balcony House. A view of Balcony House. Kiva, or ceremonial room, at Balcony House. 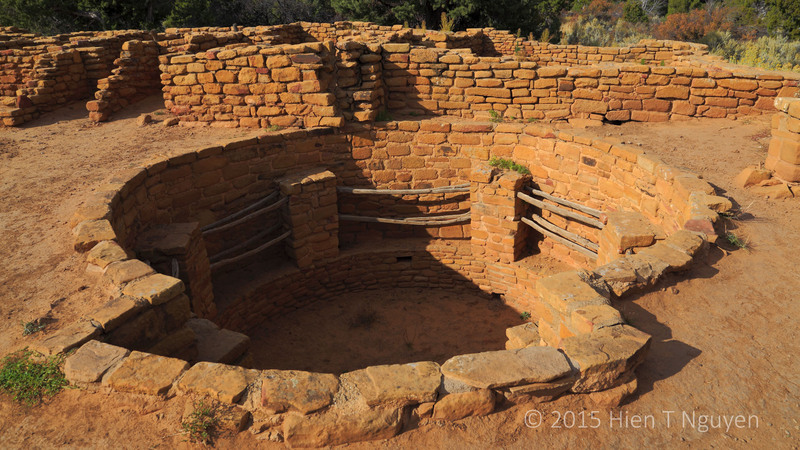 Square Tower House, the tallest at Mesa Verde. A corner of Spruce Tree House. Mesa Verde New Fire House. Mesa Verde Far View House, with kiva in foreground. Miles driven to date: 7,370 miles. Today we reversed our route and went from Montrose, CO to Cortez, CO in preparation for a visit to Mesa Verde National Park. 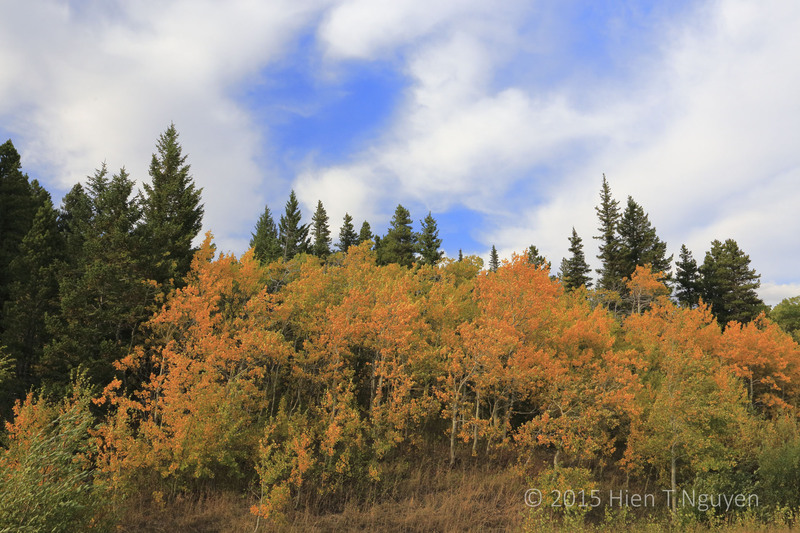 What should have taken less than 3 hours became a more than 5 hours drive as we kept stopping to marvel at the fall colors and take pictures along Highways 550 and 145. 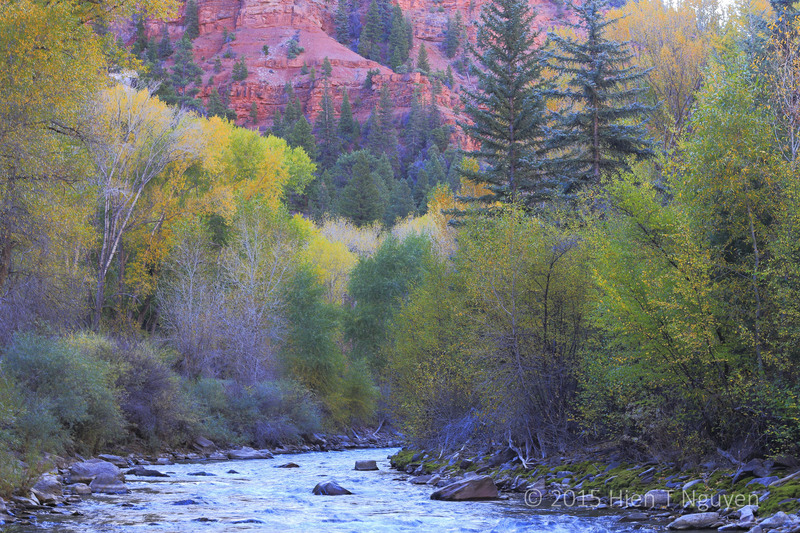 Early morning by the Uncompahgre River near Highway 550. It looked like a scene from a Western movie. 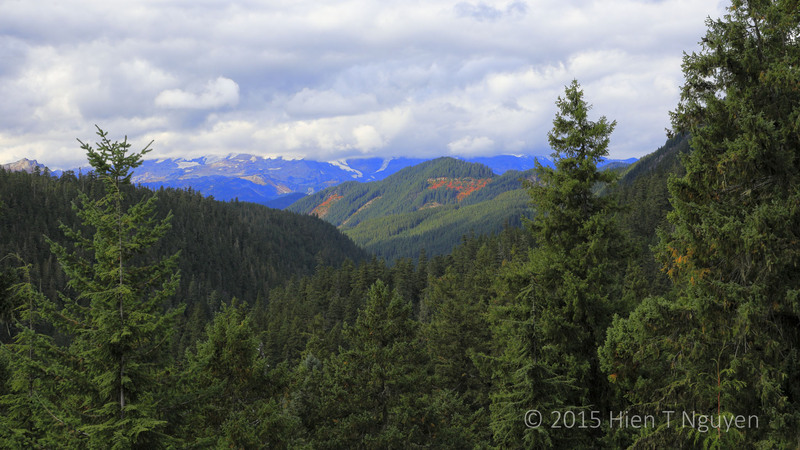 Partial view of Uncompahgre National Forest. 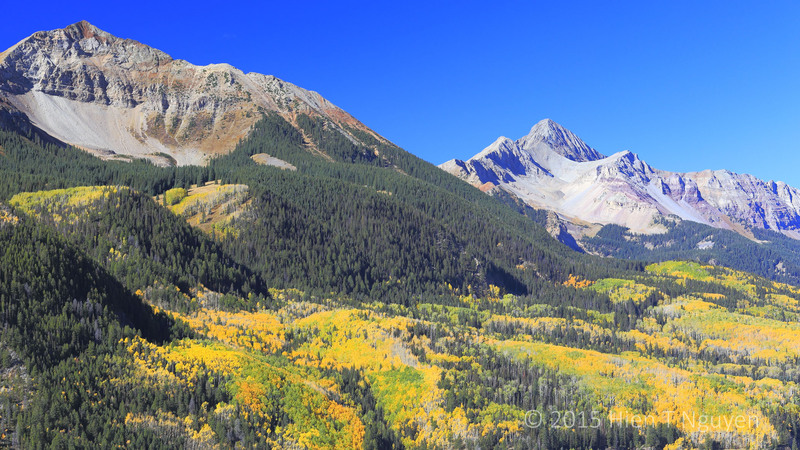 Fall colors below Sunshine and Wilson peaks. 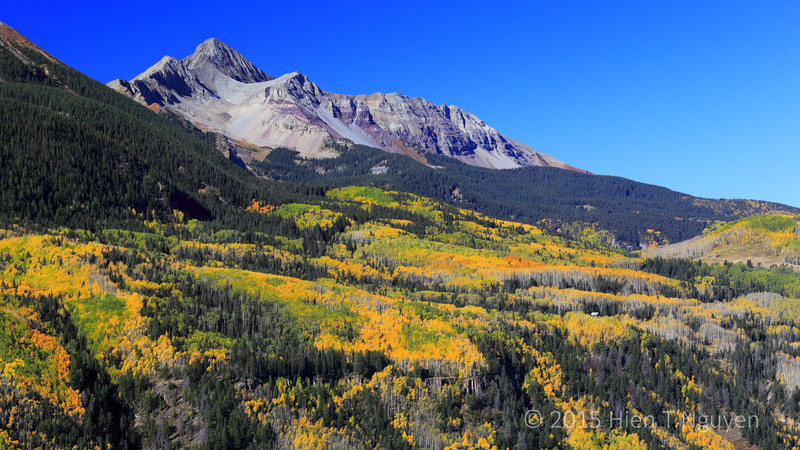 Looking up the mountains at Uncompahgre National Forest. Trout Lake at 9,802 ft elevation, about 15 miles from Telluride, CO. 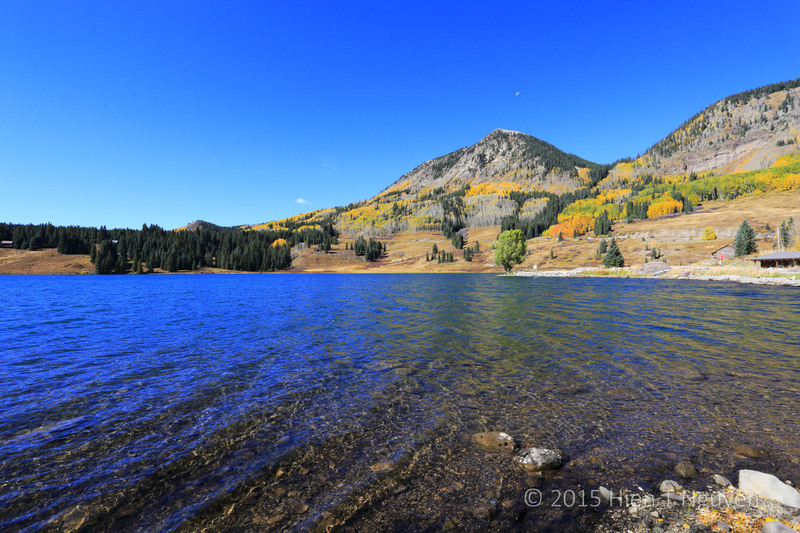 Historical footnote: Trout Lake is a natural lake that was dammed in the late 19th century to provide additional water for the Ames Hydro Electric Power plant near Ophir, CO. It became part of the AC/DC war between Thomas Edison, an advocate of DC current, who lost to George Westinghouse and Nikola Tesla who were AC current promoters. Today we all use AC electricity. Agriculture Information Station for the San Juan National Forest along Highway 145. 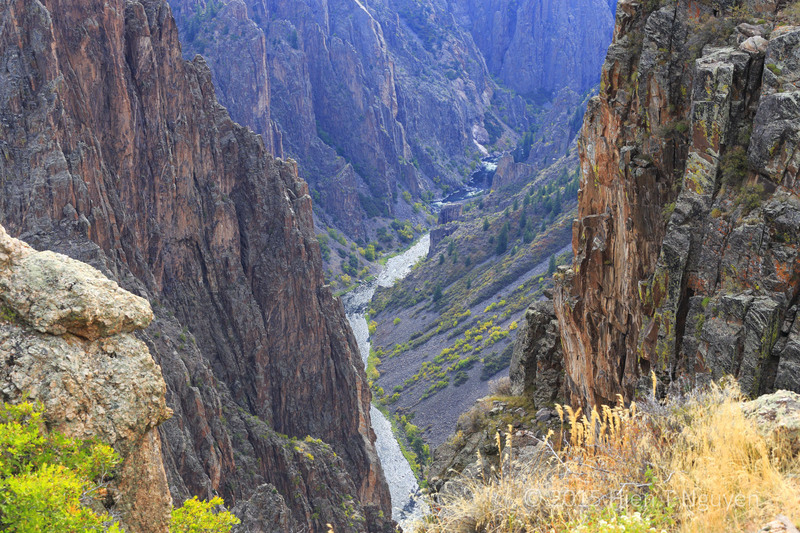 Black Canyon of the Gunnison owes its name to the fact that its gorge only receives 33 minutes of sunlight each day. It is not as massive as the Grand Canyon, nor as deep. 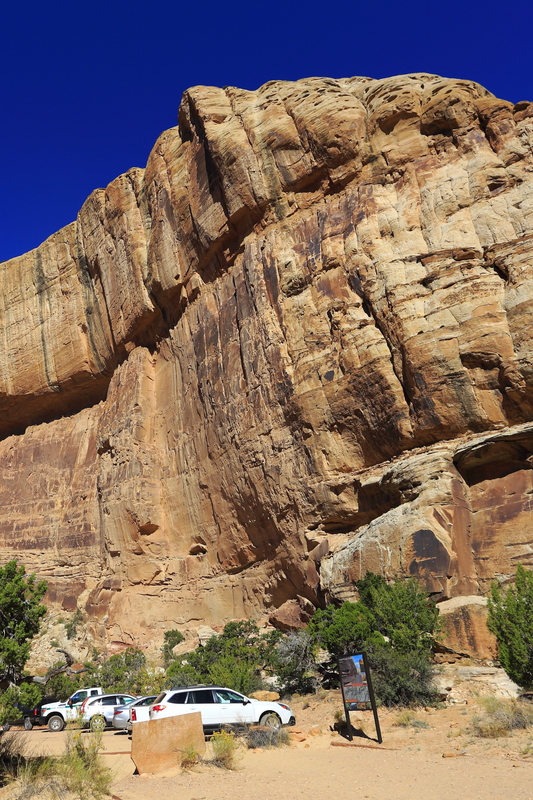 It is very narrow and its walls are the steepest of all the canyons I have ever seen. There is no way to hike down from the rim to the bottom. One could drive down a steep road, with a 16% grade, to the east end of the canyon, but there is no trail there to hike into the canyon. So we confined our visit to driving on the south rim and we hiked short trails to 12 overlooks to take pictures. Looking at North Rim from the South Rim at Black Canyon. 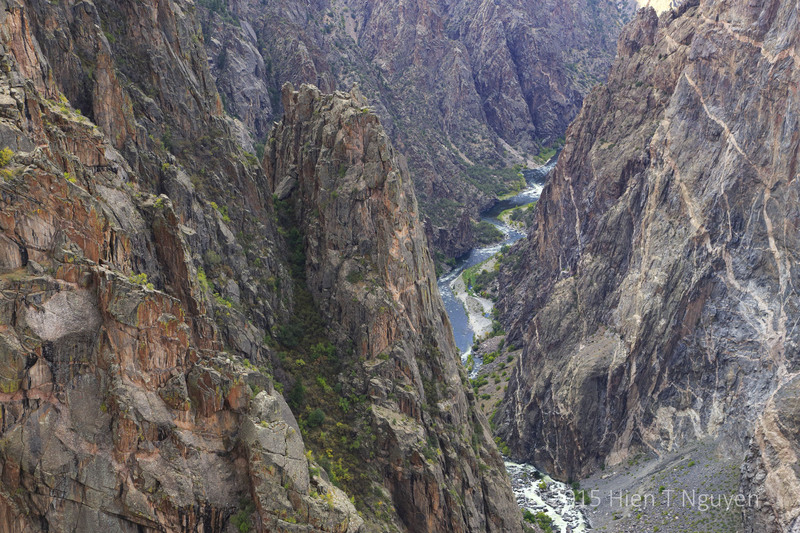 The Gunnison river flowing through Black Canyon. 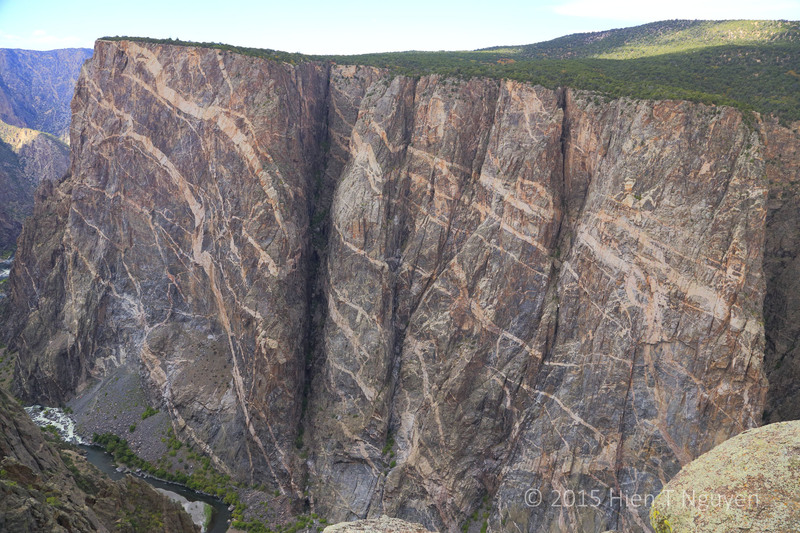 Another view of Black Canyon’s gorge. Painted Wall, the tallest cliff in Black Canyon. 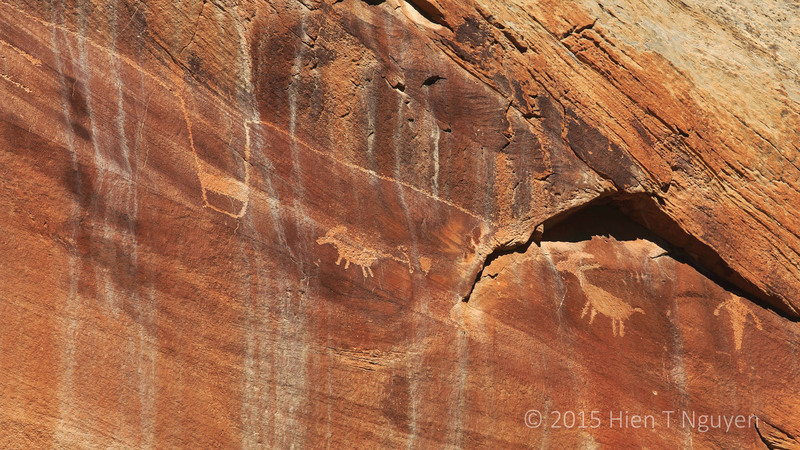 The patterns in the above photo look to me like giant petroglyphs carved by nature. However, they were created a billion years ago when molten lava inserted itself into cracks in the pre-existing rocks. It then cooled and became like 3-dimensional paintings. Once the park opened, the rest of the day went better and we managed to see almost all of the viewpoints. We did three small hikes which were not too strenuous. This part of the park had a lot of petrified wood which you will see in most of the photos below. 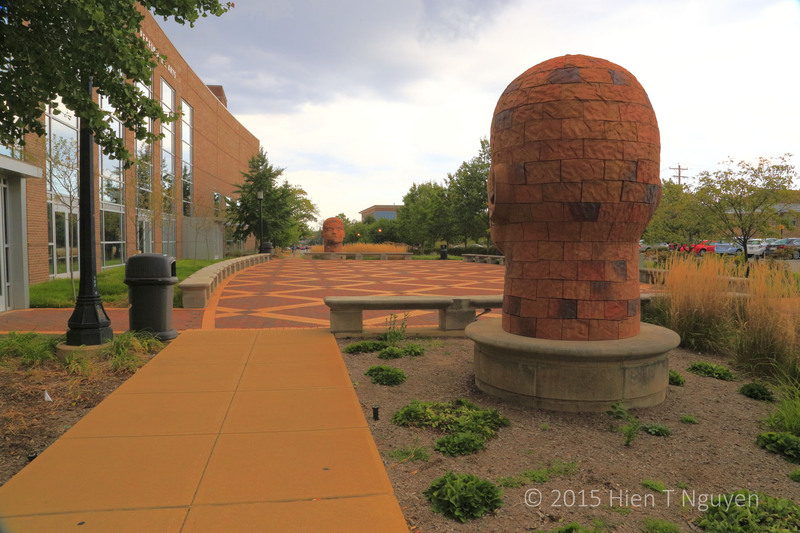 Some looked like rock, others still looked like wood, but they were all hard as … rock. View from the bottom of Blue Mesa, after a short hike down. The trail is paved, and on thre way up there is a stone bench to sit on and rest. Another view from the bottom of Blue Mesa. 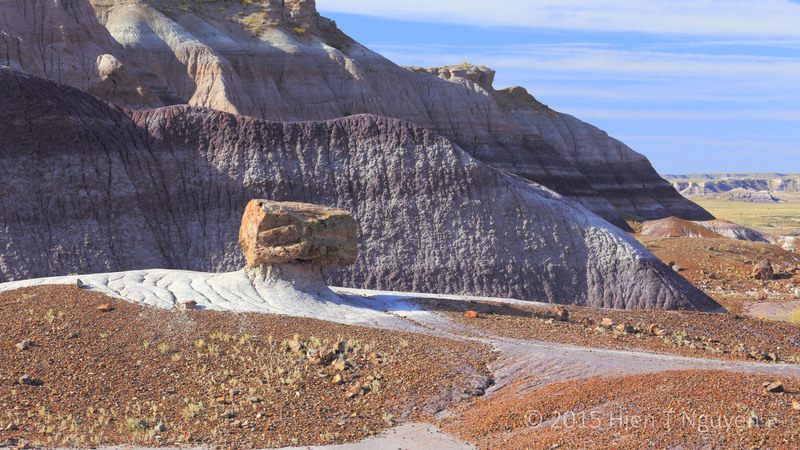 A log of petrified wood resting on a column of sedimentary rock. It was put there by nature. Looking out from a viewpoint named Tepees. 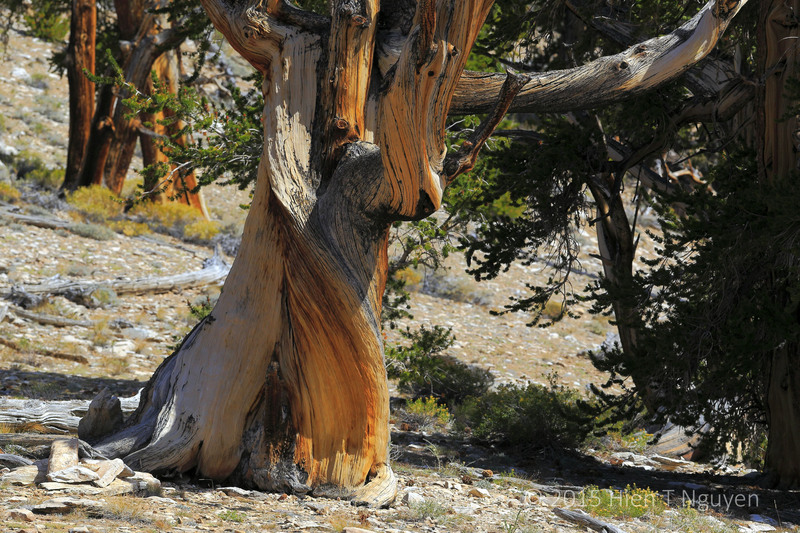 A long trunk of a petrified tree at Crystal Forest. 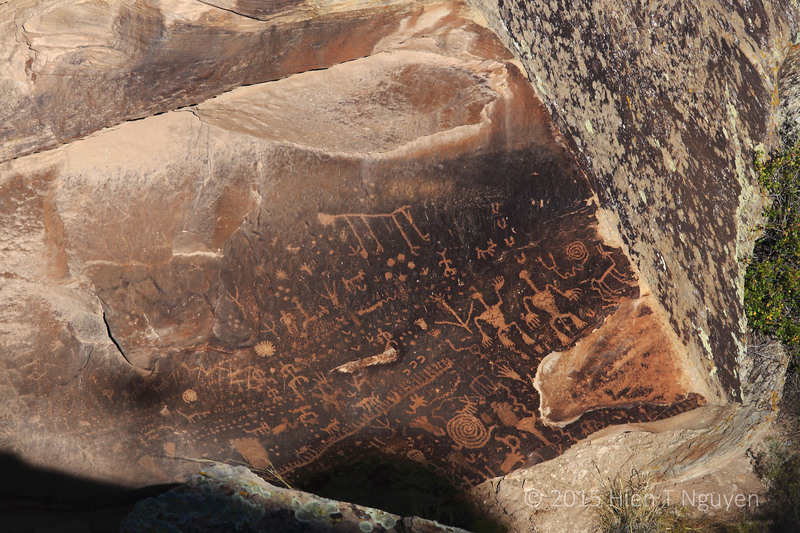 There were many petroglyphs created by ancestral Puebloans who lived in the area between 650 and 2,000 years ago. 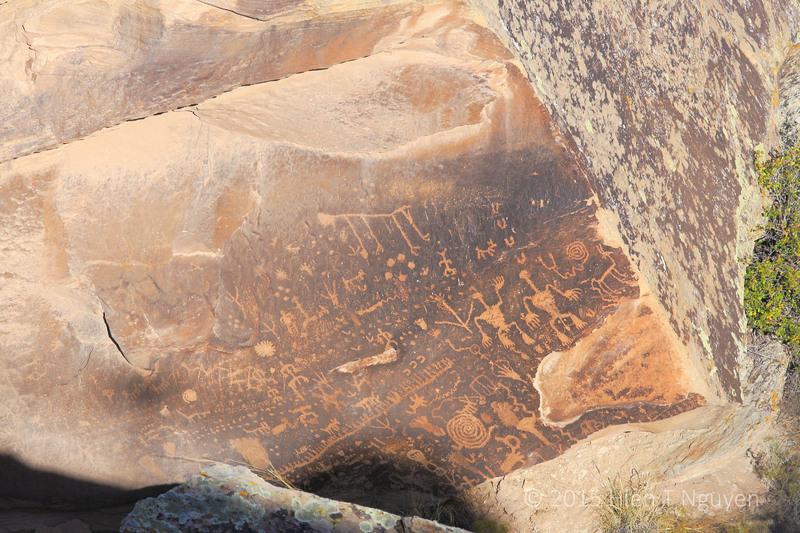 Newspaper Rock has more than 650 petroglyphs. 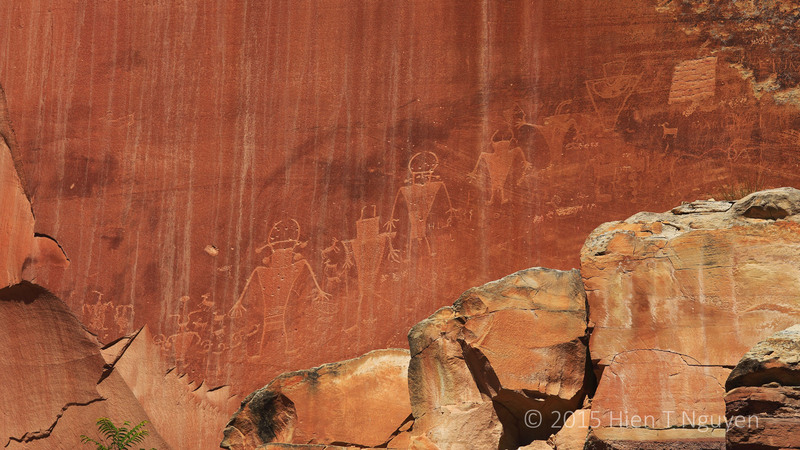 Other petroglyphs with mysterious depictions. Finally, I should mention this: in Holbrook we have been staying at the Wigwam motel where each room looks like a tepee. Inside there is a bedroom with two beds, a modern bathroom and shower, a heater an an air conditioner. The tepee is made of something hard like cement. 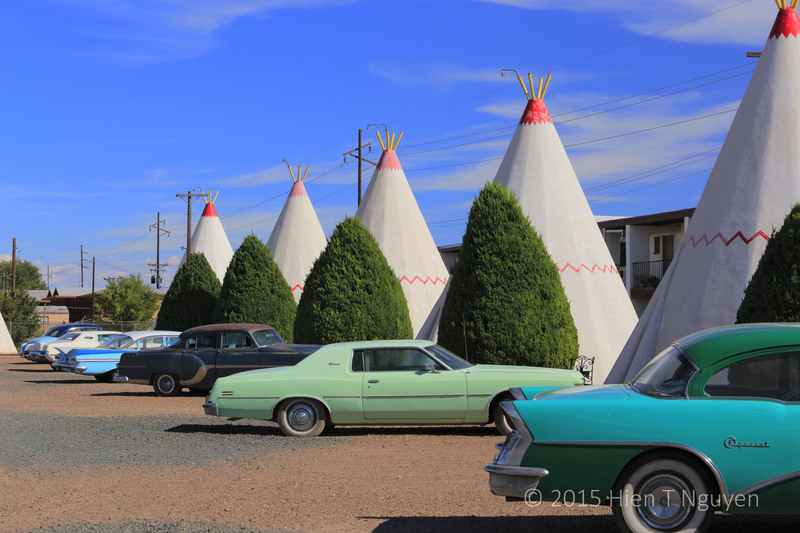 “Tepees” at Wigwam motel. “Antique” cars belonging to the owner are parked outside most of the units. Distance driven to date: 6,919 miles. 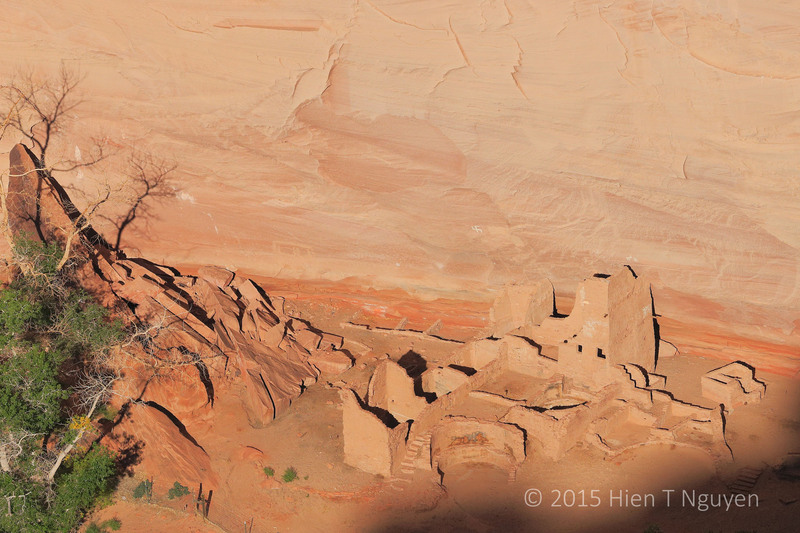 We spent a full day at Canyon de Chelly National Monument within the Navajo Nation in northeast Arizona. The town of Chinle where we stayed was only 2.5 miles away. It was quite an experience living there among the Navajos who constitute over 90% of Chinle’s population of about 5,000. 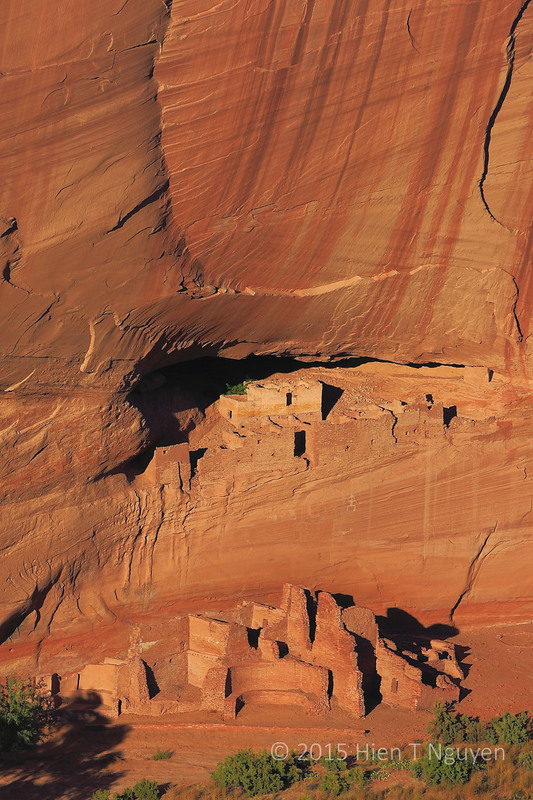 Canyon De Chelly (the Navajo name is Tsegi) is famed for its deep canyons, steep rock walls, and ruins of houses where Puebloan people had built and lived in from 750 to 1300 CE. I tried to capture that in the following photos. 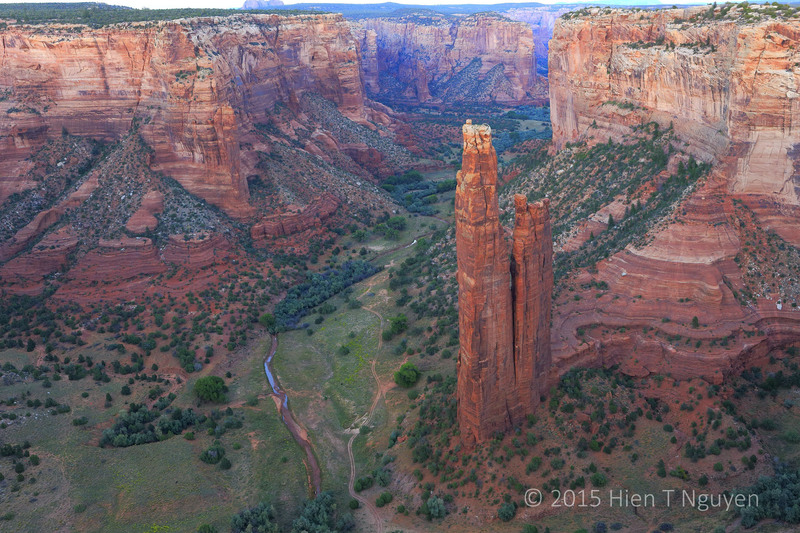 Spider Rock at Canyon De Chelly. 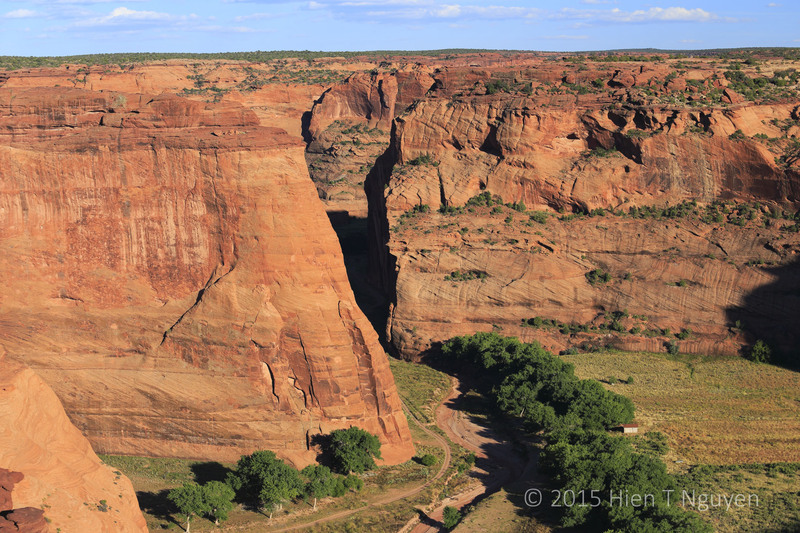 View of Canyon De Chelly. Yucca caves at Canyon De Chelly. 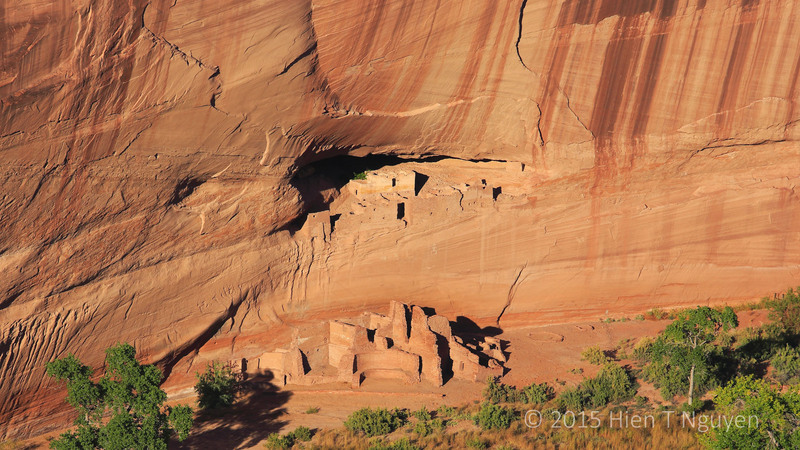 Antelope House ruins at Canyon De Chelly in early morning. 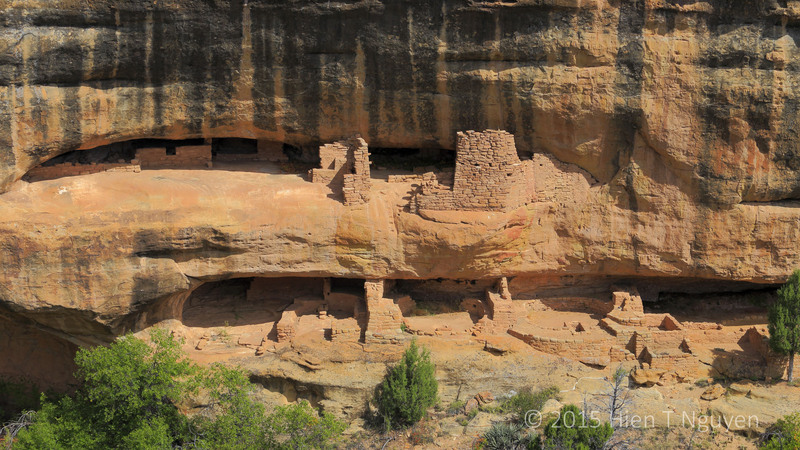 White House ruins at Canyon De Chelly in late afternoon. Capitol Reef National Park is not as popular as other national parks, but I made my second visit there today. This is the high season so the park was full of visitors from campers and hikers to people who are just passing through. However, the crowds were not like those usually seen at Bryce Canyon or Grand Canyon. 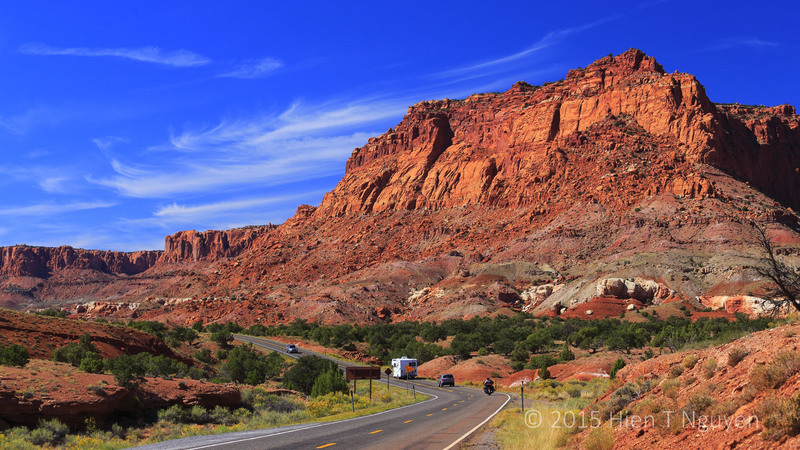 Near the entrance to Capitol Reef National Park. The Egyptian Temple at Capitol Reef. I took many pictures of well known and spectacular rock formations in the park, but I think the following may be more interesting. 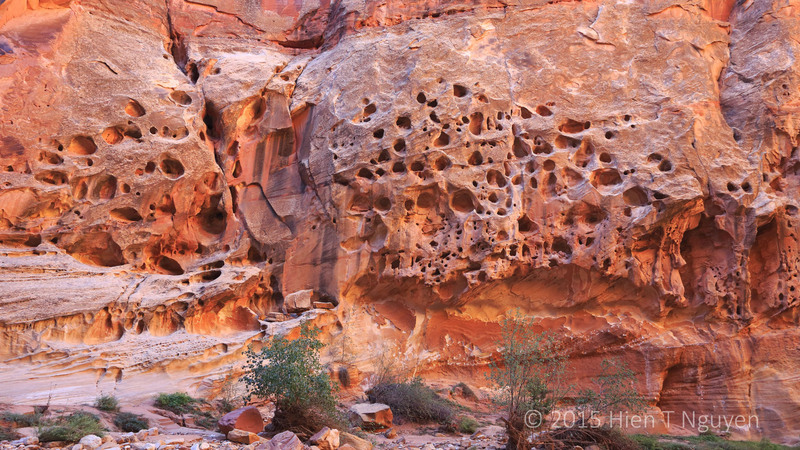 Holes caused by erosion in rock wall at Capitol Reef. If you look carefully you will see some holes have small rocks in them. The Fremont people lived in the area from about 600 to 1300 CE. They carved very nice petroglyphs into the rock walls along the Fremont river. 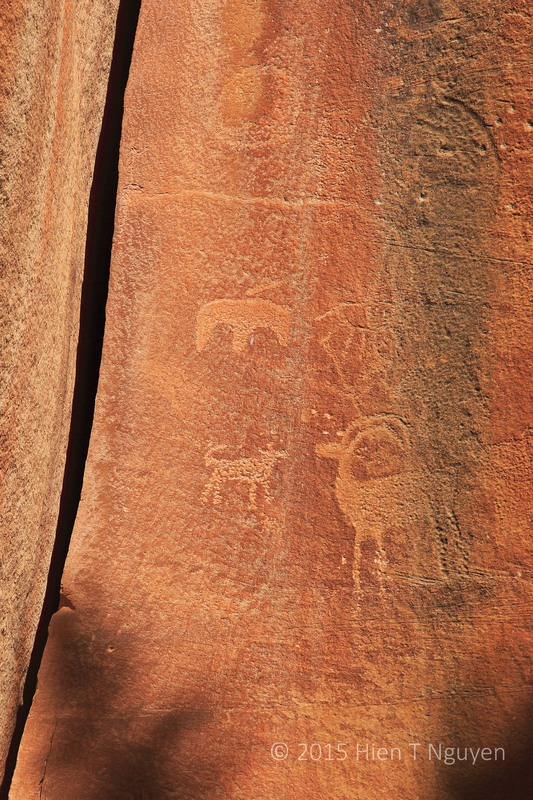 Fremont petroglyphs on rock wall at Capitol Reef. 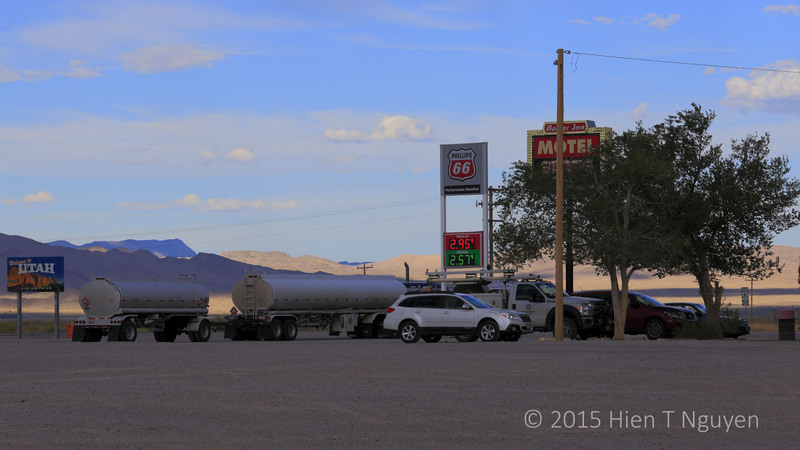 Today we went to Baker, a small town in Nevada at the entrance to Great Basin National Park. 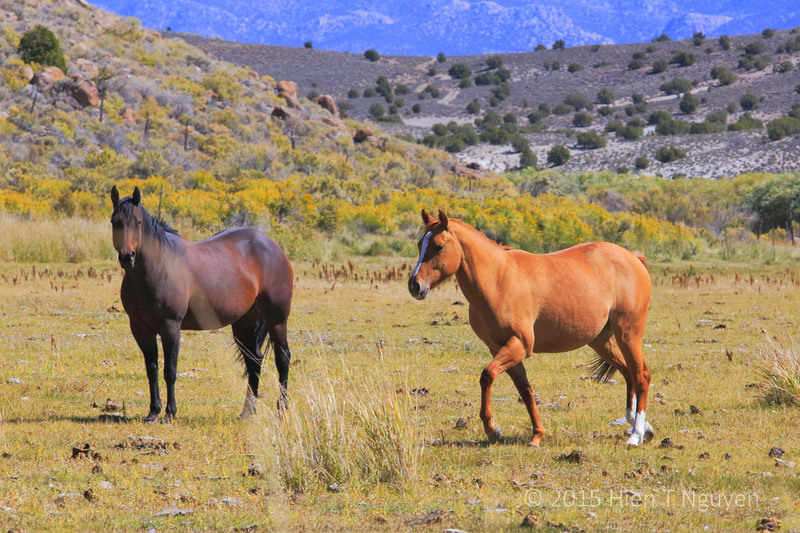 On the way we saw some beautiful horses grazing on a field near Ely, NV. 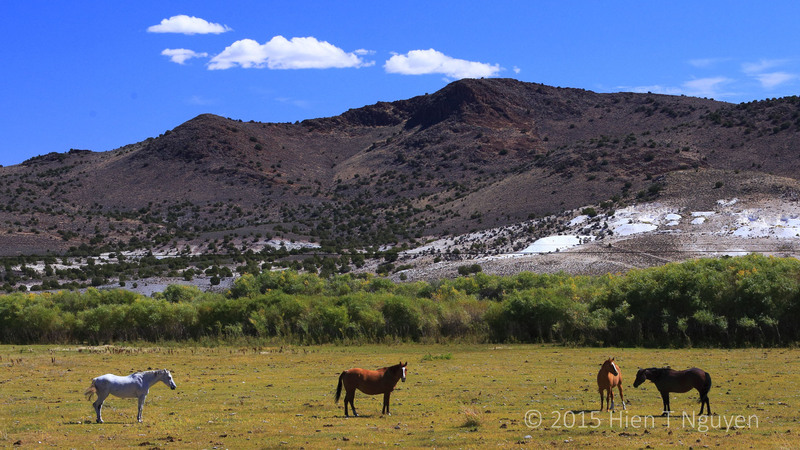 Horses on a field near Ely, NV. Horses on field near Ely, NV. 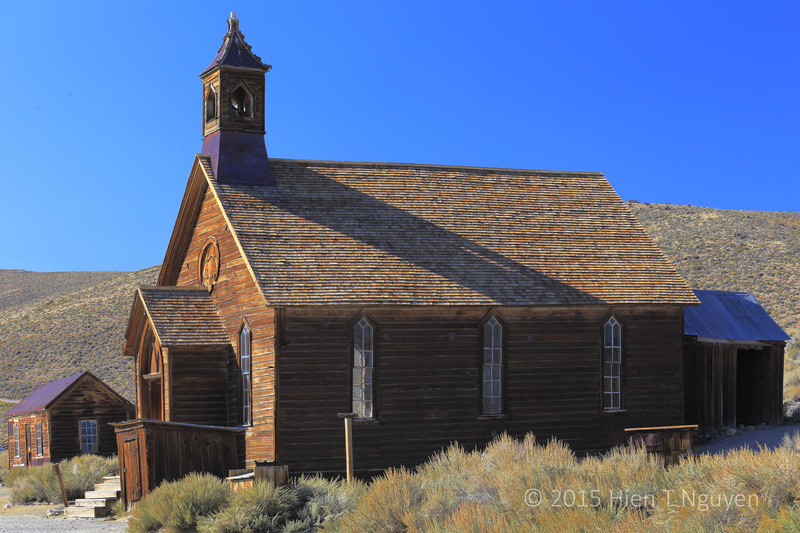 Today was a rather long drive from Klamath Falls, OR to Bishop, CA, so we had only one sightseeing stop: Bodie, a mining ghost town 100 miles north of Bishop. A sizable deposit of gold was discovered there in 1876, and Bodie became a booming town with up to 7,000 inhabitants and 2,000 buildings. 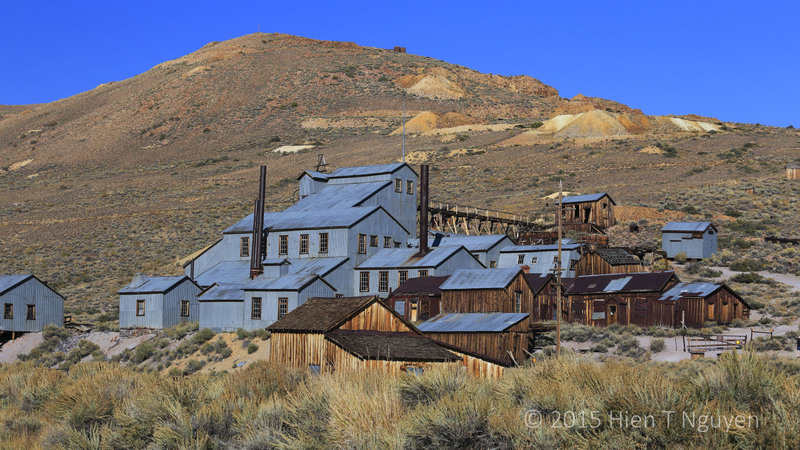 However, by the late 1880’s the gold boom was over for Bodie. 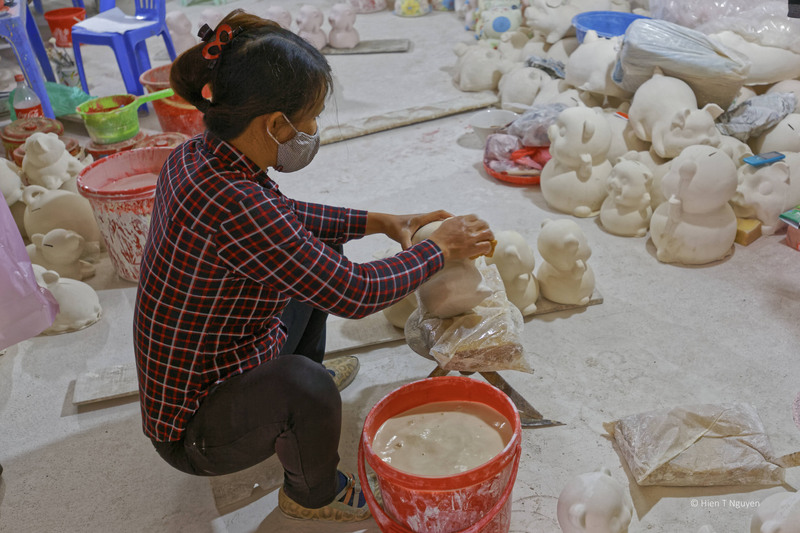 It lingered on as an inhabited town as miners moved elsewhere. By 1943 there were only 3 people left, and today it is an authentic ghost town, the centerpiece of a California State Historic Park. I tried to capture the essence of Bodie in the following shots. 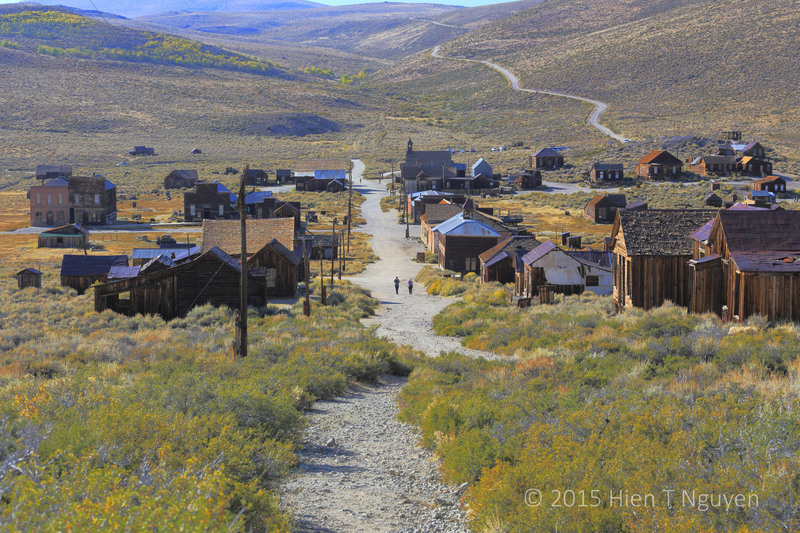 Bodie and what’s left of its main street. The road on the hill is an unpaved and rough road that we had to drive on to get to Bodie. 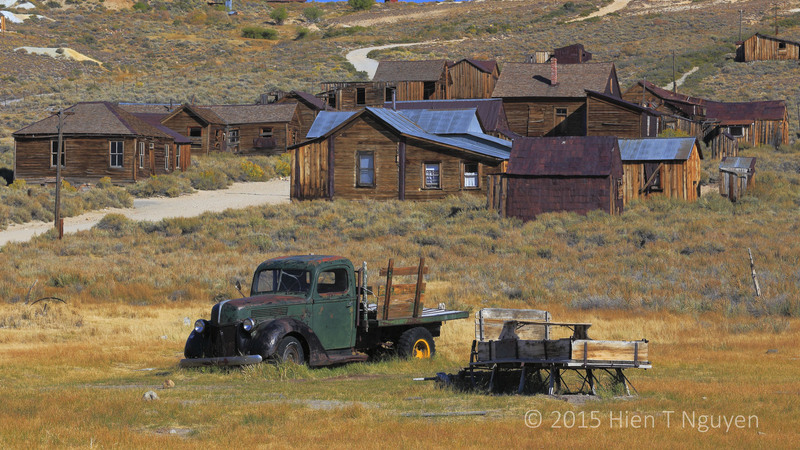 Abandoned houses, truck, and equipment at Bodie. 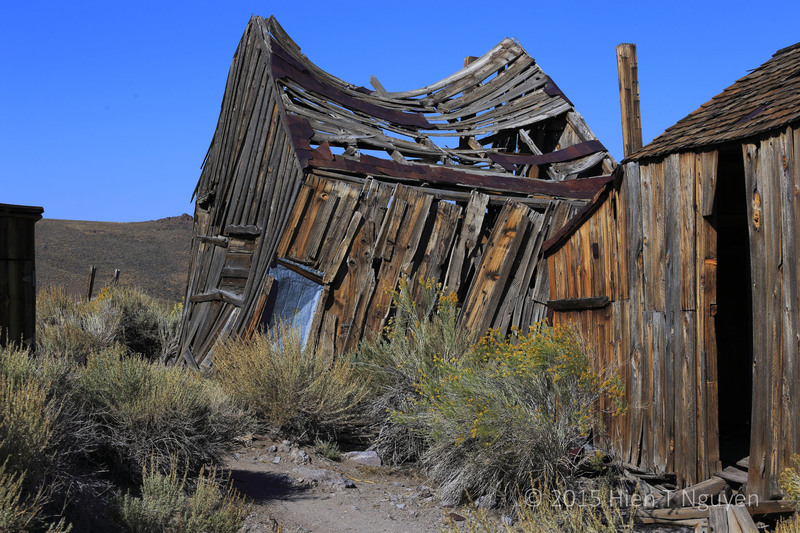 Remains of a house at Bodie. 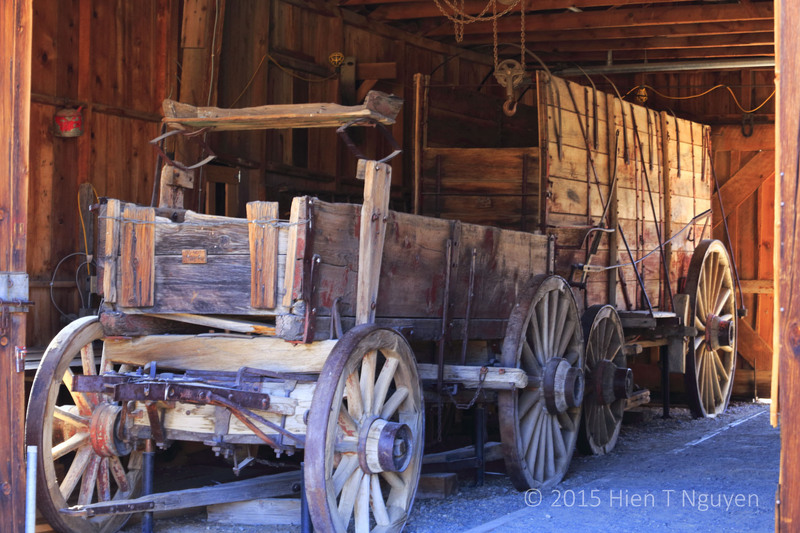 Wagons kept inside a barn at Bodie. Crater Lake, 1/4 of it. 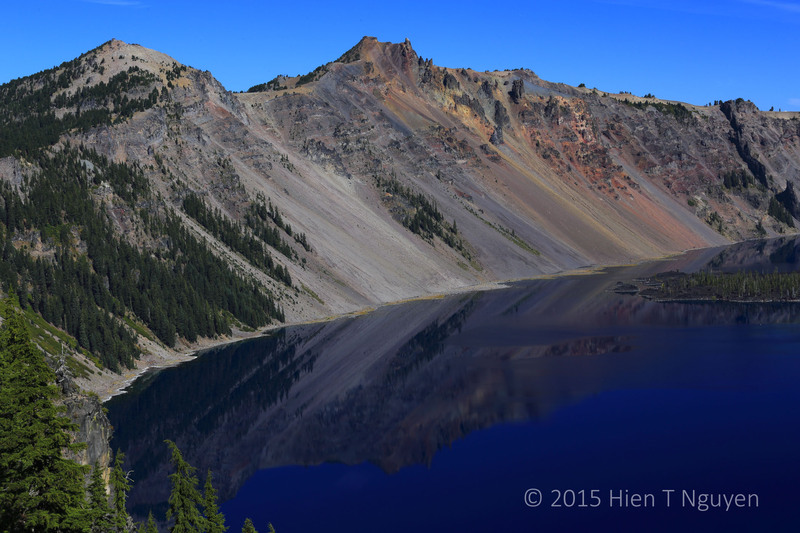 Today we went to Crater Lake, a lake formed inside the collapsed top of Mt Mazama. 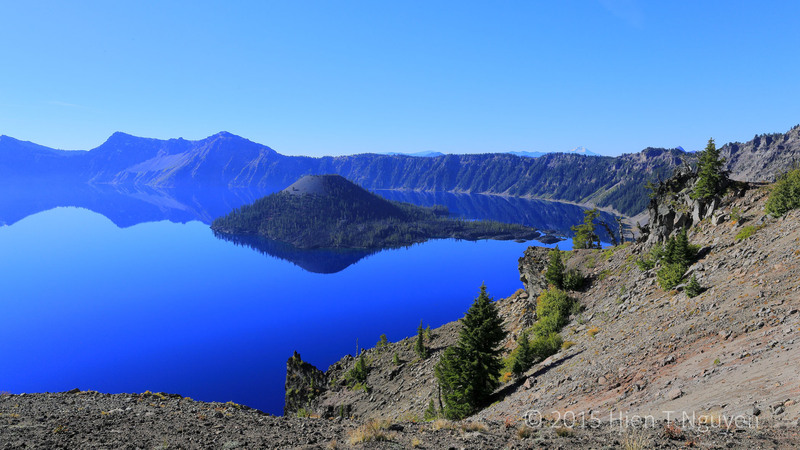 The lake is the deepest (1,946 ft) in the United States, and its blue color is legendary. Unfortunately, there was a bicycle event in the park which resulted in 3/4 of it being off limits to us. Very disappointing to say the least. 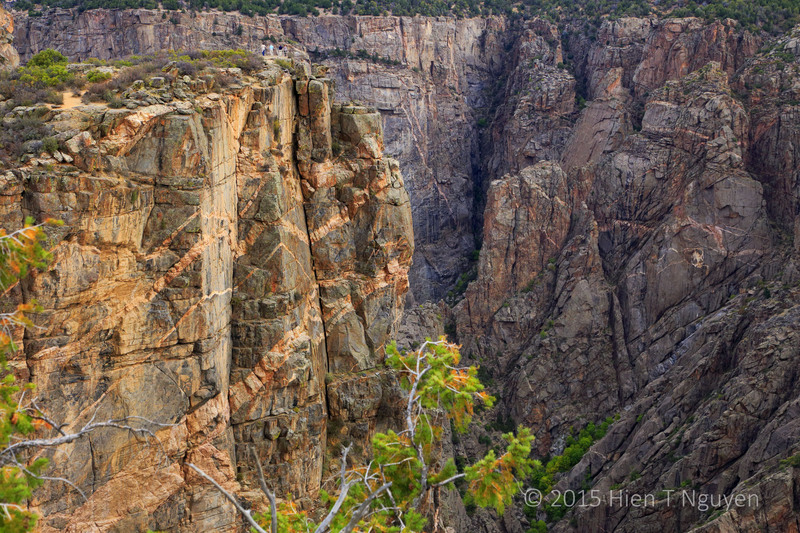 The following photos were taken from a small part of the West Rim Drive. 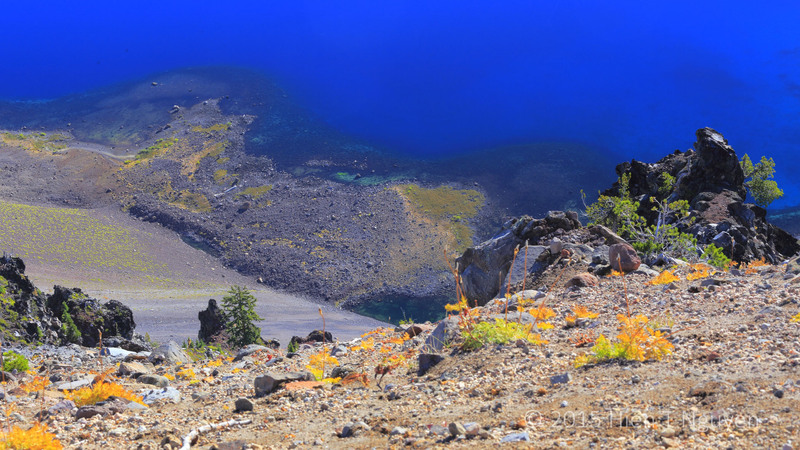 A section of Crater Lake rim. 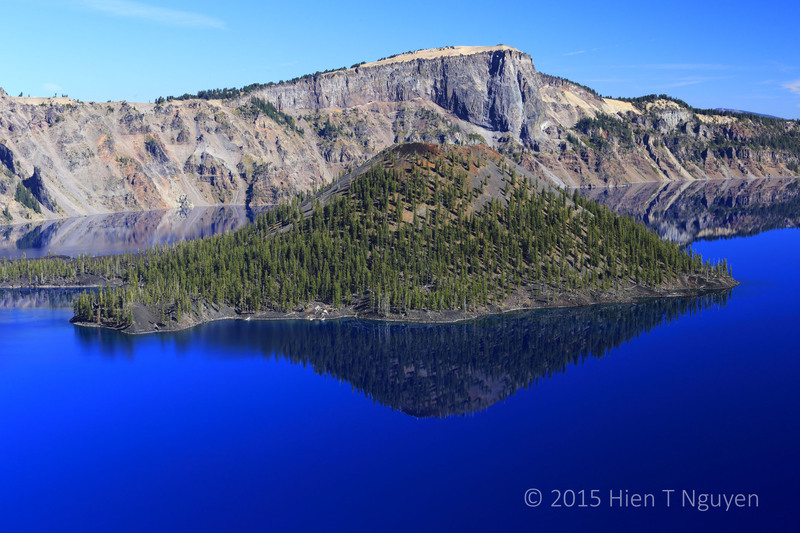 Looking down at the shoreline of Crater Lake. Mt Thielson an extinct volcano near Crater Lake. 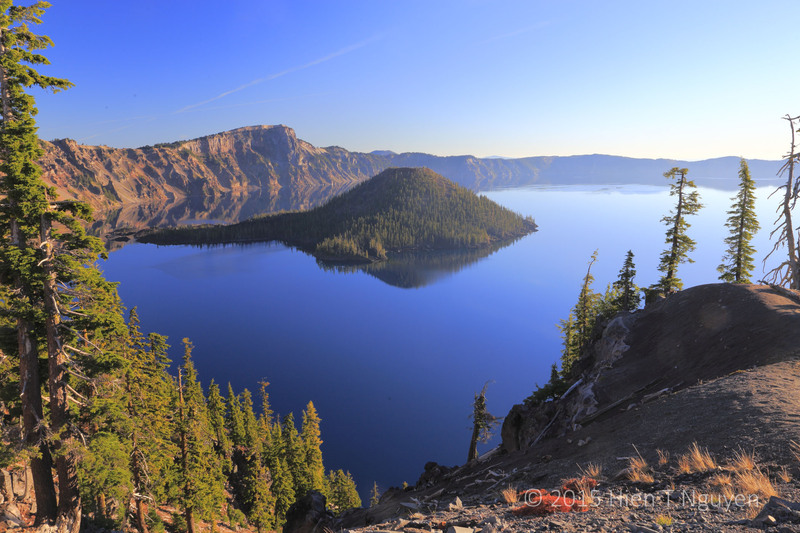 Today I drove from Packwood, WA to Klamath Falls, OR which will be our base for visiting Crater Lake National Park. The drive was 422 miles and we didn’t make too many stops. 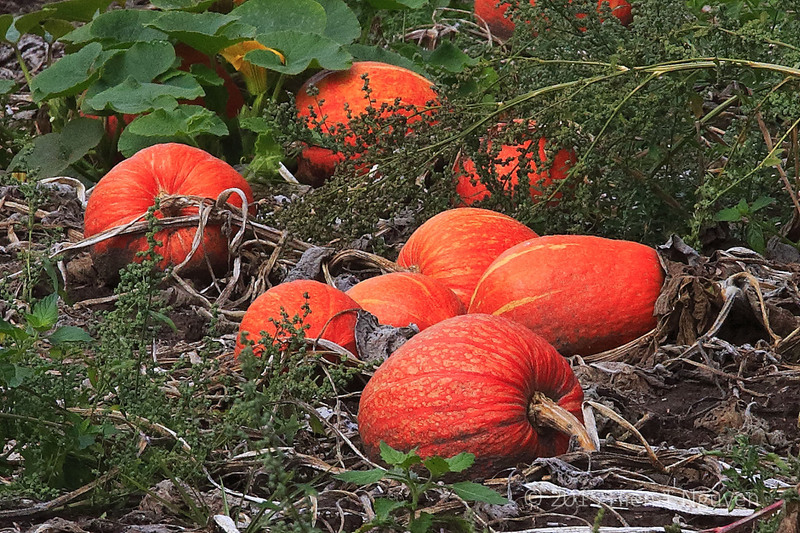 At a rest area along Interstate 5, there was a pumpkin field that begged for its picture to be taken. 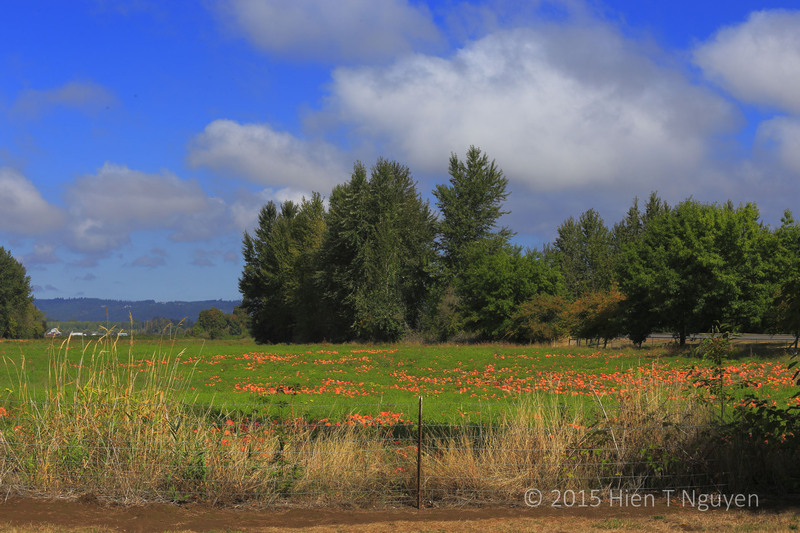 Pumpkin field along I-5 in Oregon. 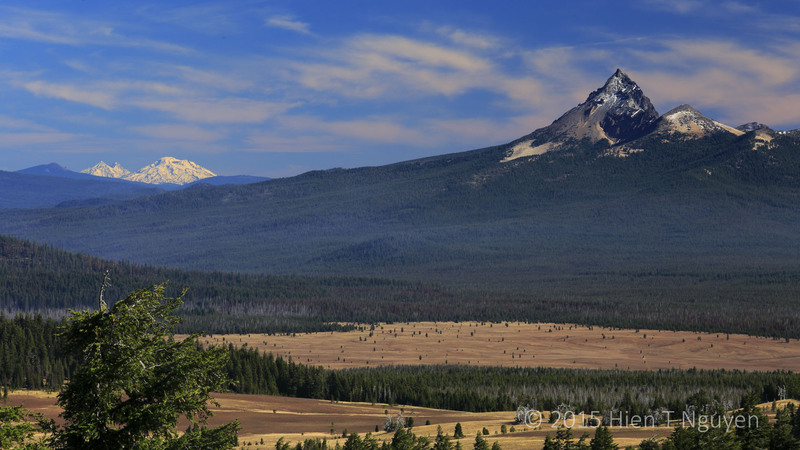 We took the Willamette Highway (Oregon Route 58) to go to Klamath Falls. 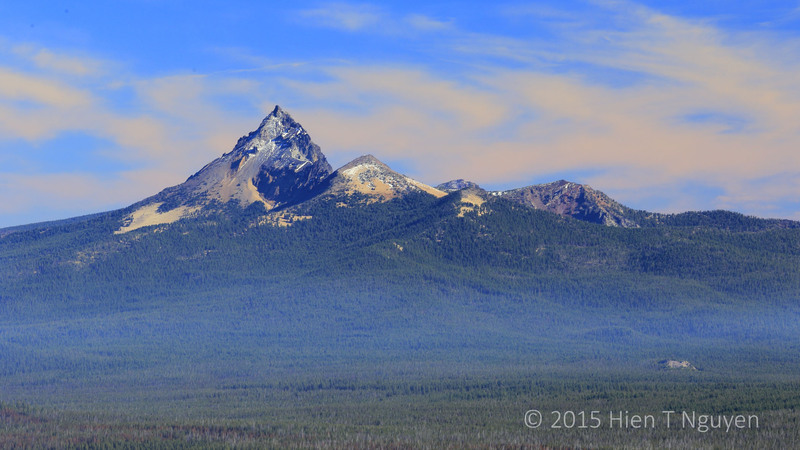 At an elevation of 5,000 ft on that highway we passed by Diamond Peak, an ancient volcano covered with snow. With a height of 8,743 ft, it is quite an impressive sight. 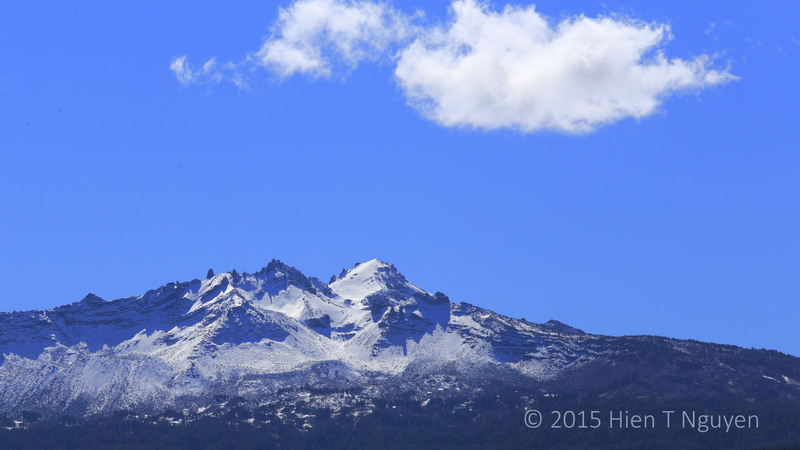 Diamond Peak, an old volcano covered with snow as seen from Route 58. Distance traveled to date: 4,303 miles. 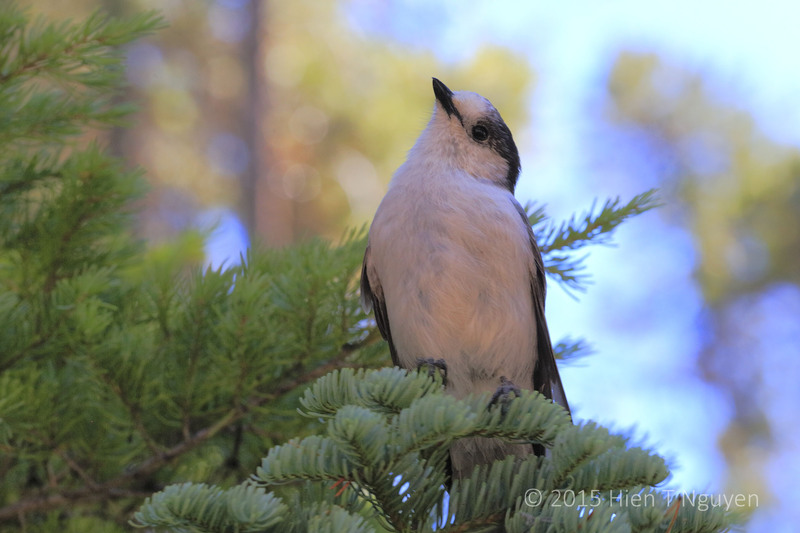 We left Liberty Lake to go to Packwood at the south end of Glacier National Park. It was a relatively short drive (290 Miles), but it turned out to be longer than planned because we stopped at so many points. Here are the main ones. 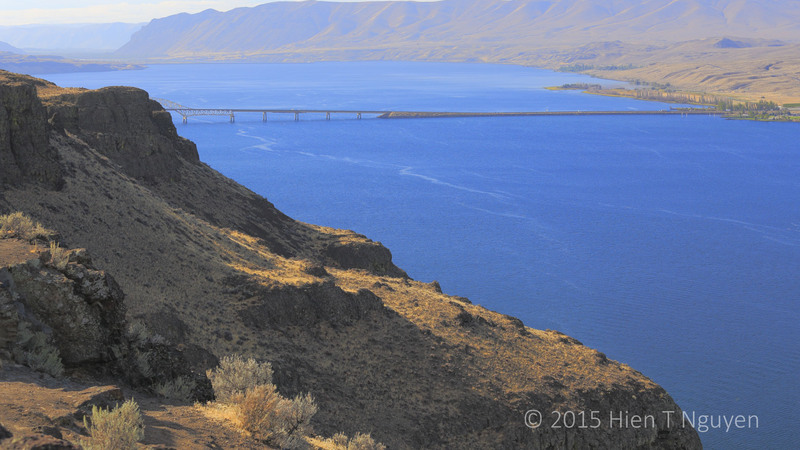 Columbia River and Vantage Bridge as seen from a Scenic Overlook. 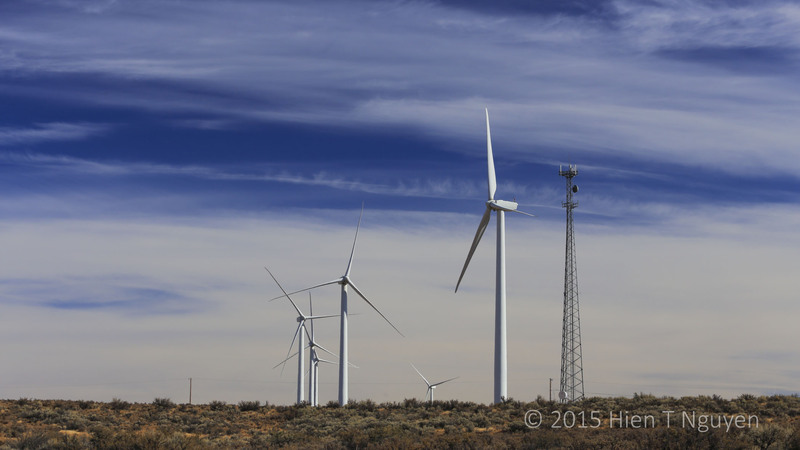 Windmills near Ryegrass rest area, after crossing Columbia River. Raging Tieton River near White Pass Scenic Byway. Mt Rainier as seen from a view point about 15 miles away, its top covered by clouds. 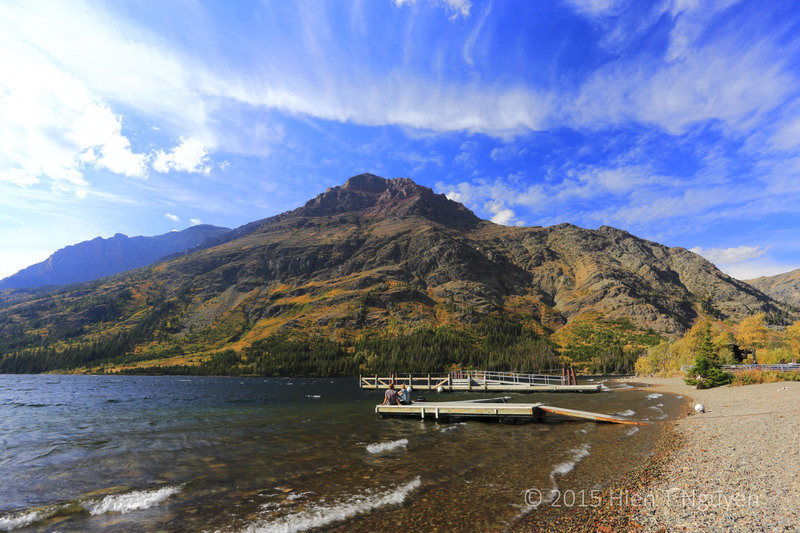 Many Glacier is said to be the most beautiful part of Glacier National Park. This morning, we left our hotel at 6 AM to go from East Glacier Park to Many Glacier. It was still quite dark and the road very windy, requiring my full concentration. However, as we approached the town of St Mary, the sun peeked out from a thick fog with its rosy fingers, to borrow Homer’s words. After that, we went on to Many Glacier, but the sun insisted on hiding behind thick clouds for the rest of the day. 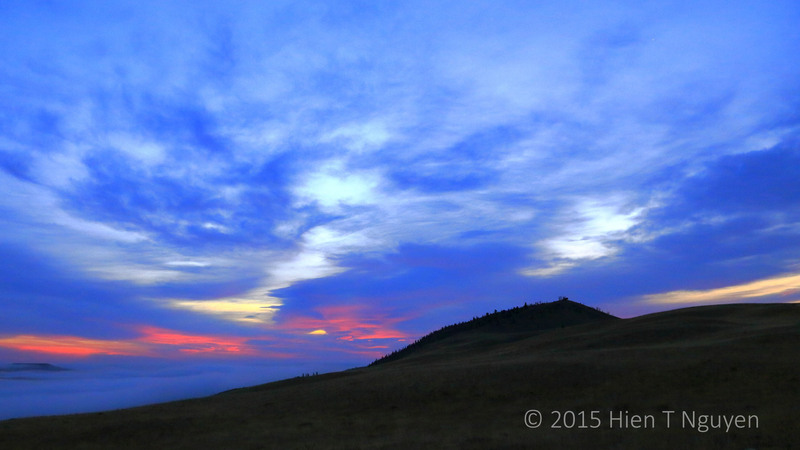 None of the photos I took afterwards had the same intensity of sun and colors as yesterday (see Two Medicine). 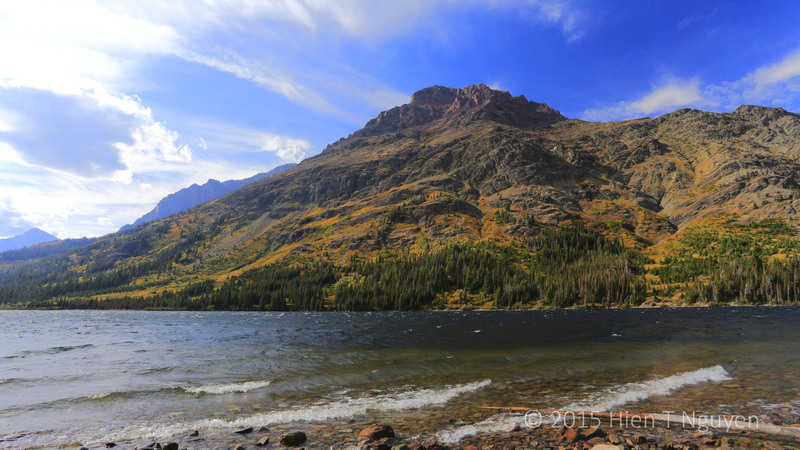 Swiftcurrent Lake at Many Glacier. Afterwards, the same lack of sunlight dampened our mood while driving through Going-to-the-Sun road, the famed curvaceous highway that led from St Mary to West Glacier. There were many cars and buses, and each scenic spot attracted people with their cameras and cell phones ready to capture the scenery. 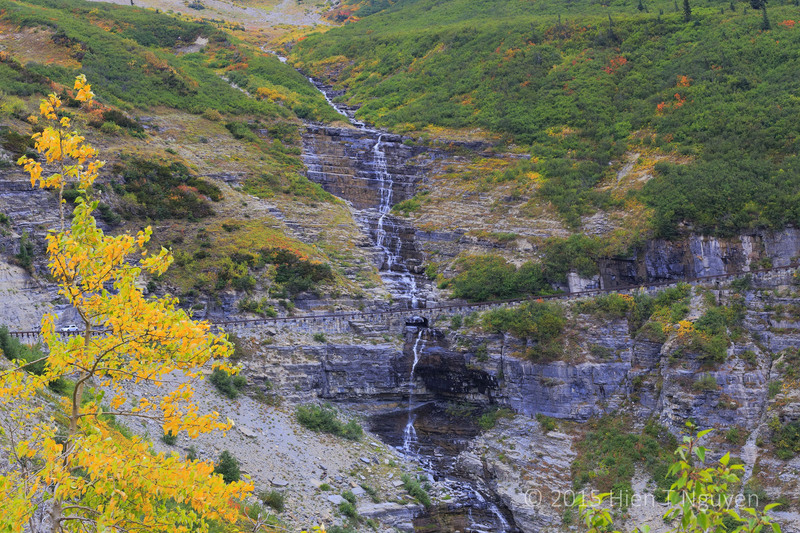 But I quickly decided not to shoot mountain peaks or vistas, and concentrated instead on some mini waterfalls along Going-to-the-Sun road, each framed by trees in full fall colors. They looked much better than washed out skies. Distance travelled so far: 3,005 miles. We stopped for the night in Whitefish, MT. We arrived in East Glacier Park, MT in mid afternoon Sunday. The hotel had no wireless internet, so I’m a day late in my postings. Along the drive we saw several herds of wild horses, lots of Angus cattle, and lots of hay bales, presumably to feed the cattle and maybe even the horses. I had to stop to take some pictures of the ubiquitous hay bales. 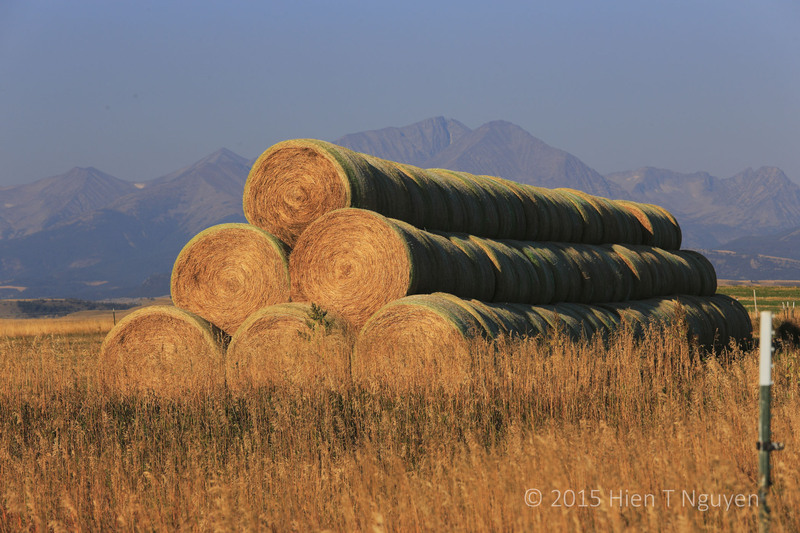 Hay bales on a Montana field. After checking in, I drove right away to a part of Glacier National Park called Two Medicine for a lake of the same name. It was very windy but the sky was a brilliant blue with lots of white clouds of all sizes and shapes. 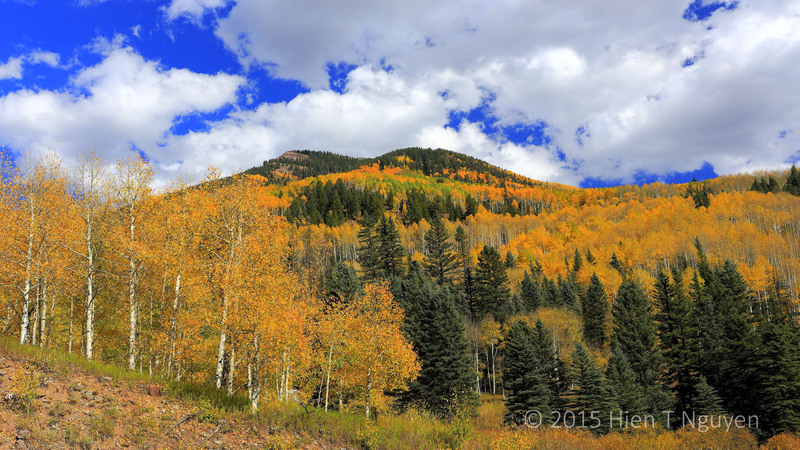 The leaves had begun to turn yellow on the aspens along the road leading to the lake. It was an unforgettable landscape as you can see in the photos below. Two Medicine lake in Glacier National Park. After Badlands, today we had a busy day visiting the following places on our way to Glacier National Park in Montana. 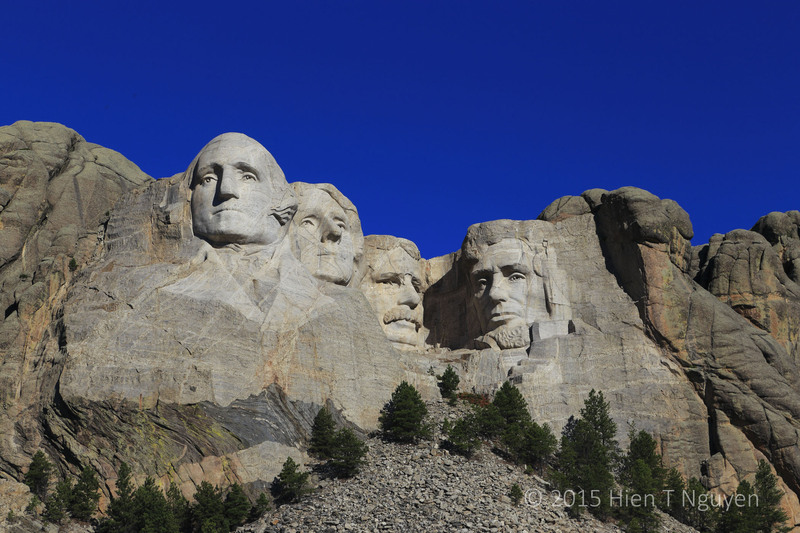 First was an obligatory visit to Mt Rushmore National Memorial in Keystone, SD. 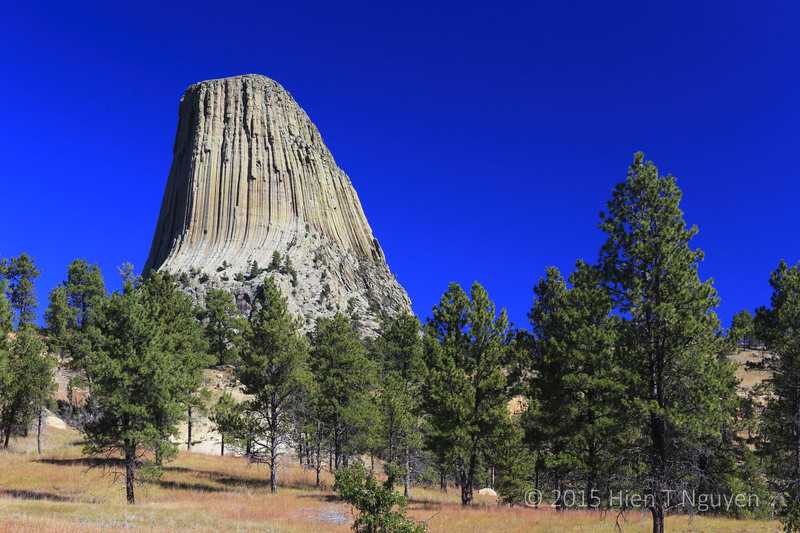 Next was Devil’s Tower, about two hours away in the nearby state of Wyoming. 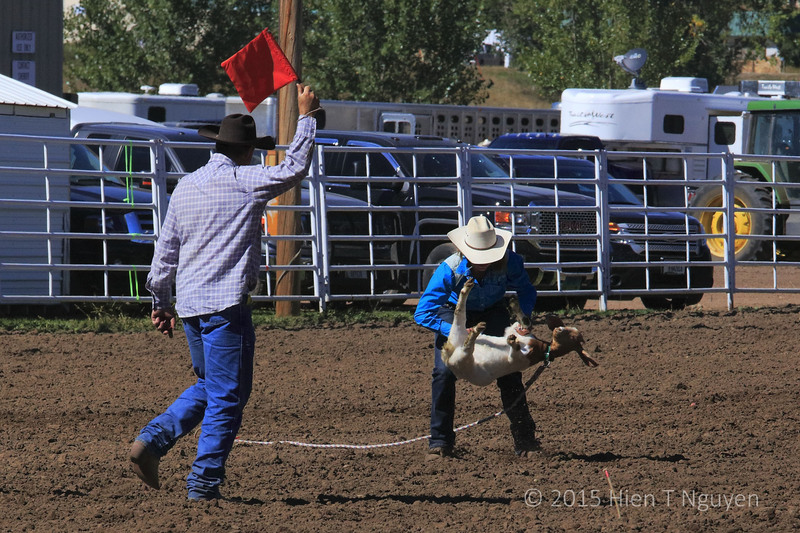 We continued on to Montana, where at a lunch stop in Broadus, MT (population 387) we briefly watched a local high school rodeo. 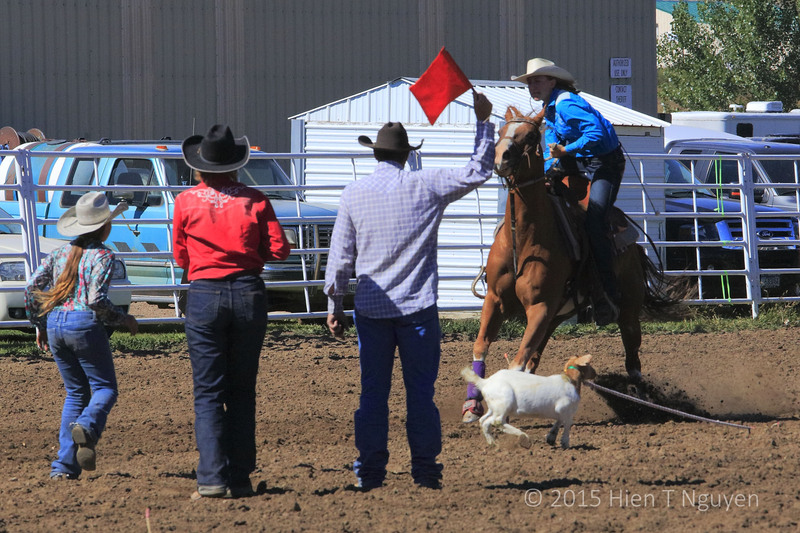 Cowgirl jumping off horse to catch and tie a goat. We then went to Little Big Horn National Monument, where some wild horses were grazing. 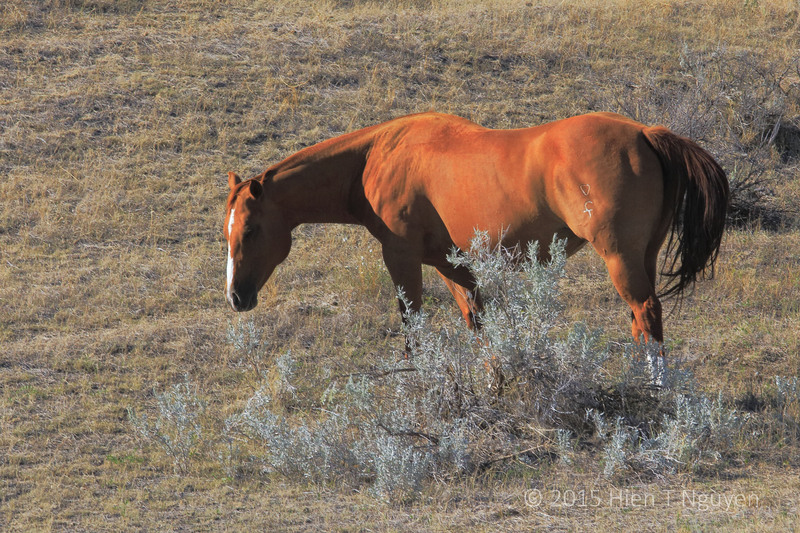 Wild horse at Little Big Horn Battlefield National Monument. Distance travelled today: 510 miles. 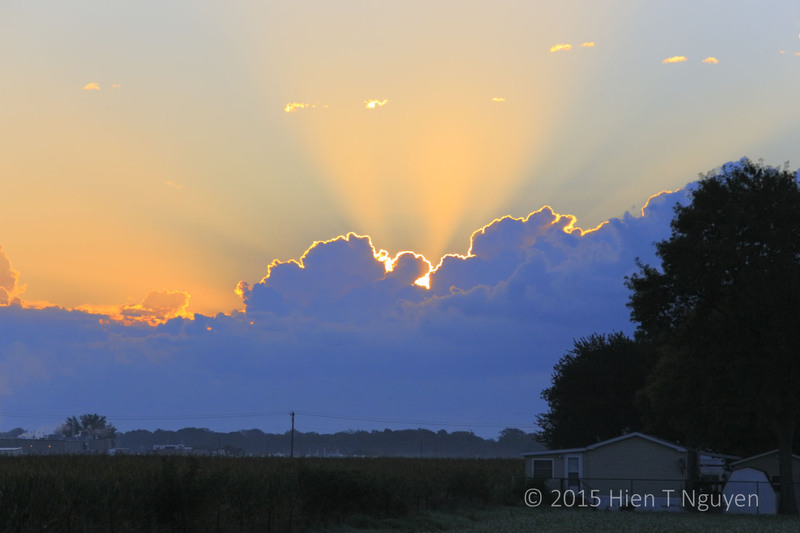 We left Fort Dodge, IA yesterday morning after admiring a glorious sunrise behind our motel. Sunrise over Fort Dodge, IA. Once we reached I-90, it was an easy drive from East to West, in a virtually straight line, bordered by immense fields of corn, soybean, sunflowers. 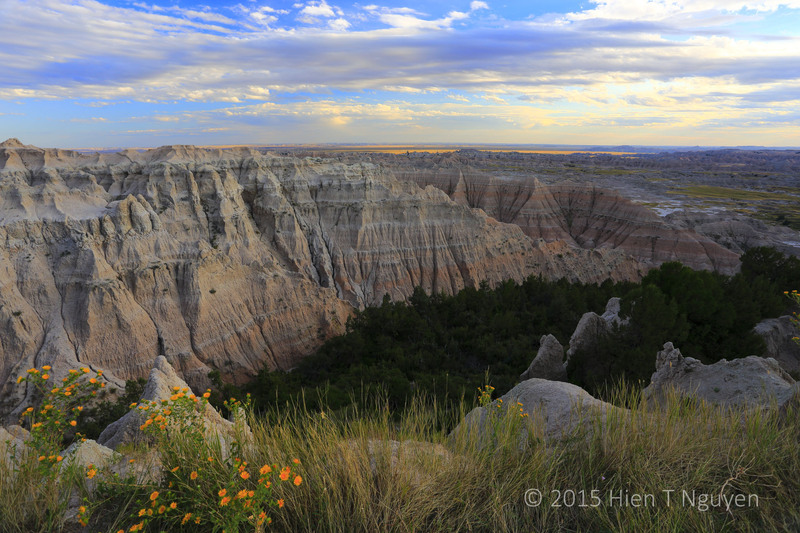 We arrived in Wall, SD in early afternoon and went straight to nearby Badlands National Park to try to capture the sunset. This morning we woke up at 4 AM and went to wait for the sun to rise. View from Pinnacles Overlook in late afternoon. 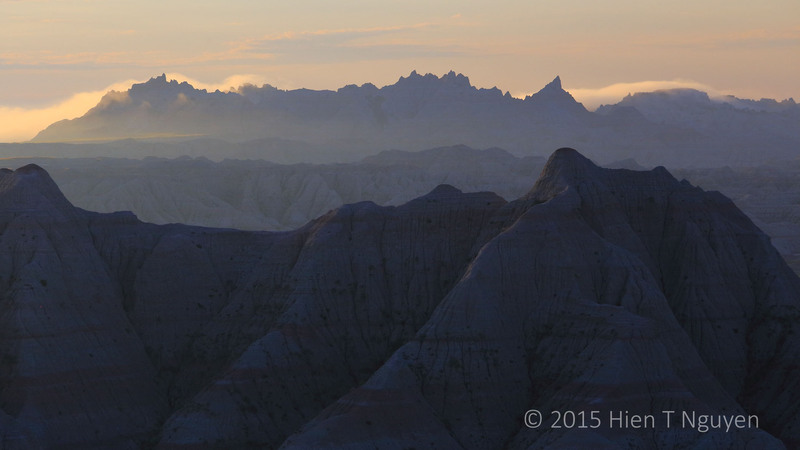 Badlands sunrise from Panorama Point. 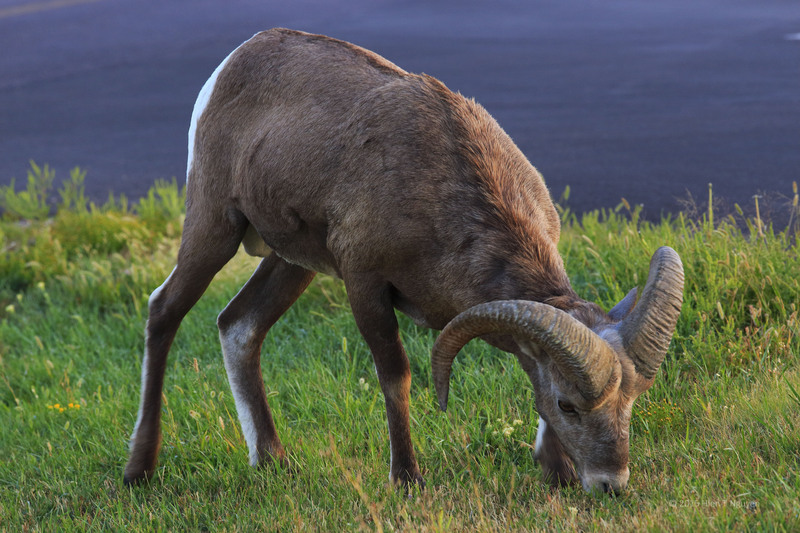 Bighorn Ram at Badlands grazing a bare 15 ft from where I stood. Near the town of Wall, SD. 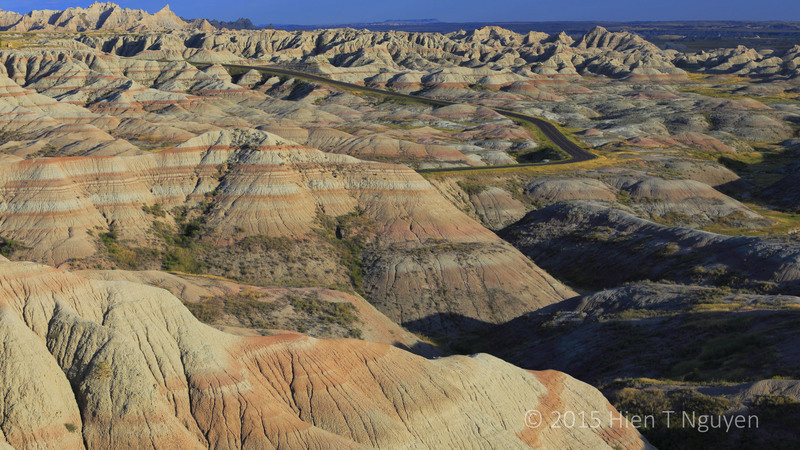 This is actually outside of Badlands . Badlands is an underrated national park which is very accessible to everyone of all ages, from casual visitors to dedicated hikers. Its rugged pinnacles and canyons are made of layers of sediments and volcanic ashes which are constantly being eroded by the forces of nature. Thus the view will change from year to year, and you’ll need to be there to really appreciate its beauty. Miles driven to date: 1,954 miles. First stop on our road trip today was Mill Run, PA where, between 1936 and 1939, Frank Lloyd Wright built his famous Falling Water house for the Kaufmann family. I have wanted to visit this masterpiece for many years, and it did not disappoint even though temperatures were in the 90’s and the water falls did not have a lot of water.